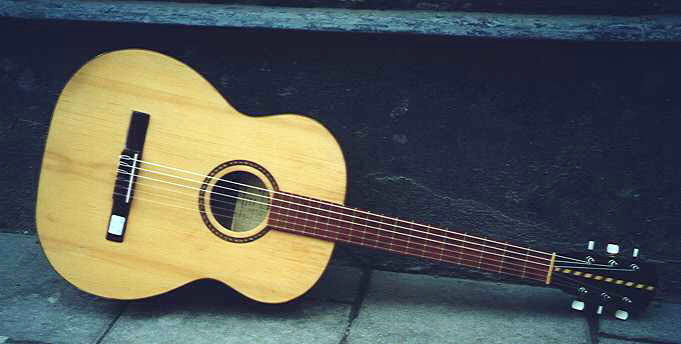 Vintage Guitars, SWEDEN - Instruments for sale. and they are no longer available. 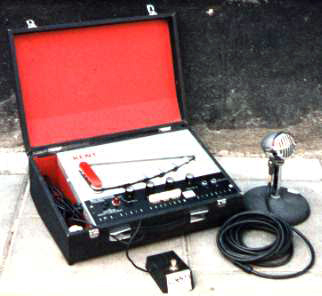 Please also check out our instruments for sale. 1954 Academy (National) Town & Country, natural, SOLD! Photo How much? 1997 Ad Lib Stratocaster, Fiesta Red, SOLD! Photo How much? 1980 Stefan Ahlgren LEFTY Les Paul copy, goldtop, SOLD! Photo How much? 1975 Alex Axe double-neck, cherry, SOLD! Photo How much? 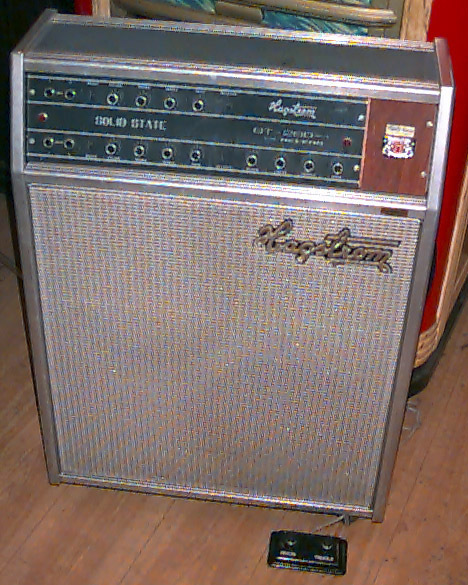 1969 Ampeg Dan Armstrong, clear lucite, SOLD! Photo How much? 1978 Arbiter Les Paul copy, sunburst, SOLD! Photo How much? AXL Guitars , burgundy red, SOLD! Photo How much? 1990 Aria Pro II XR-series, black & blue crackle finish, SOLD! Photo How much? 2003 BC Rich Body Art Collection Mockingbird, Black Gold, SOLD! Photo How much? 2010 BC Rich Retro II Gunslinger, Neon Green, SOLD! Photo How much? BC Rich Warbeast 1, black, SOLD! Photo How much? 1966 Baldwin Double Six, sunburst, SOLD! Photo How much? 2007 Behringer iAXE 393, white, SOLD! Photo How much? 1970s Bucks & Ricket Les Paul Recording copy, cherry, SOLD! Photo How much? BurnOut , natural, SOLD! Photo How much? BurnOut Les Paul-style, black, SOLD! Photo How much? 1963 Burns Bison, white, SOLD! Photo How much? 1974-1977 Burns Flyte, silver, SOLD! Photo How much? 1963 Burns Jazz Split Sound, sunburst, SOLD! Photo How much? 1963 Burns Jazz Split Sound, white, SOLD! Photo How much? 1997 Burns Legend Deluxe, white, SOLD! Photo How much? 2003 Burns Marquee Club Series, blue, SOLD! Photo How much? 1965 Burns Marvin, white, SOLD! Photo How much? 1963 Burns Split Sonic, sunburst, SOLD! Photo How much? 2005 Burswood Travel Electric, black, SOLD! Photo How much? 1986 Casio Midi Guitar MG510, red, SOLD! Photo How much? 1989 Chandler Telepathic predecessor, gold, SOLD! Photo How much? 1980s Chiquita Travel Guitar, cherry, SOLD! Photo How much? 2001 Collings 290, sunburst, SOLD! Photo How much? 2000s Danelectro 56-U2, tan, SOLD! Photo How much? 2010 Danelectro Hodad, red metallic, SOLD! Photo How much? 2010 Dean RC7X Rusty Cooley, black metallic, SOLD! Photo How much? 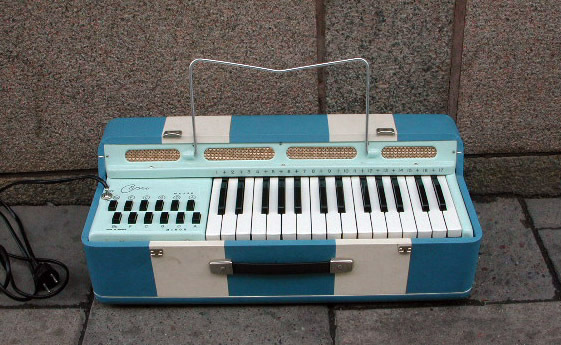 1960s Dynacord Cora, black, SOLD! Photo How much? 1970s Dynalectron Longhorn, copper burst, SOLD! Photo How much? Eagle Clas Yngström, Tobacco Sunburst, SOLD! Photo How much? 1978 Eagle Stratocaster, Candy Apple Red, SOLD! Photo How much? 1977 Eko M24 Unibodies Benchmark, natural, SOLD! Photo How much? 1976 Electra MPC Model X-310, black, SOLD! Photo How much? 1961 Epiphone Coronet, refinished natural mahogany, SOLD! Photo How much? 1964 Epiphone Coronet, cherry, SOLD! Photo How much? 1965 Epiphone Coronet, cherry, SOLD! Photo How much? 1966 Epiphone Coronet, cherry, SOLD! Photo How much? 1965 Epiphone Crestwood Custom, refinished white, converted to Coronet style, SOLD! Photo How much? Epiphone Les Paul, sunburst, SOLD! Photo How much? 1990 Epiphone Les Paul, white, SOLD! Photo How much? 2006 Epiphone Les Paul, Cherry Burst, SOLD! Photo How much? 2016 Epiphone Les Paul Standard, ebony, SOLD! Photo How much? 1965 Epiphone Olympic, sunburst, SOLD! Photo How much? 1965 Epiphone Olympic, stripped, SOLD! Photo How much? 2004 Epiphone SG Special, cherry, SOLD! Photo How much? 1990 Epiphone Stratocaster, stripped natural, SOLD! Photo How much? 2009 Epiphone Zakk Wylde ZV Custom, black, SOLD! Photo How much? 1992 Epiphone by Gibson Strat, red, SOLD! Photo How much? 2001 Ernie Ball Music Man John Petrucci JP6, black, SOLD! Photo How much? 2006 Ernie Ball Music Man Silhouette 20th Anniversary Limited Edition 1/13, Cherry Burst, SOLD! Photo How much? Ernie Ball Music Man Silhouette BFR, sunburst, SOLD! Photo How much? ESP LTD EC-500 BKS, black, SOLD! Photo How much? 2004 Fender 1966 Stratocaster NOS, black, SOLD! Photo How much? 2009 Fender Acoustasonic, sunburst, SOLD! Photo How much? 2005 Fender American Deluxe Telecaster FMT HH, Amber, SOLD! Photo How much? 2016 Fender American Elite Stratocaster HSS ShawBucker, Olympic Pearl, SOLD! Photo How much? 2016 Fender American Professional Stratocaster, Antique Olive, SOLD! Photo How much? 2003 Fender American Vintage ’52, Butterscotch Blonde, SOLD! Photo How much? 1950 Fender Broadcaster, refinished butterscotch, SOLD! Photo How much? 1981 Fender Bullet, red, SOLD! Photo How much? 2017 Fender Classic Player Baja Telecaster, blonde, SOLD! Photo How much? 2005 Fender Custom Shop 1951 Nocaster Relic, butterscotch blonde, SOLD! Photo How much? 1997 Fender Custom Shop 1956 Stratocaster, sunburst, SOLD! Photo How much? 2010 Fender Custom Shop 1956 Stratocaster Closet Classic, Fiesta Red, SOLD! Photo How much? 1988 Fender Custom Shop 1957 Stratocaster, Vintage White with matching headstock, SOLD! Photo How much? Fender Custom Shop 1959 Telecaster Closet Classic, blonde, SOLD! Photo How much? 1994 Fender Custom Shop 1960 Stratocaster, sunburst, SOLD! Photo How much? 2007 Fender Custom Shop 1960 Stratocaster Relic HSS, sunburst, SOLD! Photo How much? 2014 Fender Custom Shop Custom Telecaster, Olympic White, SOLD! Photo How much? 1997 Fender Custom Shop Stratocaster 1958, Sonic Blue, SOLD! Photo How much? 1967 Fender Custom Telecaster, sunburst, SOLD! Photo How much? 1968 Fender Custom Telecaster, black, SOLD! Photo How much? 1969 Fender Custom Telecaster, sunburst, SOLD! Photo How much? 1989 Fender Custom Telecaster '62 Reissue Japan, sunburst, SOLD! Photo How much? 2002-2004 Fender Custom Telecaster '62 Reissue Japan, sunburst, SOLD! Photo How much? 2005 Fender Eric Johnson Stratocaster, sunburst, SOLD! Photo How much? 1959 Fender Esquire, refinished Dakota Red, SOLD! Photo How much? 1963 Fender Esquire, refinished blonde, SOLD! Photo How much? 1965 Fender Esquire, refinished Olympic White, SOLD! Photo How much? 1968 Fender Esquire, blonde, SOLD! Photo How much? 1988 Fender HM Strat, pink, SOLD! Photo How much? 1996 Fender Jag-Stang, green, SOLD! Photo How much? 1962 Fender Jaguar, Fiesta Red, SOLD! Photo How much? 1962 Fender Jaguar, sunburst, SOLD! Photo How much? 1963 Fender Jaguar, refinished green, SOLD! Photo How much? 1963 Fender Jaguar, sunburst, SOLD! Photo How much? 1963 Fender Jaguar, refinished sunburst, SOLD! Photo How much? 1963 Fender Jaguar, refinished purple metallic, SOLD! Photo How much? 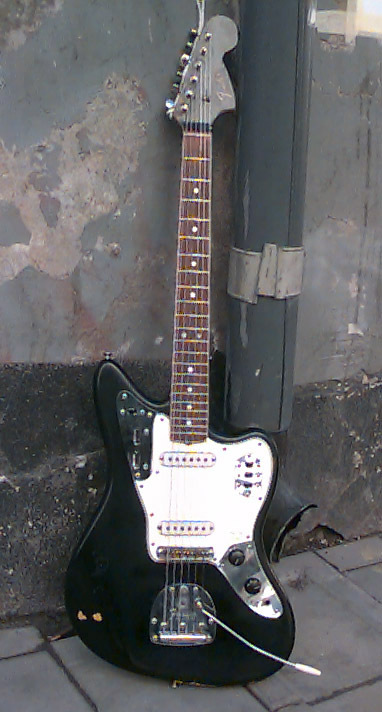 1964 Fender Jaguar, black, SOLD! Photo How much? 1964 Fender Jaguar, Candy Apple Red, SOLD! Photo How much? 1964 Fender Jaguar, sunburst, SOLD! Photo How much? 1965 Fender Jaguar, sunburst, SOLD! Photo How much? 1965 Fender Jaguar, refinished natural, SOLD! Photo How much? 1965 Fender Jaguar, Candy Apple Red, SOLD! Photo How much? 1966 Fender Jaguar, black, SOLD! Photo How much? 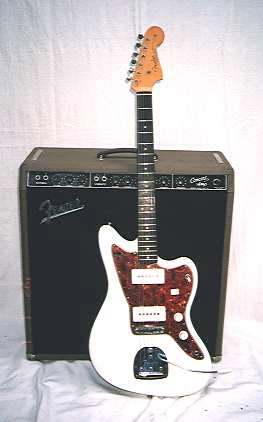 1966 Fender Jaguar, Olympic White, SOLD! Photo How much? 1966 Fender Jaguar, refinished natural, SOLD! Photo How much? 1966 Fender Jaguar, sunburst, SOLD! Photo How much? 1967 Fender Jaguar, sunburst, SOLD! Photo How much? 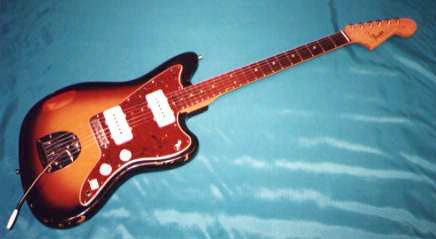 1968 Fender Jaguar, sunburst, SOLD! Photo How much? 2002-2004 Fender Jaguar Japan, Daphne Blue, SOLD! Photo How much? 1960 Fender Jazzmaster, refinished Olympic White, SOLD! Photo How much? 1961 Fender Jazzmaster, refinished Olympic White, SOLD! Photo How much? 1961 Fender Jazzmaster, refinished Candy Apple Red, SOLD! Photo How much? 1962 Fender Jazzmaster, refinished black, SOLD! Photo How much? 1963 Fender Jazzmaster, sunburst, SOLD! Photo How much? 1963 Fender Jazzmaster, refinished sunburst, SOLD! Photo How much? 1964 Fender Jazzmaster, refinished wine red, SOLD! Photo How much? 1965 Fender Jazzmaster, sunburst, SOLD! Photo How much? 1965 Fender Jazzmaster, refinished Candy Apple Red, SOLD! Photo How much? 1966 Fender Jazzmaster, sunburst, SOLD! Photo How much? 1981 Fender Lead III, wine red, SOLD! Photo How much? 2012 Fender Modern Player Marauder, blue metallic, SOLD! Photo How much? 1957 Fender Musicmaster, Desert Sand, SOLD! Photo How much? 1964 Fender Mustang, refinished Olympic White, SOLD! Photo How much? 1965 Fender Mustang, refinished Dakota Red, SOLD! Photo How much? 1969 Fender Mustang, Dakota Red, SOLD! Photo How much? 1972 Fender Mustang, Competition Red, SOLD! Photo How much? 1974 Fender Mustang, sunburst, SOLD! Photo How much? 2016 Fender Pure American Vintage 52 Telecaster, butterscotch blonde, SOLD! Photo How much? 2008 Fender Road Worn Telecaster, sunburst, SOLD! Photo How much? 2004 Fender Showmaster Goldtop HH, goldtop, SOLD! Photo How much? 2006 Fender Standard Telecaster 3TS, sunburst, SOLD! Photo How much? 1955 Fender Stratocaster, refinished sunburst, SOLD! Photo How much? 1955 Fender Stratocaster, sunburst, SOLD! Photo How much? 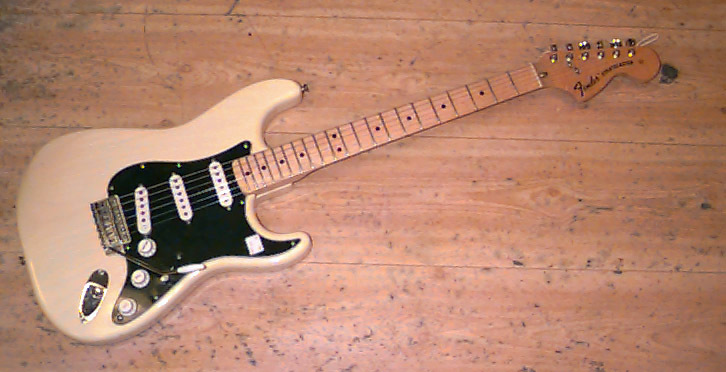 1955 Fender Stratocaster, refinished blonde, SOLD! Photo How much? 1956 Fender Stratocaster, sunburst, SOLD! Photo How much? 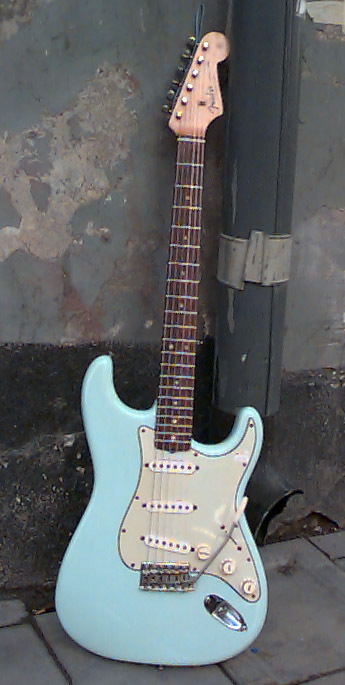 1957 Fender Stratocaster, refinished Daphne Blue, SOLD! Photo How much? 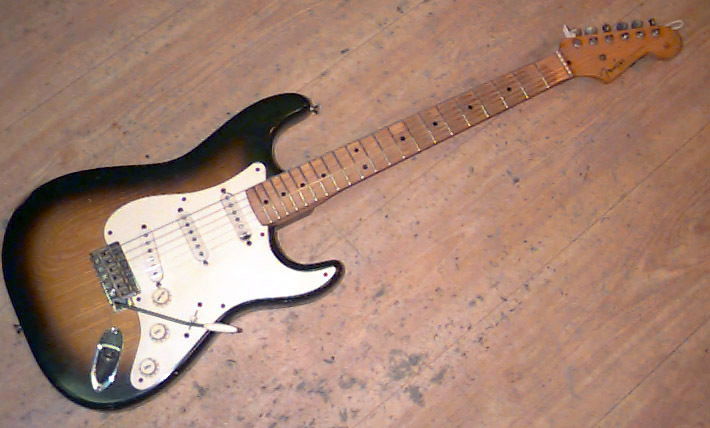 1957 Fender Stratocaster, old refinished Desert Sand, SOLD! Photo How much? 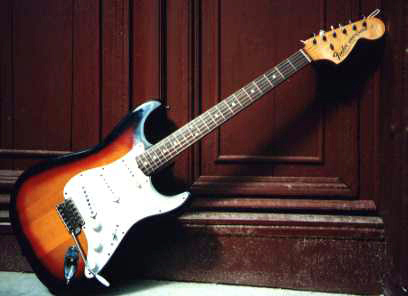 1958 Fender Stratocaster, sunburst, SOLD! Photo How much? 1959 Fender Stratocaster, refinished Foam Green, SOLD! Photo How much? 1960 Fender Stratocaster, sunburst, SOLD! Photo How much? 1961 Fender Stratocaster, refinished Fiesta Red, SOLD! Photo How much? 1961 Fender Stratocaster, refinished sunburst, SOLD! Photo How much? 1962 Fender Stratocaster, refin Sonic Blue, SOLD! Photo How much? 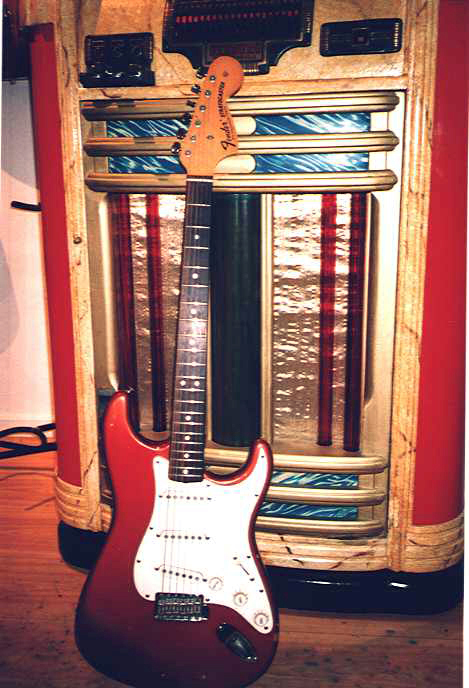 1962 Fender Stratocaster, Fiesta Red, SOLD! Photo How much? 1962 Fender Stratocaster, refinished Daphne Blue, SOLD! Photo How much? 1962 Fender Stratocaster, refinished Olympic White, SOLD! Photo How much? 1962 Fender Stratocaster, refinished red over original Fiesta Red, SOLD! Photo How much? 1962 Fender Stratocaster, sunburst, SOLD! Photo How much? 1962 Fender Stratocaster, refinished pearl white, SOLD! Photo How much? 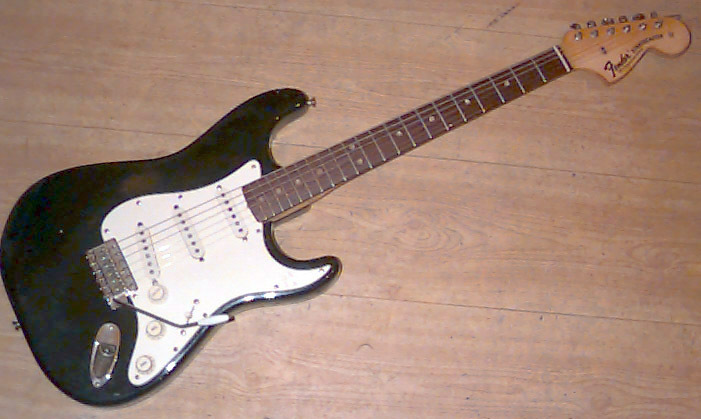 1962 Fender Stratocaster, old refinished black, SOLD! Photo How much? 1962 Fender Stratocaster, refinished yellowed olympic white, SOLD! Photo How much? 1963 Fender Stratocaster, refinished Sonic Blue, SOLD! Photo How much? 1963 Fender Stratocaster, refinished Olympic White, SOLD! Photo How much? 1963 Fender Stratocaster, refinished black, SOLD! Photo How much? 1963 Fender Stratocaster, sunburst, SOLD! Photo How much? 1963 Fender Stratocaster, refinished wine red, SOLD! Photo How much? 1963 Fender Stratocaster, black, SOLD! Photo How much? 1963 Fender Stratocaster, refinished Fiesta Red, SOLD! Photo How much? 1963 Fender Stratocaster, refinished Burgundy Mist, SOLD! Photo How much? 1963 Fender Stratocaster, Candy Apple Red, SOLD! Photo How much? 1964 Fender Stratocaster, sunburst, SOLD! Photo How much? 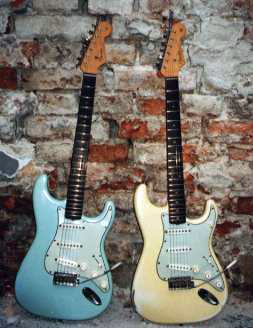 1964 Fender Stratocaster, Daphne Blue, SOLD! Photo How much? 1964 Fender Stratocaster, refinished sunburst, SOLD! Photo How much? 1964 Fender Stratocaster, refinished Olympic White, SOLD! Photo How much? 1964 Fender Stratocaster, refinished Fiesta Red, SOLD! Photo How much? 1964 Fender Stratocaster, refinished Daphne Blue, SOLD! Photo How much? 1965 Fender Stratocaster, refin Olympic White, SOLD! Photo How much? 1965 Fender Stratocaster, sunburst, SOLD! Photo How much? 1965 Fender Stratocaster, refin Candy Apple Red, SOLD! Photo How much? 1965 Fender Stratocaster, refinished purple, SOLD! Photo How much? 1965 Fender Stratocaster, refinished Candy Apple Red, SOLD! Photo How much? 1966 Fender Stratocaster, sunburst, SOLD! Photo How much? 1969 Fender Stratocaster, Olympic White, SOLD! Photo How much? 1969 Fender Stratocaster, refinished black, SOLD! Photo How much? 1969 Fender Stratocaster, refinished sunburst, SOLD! Photo How much? 1970 Fender Stratocaster, refinished sunburst, SOLD! Photo How much? 1971 Fender Stratocaster, Candy Apple Red, SOLD! Photo How much? 1971 Fender Stratocaster, black, SOLD! Photo How much? 1972 Fender Stratocaster, natural, SOLD! Photo How much? 1972 Fender Stratocaster, Olympic White, SOLD! Photo How much? 1972 Fender Stratocaster, sunburst, SOLD! Photo How much? 1972-1974 Fender Stratocaster, refinished Desert Sand, SOLD! Photo How much? 1974 Fender Stratocaster, sunburst, SOLD! Photo How much? 1974 Fender Stratocaster, Olympic White, SOLD! Photo How much? 1974 Fender Stratocaster, black, SOLD! Photo How much? 1974 Fender Stratocaster, natural, SOLD! Photo How much? 1975 Fender Stratocaster, Olympic White, SOLD! Photo How much? 1975 Fender Stratocaster, sunburst, SOLD! Photo How much? 1975 Fender Stratocaster, natural, SOLD! Photo How much? 1976 Fender Stratocaster, natural, SOLD! Photo How much? 1976 Fender Stratocaster, blonde, SOLD! Photo How much? 1976 Fender Stratocaster, sunburst, SOLD! Photo How much? 1979 Fender Stratocaster, sunburst, SOLD! Photo How much? 1979 Fender Stratocaster, black, SOLD! Photo How much? 1982 Fender Stratocaster "Dan Smith", gold on gold, SOLD! Photo How much? Fender Stratocaster 60th Anniversary, made in Mexico, sunburst, SOLD! Photo How much? 1999 Fender Stratocaster Custom Shop 1960´s Closet Classic, SOLD! Photo How much? 1977 Fender Stratocaster LEFTY!, Olympic White, SOLD! Photo How much? 1977 Fender Stratocaster, natural, SOLD! Photo How much? 1977 Fender Stratocaster, Olympic White, SOLD! Photo How much? 1977 Fender Stratocaster, black, SOLD! Photo How much? 1978 Fender Stratocaster, sunburst, SOLD! Photo How much? 1979 Fender Stratocaster, refinished black, SOLD! Photo How much? 1980 Fender Stratocaster, Olympic White, SOLD! Photo How much? 1980 Fender Stratocaster, natural, SOLD! Photo How much? 1980 Fender Stratocaster, sunburst, SOLD! Photo How much? 1980 Fender Stratocaster, black, hardtail, SOLD! Photo How much? 1980 Fender Stratocaster, International Color Capri Orange, SOLD! Photo How much? 1980 Fender Stratocaster, International Color Maui Blue, SOLD! Photo How much? 1981 Fender Stratocaster, International Color Capri Orange, SOLD! Photo How much? 1982 Fender Stratocaster "Dan Smith", sunburst, SOLD! Photo How much? 1982 Fender Stratocaster, sunburst, SOLD! Photo How much? 1982 Fender Stratocaster Gold, gold, SOLD! Photo How much? 1983 Fender Stratocaster, Artic White, SOLD! Photo How much? 1997 Fender Stratocaster '50s Reissue Japan, Sonic Blue, SOLD! Photo How much? 1982 Fender Stratocaster '57 Reissue, Fiesta Red, SOLD! Photo How much? 1983 Fender Stratocaster '57 Reissue, sunburst, SOLD! Photo How much? 1984 Fender Stratocaster '57 Reissue, Olympic White, SOLD! Photo How much? 1987 Fender Stratocaster '57 Reissue, Candy Apple Red, SOLD! Photo How much? 1987 Fender Stratocaster '57 Reissue, Fiesta Red, SOLD! Photo How much? 1991 Fender Stratocaster '57 Reissue, sunburst, SOLD! Photo How much? 1987-1988 Fender Stratocaster '60s Reissue Japan, Olympic White, SOLD! Photo How much? 1996-1997 Fender Stratocaster '60s Reissue Japan, Candy Apple Red, SOLD! Photo How much? 1986 Fender Stratocaster '62 Reissue Japan, sunburst, SOLD! Photo How much? 1996 Fender Stratocaster '62 Reissue Japan, sunburst, SOLD! Photo How much? 1993-1994 Fender Stratocaster '70s Reissue Japan, white, SOLD! Photo How much? 1979 Fender Stratocaster 25th Anniversary, silver, SOLD! Photo How much? 1980 Fender Stratocaster 25th Anniversary, silver, SOLD! Photo How much? 1994 Fender Stratocaster 40th Anniversary, sunburst, SOLD! Photo How much? 2004 Fender Stratocaster 50th Anniversary 1954 Reissue, sunburst, SOLD! Photo How much? 1999 Fender Stratocaster 1960s Relic, Sea Foam Green, SOLD! Photo How much? 1987 Fender Stratocaster American Standard, Olympic White, SOLD! Photo How much? 1991 Fender Stratocaster American Standard, black, SOLD! Photo How much? 1991 Fender Stratocaster American Standard, pewter, SOLD! Photo How much? 1996 Fender Stratocaster American Standard Lefty!, Candy Apple Red, SOLD! Photo How much? 2000 Fender Stratocaster American Standard, sunburst, SOLD! Photo How much? 1983 Fender Stratocaster Elite, black, SOLD! Photo How much? 1989 Fender Stratocaster Japan, Olympic White, SOLD! Photo How much? 2000 Fender Stratocaster Am Deluxe Series, blonde, SOLD! Photo How much? 1997 Fender Stratocaster California Series, black, SOLD! Photo How much? 1984-1987 Fender Stratocaster Paisley Japan, paisley, SOLD! Photo How much? 1989 Fender Stratocaster Paisley Japan, paisley, SOLD! Photo How much? 1989 Fender Stratocaster Plus, Olympic White, SOLD! Photo How much? 1992 Fender Stratocaster SRV, sunburst, SOLD! Photo How much? 1995 Fender Stratocaster SRV, sunburst, SOLD! Photo How much? 1996 Fender Stratocaster SRV, sunburst, SOLD! Photo How much? 1983 Fender Stratocaster Standard, black, SOLD! Photo How much? 1983 Fender Stratocaster Standard LEFTY!, sunburst, SOLD! Photo How much? 2002 Fender Stratocaster U.S. Special Highway 1, blonde, SOLD! Photo How much? 1986 Fender Stratocaster Vintage Reissue Corona, black, SOLD! Photo How much? Fender Stratocaster Yngwie Malmsteen w/scalloped 1972 neck, Vintage White, SOLD! Photo How much? 1989 Fender Stratocaster, made in Japan, made in Japan, Aged White, SOLD! Photo How much? 1953 Fender Telecaster, refinished butterscotch, SOLD! Photo How much? 1956 Fender Telecaster, refinished sunburst, SOLD! Photo How much? 1956 Fender Telecaster, refinished blonde, SOLD! Photo How much? 1957 Fender Telecaster, refinished blonde, SOLD! Photo How much? 1958 Fender Telecaster, Blonde, SOLD! Photo How much? 1960 Fender Telecaster, refinished red, SOLD! Photo How much? 1966 Fender Telecaster, refin natural, SOLD! Photo How much? 1966 Fender Telecaster, blonde, SOLD! Photo How much? 1966 Fender Telecaster, refinished Lake Placid Blue, SOLD! Photo How much? 1966 Fender Telecaster, old red refin, SOLD! Photo How much? 1967 Fender Telecaster, refinished Olympic White, SOLD! Photo How much? 1968 Fender Telecaster, blonde, SOLD! Photo How much? 1968 Fender Telecaster, refinished Olympic White, SOLD! Photo How much? 1969 Fender Telecaster, blonde, SOLD! Photo How much? 1971 Fender Telecaster, blonde, SOLD! Photo How much? 1971 Fender Telecaster, refinished blonde, SOLD! Photo How much? 1971 Fender Telecaster, yellowed blonde, SOLD! Photo How much? 1972 Fender Telecaster, sunburst, SOLD! Photo How much? 1972 Fender Telecaster, blonde, SOLD! Photo How much? 1972 Fender Telecaster, refinished natural, SOLD! Photo How much? 1973 Fender Telecaster, black, SOLD! Photo How much? 1973 Fender Telecaster, blonde, SOLD! Photo How much? 1974 Fender Telecaster, refinished black, SOLD! Photo How much? 1977 Fender Telecaster, blonde, SOLD! Photo How much? 1977 Fender Telecaster, refinished natural, SOLD! Photo How much? 1977 Fender Telecaster, Olympic White, SOLD! Photo How much? 1977 Fender Telecaster, sunburst, SOLD! Photo How much? 1978 Fender Telecaster, black, SOLD! Photo How much? 1978 Fender Telecaster, Olympic White, SOLD! Photo How much? 1978 Fender Telecaster, antigua, SOLD! Photo How much? 1979 Fender Telecaster, Olympic White, SOLD! Photo How much? 1980 Fender Telecaster, Olympic White, SOLD! Photo How much? 1981 Fender Telecaster, Morocco Red, SOLD! Photo How much? 1981 Fender Telecaster, sunburst, SOLD! Photo How much? 1981 Fender Telecaster, Sahara Taupe, SOLD! Photo How much? 1981 Fender Telecaster, Sienna Sunburst, SOLD! Photo How much? 1981 Fender Telecaster, black, SOLD! Photo How much? 1985-1986 Fender Telecaster '50s Reissue Japan, sunburst, SOLD! Photo How much? 1996 Fender Telecaster '52 Reissue, butterscotch, SOLD! Photo How much? 1997 Fender Telecaster '52 Reissue, black, SOLD! Photo How much? 1999 Fender Telecaster '52 Reissue, Copper, SOLD! Photo How much? 1995-1996 Fender Telecaster '52 Reissue Japan, butterscotch, SOLD! Photo How much? 1996-1997 Fender Telecaster '52 Reissue Japan, butterscotch, SOLD! Photo How much? 1997-1998 Fender Telecaster '52 Reissue Japan, butterscotch, SOLD! Photo How much? 2002 Fender Telecaster American Nashville B-Bender, black, SOLD! Photo How much? 1988 Fender Telecaster American Standard, sunburst, SOLD! Photo How much? 1999 Fender Telecaster American Standard, sunburst, SOLD! Photo How much? 2002 Fender Telecaster American Standard, blonde, SOLD! Photo How much? 1973 Fender Telecaster Custom, natural, SOLD! Photo How much? 1973 Fender Telecaster Custom, refinished dark grey metallic, SOLD! Photo How much? 1974 Fender Telecaster Custom, sunburst, SOLD! Photo How much? 1975 Fender Telecaster Custom, natural, SOLD! Photo How much? 1975 Fender Telecaster Custom, black, SOLD! Photo How much? 1979 Fender Telecaster Custom, Olympic White, SOLD! Photo How much? 1980 Fender Telecaster Custom, yellowed Olympic White, SOLD! Photo How much? 2002 Fender Telecaster Custom '72 Reissue Mexico, black, SOLD! Photo How much? 1985 Fender Telecaster Custom '72 Reissue, Made in Japan, Made in Japan, black, SOLD! Photo How much? 1973 Fender Telecaster Deluxe, walnut, SOLD! Photo How much? 1973 Fender Telecaster Deluxe, natural, SOLD! Photo How much? 1974 Fender Telecaster Deluxe, walnut, SOLD! Photo How much? 1974 Fender Telecaster Deluxe, natural, SOLD! Photo How much? 1978 Fender Telecaster Deluxe, black, SOLD! Photo How much? 1979 Fender Telecaster Deluxe, natural, SOLD! Photo How much? 2017 Fender Telecaster Elite, Mystic Black, SOLD! Photo How much? 1993 Fender Telecaster Jerry Donahue, sunburst, SOLD! Photo How much? 2000 Fender Telecaster Muddy Waters, Dakota Red, SOLD! Photo How much? 1989 Fender Telecaster Paisley Japan, paisley, SOLD! Photo How much? 1983 Fender Telecaster Standard, black, SOLD! Photo How much? 1971 Fender Telecaster Thinline, black, SOLD! Photo How much? 1973 Fender Telecaster Thinline, natural, SOLD! Photo How much? 1985-1986 Fender Telecaster Thinline Japan, natural mahogany, SOLD! Photo How much? 1985-1986/1990s Fender Telecaster Thinline Japan, natural mahogany, SOLD! Photo How much? 1998 Fender Tele-Sonic, sunburst, SOLD! Photo How much? 2004 Fernandes Monterey Elite, sunburst, SOLD! Photo How much? 2009 Gary Kramer , black, SOLD! Photo How much? 2013 Gibson '57 Les Paul Goldtop Reissue, goldtop, SOLD! Photo How much? 1996 Gibson All American I, wineburst, SOLD! Photo How much? 2015 Gibson CS9 '50s Style Les Paul Standard VOS, Lemon Burst, SOLD! Photo How much? 1983 Gibson Challenger I, silver, SOLD! Photo How much? 2014 Gibson EDS-1275 Custom Shop, cherry, SOLD! Photo How much? 2006 Gibson Elliot Easton Custom SG, Pelham Blue, SOLD! Photo How much? 1976 Gibson Explorer, mahogany, SOLD! Photo How much? 1984 Gibson Explorer, stripped natural, SOLD! Photo How much? 1998 Gibson Explorer '76 Reissue, black, SOLD! Photo How much? 2001 Gibson Explorer Gothic, black, SOLD! Photo How much? 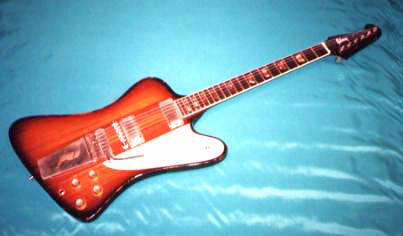 1965 Gibson Firebird I, sunburst, SOLD! Photo How much? 1964 Gibson Firebird V, sunburst, SOLD! Photo How much? 2013 Gibson Firebird VII 20th Anniversary, Golden Mist, SOLD! Photo How much? 1975 Gibson Flying V, mahogany, SOLD! Photo How much? 1998 Gibson Flying V, cream white, 1967 reissue, SOLD! Photo How much? 2009 Gibson Jeff Beck 1954 Oxblood, brown, SOLD! Photo How much? 2008 Gibson Jimmy Page Signature Custom, black, SOLD! Photo How much? 1975 Gibson L-6S Custom, natural, SOLD! Photo How much? 1975 Gibson L-6S Deluxe, natural, SOLD! Photo How much? 1955 Gibson Les Paul, refinished all gold, SOLD! Photo How much? 1957 Gibson Les Paul, refinished cherry, SOLD! Photo How much? 2008 Gibson Les Paul '59 Flametop Reissue, Faded Darkburst, SOLD! Photo How much? 1978 Gibson Les Paul 55, sunburst, SOLD! Photo How much? 1977 Gibson Les Paul 55-77, limed mahogany, SOLD! Photo How much? 1979 Gibson Les Paul Artisan, sunburst, SOLD! Photo How much? 2015 Gibson Les Paul Classic, sunburst, SOLD! Photo How much? 2014 Gibson Les Paul Classic 120th Anniversary, Honey Burst, SOLD! Photo How much? 1954 Gibson Les Paul Custom, refinished black, SOLD! Photo How much? 1955 Gibson Les Paul Custom, refin black, SOLD! Photo How much? 1955 Gibson Les Paul Custom, black, SOLD! Photo How much? 1969 Gibson Les Paul Custom, black, SOLD! Photo How much? 1970 Gibson Les Paul Custom, black, SOLD! Photo How much? 1972 Gibson Les Paul Custom, sunburst, SOLD! Photo How much? 1973 Gibson Les Paul Custom, black, SOLD! Photo How much? 1973 Gibson Les Paul Custom, sunburst, SOLD! Photo How much? 1974 Gibson Les Paul Custom, black, SOLD! Photo How much? 1974 Gibson Les Paul Custom, yellowed white, SOLD! Photo How much? 1976 Gibson Les Paul Custom, black, SOLD! Photo How much? 1977 Gibson Les Paul Custom, silver metallic, SOLD! Photo How much? 1978 Gibson Les Paul Custom, black, SOLD! Photo How much? 1980 Gibson Les Paul Custom, black, SOLD! Photo How much? 1980 Gibson Les Paul Custom, Alpine White, SOLD! Photo How much? 1981 Gibson Les Paul Custom, black, SOLD! Photo How much? 1985 Gibson Les Paul Custom, black, SOLD! Photo How much? 1989 Gibson Les Paul Custom, sunburst, SOLD! Photo How much? 1989 Gibson Les Paul Custom, very yellowed white, SOLD! Photo How much? 1990 Gibson Les Paul Custom, black, SOLD! Photo How much? 1999 Gibson Les Paul Custom, wine red, SOLD! Photo How much? 1999 Gibson Les Paul Custom, black, SOLD! Photo How much? 1998 Gibson Les Paul Custom '57 Reissue, black, SOLD! Photo How much? 2005 Gibson Les Paul Custom 1957 Reissue, black, SOLD! Photo How much? 1974 Gibson Les Paul Custom 20th Anniversary, black, SOLD! Photo How much? 1973 Gibson Les Paul Deluxe, goldtop, SOLD! Photo How much? 1973 Gibson Les Paul Deluxe, sunburst, SOLD! Photo How much? 1974 Gibson Les Paul Deluxe, refinished white, SOLD! Photo How much? 1976 Gibson Les Paul Deluxe, goldtop, SOLD! Photo How much? 1977 Gibson Les Paul Deluxe, goldtop, SOLD! Photo How much? 1978 Gibson Les Paul Deluxe, wine red, SOLD! Photo How much? 1979 Gibson Les Paul Deluxe, goldtop, SOLD! Photo How much? 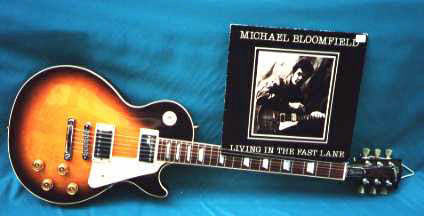 1980 Gibson Les Paul Deluxe, sunburst, SOLD! Photo How much? 1980 Gibson Les Paul Deluxe, natural, SOLD! Photo How much? 1981 Gibson Les Paul Deluxe, goldtop, SOLD! Photo How much? 1997 Gibson Les Paul Double Cutaway Studio, black, SOLD! Photo How much? 1997 Gibson Les Paul Goldtop '54 Reissue, goldtop, converted to Gibson BurstBucker pickups, SOLD! Photo How much? 2000 Gibson Les Paul Goldtop '54 Reissue, goldtop, SOLD! Photo How much? 2000 Gibson Les Paul Goldtop '57 Reissue, goldtop, SOLD! Photo How much? 1980 Gibson Les Paul Heritage Standard 80, sunburst, SOLD! Photo How much? 1981 Gibson Les Paul Heritage Standard 80, sunburst, SOLD! Photo How much? 1955 Gibson Les Paul Junior, sunburst, SOLD! Photo How much? 1958 Gibson Les Paul Junior, cherry, SOLD! Photo How much? 2015 Gibson Les Paul Junior, cherry, SOLD! Photo How much? 1960 Gibson Les Paul Junior Plectrum, cherry, SOLD! Photo How much? 1961 Gibson Les Paul Junior, cherry, SOLD! Photo How much? 1962 Gibson Les Paul Junior, cherry, SOLD! Photo How much? 1992 Gibson Les Paul Junior, TV yellow, SOLD! Photo How much? 2013 Gibson Les Paul LPJ, Satin Cherry, SOLD! Photo How much? 1997 Gibson Les Paul Mary Ford, Goldtop, SOLD! Photo How much? 1956 Gibson Les Paul Model, goldtop, SOLD! Photo How much? 1978 Gibson Les Paul Pro-Deluxe, sunburst, SOLD! Photo How much? 2018 Gibson Les Paul R8, sunburst, SOLD! Photo How much? 1956 Gibson Les Paul Special, TV yellow, SOLD! Photo How much? 1956 Gibson Les Paul Special, limed mahogany, SOLD! Photo How much? 1957 Gibson Les Paul Special, limed mahogany, SOLD! Photo How much? 1959 Gibson Les Paul Special, refinished white, SOLD! Photo How much? 1995 Gibson Les Paul Special, cherry, SOLD! Photo How much? 1996 Gibson Les Paul Special, TV yellow, SOLD! Photo How much? 1958 Gibson Les Paul Standard, goldtop, SOLD! Photo How much? 1961 Gibson Les Paul Standard, cherry, SG body shape, SOLD! Photo How much? 1968 Gibson Les Paul Standard, refinished sunburst, SOLD! Photo How much? 1977 Gibson Les Paul Standard, cherry sunburst, SOLD! Photo How much? 1977 Gibson Les Paul Standard, sunburst, SOLD! Photo How much? 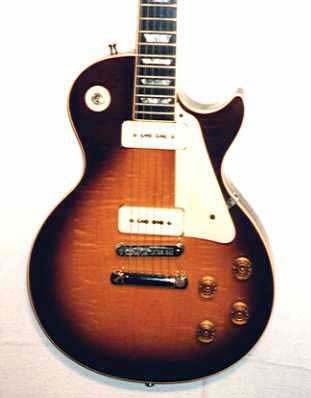 1980 Gibson Les Paul Standard, sunburst, SOLD! Photo How much? 1989 Gibson Les Paul Standard, black, SOLD! Photo How much? 1990 Gibson Les Paul Standard, sunburst, SOLD! Photo How much? 1992 Gibson Les Paul Standard, sunburst, SOLD! Photo How much? 1995 Gibson Les Paul Standard, sunburst, signed by Slash! SOLD! Photo How much? 1997 Gibson Les Paul Standard, wine red, SOLD! Photo How much? 2000 Gibson Les Paul Standard, sunburst, SOLD! Photo How much? 2000 Gibson Les Paul Standard, red sparkle, SOLD! Photo How much? 2001 Gibson Les Paul Studio Silver Edition, silver, SOLD! Photo How much? 1987 Gibson Les Paul Studio Standard, Ferrari Red, SOLD! Photo How much? 1995 Gibson Les Paul Studio, black, SOLD! Photo How much? 1996 Gibson Les Paul Studio, sunburst, SOLD! Photo How much? 1996 Gibson Les Paul Studio, black, SOLD! Photo How much? 2000 Gibson Les Paul Studio, black, SOLD! Photo How much? 2014 Gibson Les Paul Traditional, sunburst, SOLD! Photo How much? 2014 Gibson Les Paul Traditional 120th Anniversary, Honey Burst, SOLD! Photo How much? 1978 Gibson Marauder, maroon, SOLD! Photo How much? 1978 Gibson Marauder, black, SOLD! Photo How much? 1961 Gibson Melody Maker, sunburst, SOLD! Photo How much? 1965 Gibson Melody Maker, cherry, SOLD! Photo How much? 1968 Gibson Melody Maker, sparkling burgundy, SOLD! Photo How much? 2011 Gibson Melody Maker, white, SOLD! Photo How much? 1959 Gibson Melody Maker 3/4, sunburst, SOLD! Photo How much? 2008 Gibson Mick Jones Les Paul Custom, black, SOLD! Photo How much? 1978 Gibson RD Artist, natural, SOLD! Photo How much? 1977 Gibson RD Custom, natural, SOLD! Photo How much? 2010 Gibson Randy Rhoads Les Paul Custom, white, SOLD! Photo How much? 2004 Gibson SG Angus Young, cherry, SOLD! Photo How much? 1999 Gibson SG Classic, cherry, SOLD! Photo How much? 1974 Gibson SG Custom, walnut, SOLD! Photo How much? 2008 Gibson SG Diablo, Red Metallic, SOLD! Photo How much? 2007 Gibson SG Faded, cherry, SOLD! Photo How much? 1961 Gibson SG Special, limed mahogany, SOLD! Photo How much? 1962 Gibson SG Special, cherry, SOLD! Photo How much? 1963 Gibson SG Special, cherry, SOLD! Photo How much? 1970-1971 Gibson SG Special, Polaris White, SOLD! Photo How much? 1971 Gibson SG Special, walnut, SOLD! Photo How much? 1972 Gibson SG Special, faded cherry, SOLD! Photo How much? 1998 Gibson SG Special, black, SOLD! Photo How much? 1962 Gibson SG Standard, cherry, SOLD! Photo How much? 1965 Gibson SG Standard, cherry, SOLD! Photo How much? 1968 Gibson SG Standard, cherry, SOLD! Photo How much? 1969 Gibson SG Standard, cherry, SOLD! Photo How much? 1971 Gibson SG Standard, cherry, SOLD! Photo How much? 1972 Gibson SG Standard, walnut, SOLD! Photo How much? 1973 Gibson SG Standard, walnut, SOLD! Photo How much? 1974 Gibson SG Standard, faded cherry, SOLD! Photo How much? 1974 Gibson SG Standard, mahogany, SOLD! Photo How much? 1975 Gibson SG Standard, cherry, SOLD! Photo How much? 1978 Gibson SG Standard, cherry, SOLD! Photo How much? 1980 Gibson SG Standard, cherry, SOLD! Photo How much? 1981 Gibson SG Standard, cherry, SOLD! Photo How much? 1996 Gibson SG Standard, ebony, SOLD! Photo How much? 1996 Gibson SG Standard, black, SOLD! Photo How much? 1999 Gibson SG Standard, cherry, SOLD! Photo How much? 2010 Gibson SG Standard '61 RI, vintage cherry, SOLD! Photo How much? 1997 Gibson SG Standard 1961 Reissue, cherry, SOLD! Photo How much? 2009 Gibson SG Standard 1961 Reissue, cherry, SOLD! Photo How much? 2017 Gibson SG Standard T, heritage cherry, SOLD! Photo How much? 1976 Gibson S-1, natural, SOLD! Photo How much? 1976 Gibson S-1, refinished black, SOLD! Photo How much? 1977 Gibson S-1, natural, SOLD! Photo How much? 2012 Gibson SG Supra, Translucent Black, SOLD! Photo How much? 1981 Gibson Spirit I, sunburst, SOLD! Photo How much? 1996 Gibson The Paul II, cherry, SOLD! Photo How much? 2000 Godin LGXT, black, SOLD! Photo How much? Gould BM GS300, Vintage Red, SOLD! Photo How much? 1960 Goya (Hagström) 80, black, SOLD! Photo How much? 1960 Goya (Hagström) 80, gold sparkle, SOLD! Photo How much? 1961 Goya (Hagström) Deluxe, red sparkle, SOLD! Photo How much? 1961 Goya P46 (Hagström Deluxe 90), blue sparkle, SOLD! Photo How much? 1992 Gretsch 6121QT-BRS, sunburst, SOLD! Photo How much? 1964 Gretsch Astro Jet, red, SOLD! Photo How much? 1965 Gretsch Astro Jet, red, SOLD! Photo How much? 1961 Gretsch Bikini, black, SOLD! Photo How much? 1979 Gretsch BST 5000, mahogany, SOLD! Photo How much? 1964 Gretsch Corvette (Model 6135), cherry, SOLD! Photo How much? 1955 Gretsch Duo-Jet (Model 6128), black, SOLD! Photo How much? 2012 Gretsch Electromatic G5105 CVT III, cherry, SOLD! Photo How much? 2007 Gretsch G5435, Jet Black, SOLD! Photo How much? 1956 Gretsch Jet Fire Bird, red, SOLD! Photo How much? 1956 Gretsch Model 6121 Chet Atkins Solidbody Guitar, orange, SOLD! Photo How much? 1979 Gretsch TK-300, natural, SOLD! Photo How much? 1996 Guild Bluesbird, natural, SOLD! Photo How much? 1997 Guild S-100 Polara, cherry, SOLD! Photo How much? 1965 Hagström 12-string, red, SOLD! Photo How much? 1966 Hagström 12-string, red, SOLD! Photo How much? 1966 Hagström 12-string, sunburst, SOLD! Photo How much? 1967 Hagström 12-string, sunburst, SOLD! Photo How much? 1965 Hagström Automatic, sunburst, SOLD! Photo How much? 1965 Hagström Condor, sunburst, SOLD! Photo How much? 2005 Hagström D2H, black sparkle, SOLD! Photo How much? 1959 Hagström De Luxe, black, SOLD! Photo How much? 1961 Hagström De Luxe, blue sparkle, SOLD! Photo How much? 1962 Hagström De Luxe Model Ä "Batman", blue sparkle, SOLD! Photo How much? 1963 Hagström Futurama, blue, SOLD! Photo How much? 1964 Hagström Futurama, blue, SOLD! Photo How much? 1964 Hagström Futurama, red, SOLD! Photo How much? 1970 Hagström HIII, sunburst, SOLD! Photo How much? 1971 Hagström HIIN, sunburst, SOLD! Photo How much? 1971 Hagström HIIN, cherry, SOLD! Photo How much? 1971 Hagström HIIN, red, SOLD! Photo How much? 1972 Hagström HIIN OT, light transparent cherry red sunburst, SOLD! Photo How much? 1972 Hagström HIIN, sunburst, SOLD! Photo How much? 1973 Hagström HIIN, sunburst, SOLD! Photo How much? 1973 Hagström HIIN, cherry, SOLD! Photo How much? 1974 Hagström HIIN, black, SOLD! Photo How much? 1975 Hagström HIIN, sunburst, SOLD! Photo How much? 1975 Hagström HIIN, cherry, SOLD! Photo How much? 1975 Hagström HIIN OT, black, SOLD! Photo How much? 1975 Hagström HIIN OT, sunburst, SOLD! Photo How much? 1976 Hagström HIIN, cherry, SOLD! Photo How much? 1976 Hagström HIIN, walnut, SOLD! Photo How much? 1976 Hagström HIIN, wine red, SOLD! Photo How much? 1965 Hagström I, black, SOLD! Photo How much? 1966 Hagström I, refinished white, SOLD! Photo How much? 1965 Hagström II, red, SOLD! Photo How much? 1965 Hagström II, sunburst, SOLD! Photo How much? 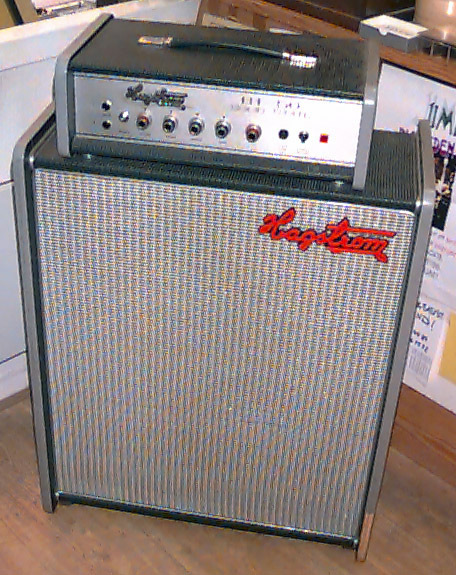 1965 Hagström II, sunburst, converted to HIIN, SOLD! Photo How much? 1966 Hagström II, sunburst, Kent logo, SOLD! Photo How much? 1967 Hagström II, blue, SOLD! Photo How much? 1960s Hagström III, white, put together from Hagström parts, SOLD! Photo How much? 1965 Hagström III, blue, SOLD! Photo How much? 1965 Hagström III, red, SOLD! Photo How much? 1965 Hagström III, black, SOLD! Photo How much? 1966 Hagström III, black, SOLD! Photo How much? 1966 Hagström III Lefty, sunburst, SOLD! Photo How much? 1967 Hagström III, sunburst, SOLD! Photo How much? 1968 Hagström III, white, SOLD! Photo How much? 1977 Hagström III Scandi, wine red, SOLD! Photo How much? 1962 Hagström Kent, blue, SOLD! Photo How much? 1965 Hagström Kent I, red, SOLD! Photo How much? 1963 Hagström Kent PG-24-G, red, SOLD! Photo How much? 1964 Hagström Kent PG-24-G, red, SOLD! Photo How much? 1964 Hagström Kent PB-24-G, red, SOLD! Photo How much? 1979 Hagström Partner, red, SOLD! Photo How much? 1976 Hagström Scandi, sunburst, SOLD! Photo How much? 1977 Hagström Scandi, cherry, SOLD! Photo How much? 1980 Hagström Scandi, transparent blue, faded front, SOLD! Photo How much? 1959 Hagström Standard, red sparkle, SOLD! Photo How much? 1962 Hagström Standard, white pearl, SOLD! Photo How much? 1961 Hagström Standard 80, white pearl, SOLD! Photo How much? 1979 Hagström Super Swede, wine red, SOLD! Photo How much? 1979 Hagström Super Swede, cherry, SOLD! Photo How much? 1979 Hagström Super Swede, dark mahogany, SOLD! Photo How much? 1980 Hagström Super Swede, sunburst, SOLD! Photo How much? 1980 Hagström Super Swede, burgundy metallic, SOLD! Photo How much? 1980 Hagström Super Swede, cherry, SOLD! Photo How much? 1980 Hagström Super Swede, purple metallic, SOLD! Photo How much? 1980 Hagström Super Swede, lingonberry sunburst, SOLD! Photo How much? 1980s Hagström Super Swede, sunburst, SOLD! Photo How much? 1983 Hagström Super Swede, black, SOLD! Photo How much? 2004 Hagström Super Swede, black, SOLD! Photo How much? 1971 Hagström Swede, cherry, SOLD! Photo How much? 1972 Hagström Swede, cherry, SOLD! Photo How much? 1973 Hagström Swede, black, SOLD! Photo How much? 1973 Hagström Swede, mahogany, SOLD! Photo How much? 1974 Hagström Swede, cherry, SOLD! Photo How much? 1974 Hagström Swede, mahogany, SOLD! Photo How much? 1974 Hagström Swede, mahogany, extra wide neck, SOLD! Photo How much? 1974 Hagström Swede, black, SOLD! Photo How much? 1975 Hagström Swede, walnut, SOLD! Photo How much? 1975 Hagström Swede, black, SOLD! Photo How much? 1976 Hagström Swede, mahogany, SOLD! Photo How much? 1977 Hagström Swede, mahogany, SOLD! Photo How much? 1978 Hagström Swede, mahogany, SOLD! Photo How much? 1978 Hagström Swede, cherry, SOLD! Photo How much? 1978 Hagström Swede, black, SOLD! Photo How much? 1978 Hagström Swede Lefty, cherry, SOLD! Photo How much? 1978-1980 Hagström Swede, white, SOLD! Photo How much? 1979 Hagström Swede, mahogany, SOLD! Photo How much? 1980 Hagström Swede, cherry, SOLD! Photo How much? 1980 Hagström Swede, pink, SOLD! Photo How much? 1980 Hagström Swede, rare grey color, SOLD! Photo How much? 1978-1979 Hagström Swede De Luxe/Super Swede, cherry, SOLD! Photo How much? 1977 Hagström Swede Patch, mahogany, SOLD! Photo How much? 2016 Hagström Swede Three Kings, black, SOLD! Photo How much? 1983 Hagström Ultra Swede, grey metallic, SOLD! Photo How much? 2010 Hagström Ultra Swede, Burgundy Burst, SOLD! Photo How much? 1997 Halkan Roadmaster Custom, black with perloid top & fingerboard, SOLD! Photo How much? 1972 Hoyer 5060S, natural, SOLD! Photo How much? 1962 Höfner Model 191(1) Double-Neck, sunburst, SOLD! Photo How much? 1970s Hoyer 7000 Double-Neck, natural mahogany, SOLD! Photo How much? 1971 Höfner neck on Maya body, sunburst, SOLD! Photo How much? 1981 Ibanez Artist AR300CS, sunburst, SOLD! Photo How much? 1980 Ibanez Artstar AE200, sunburst, SOLD! Photo How much? 1978 Ibanez Custom Agent, sunburst, SOLD! Photo How much? 2013 Ibanez Destroyer, metallic red, SOLD! Photo How much? Ibanez Gio GRX70, blue, SOLD! Photo How much? 1976 Ibanez Model 2337DX (Gibson Les Paul Special copy), sunburst, SOLD! Photo How much? 1970s Ibanez Model 2351M (Gibson Les Paul Standard copy), sunburst, SOLD! Photo How much? 1975 Ibanez Model 2351M (Gibson Les Paul Standard copy), sunburst, SOLD! Photo How much? 1981 Ibanez PF350, black, SOLD! Photo How much? 2016 Ibanez PS-40BK Paul Stanley Signature - KISS ARMY, black, SOLD! Photo How much? 2009 Ibanez Prestige RG1570 LH, black, SOLD! Photo How much? 2008 Ibanez Prestige RG2550Z-BK, black, SOLD! Photo How much? Ibanez RG421, Mahogany Oil, SOLD! Photo How much? Ibanez RG950QMZ-RDT, cherry, SOLD! Photo How much? 2007 Ibanez RGR321EX, black, SOLD! Photo How much? 1978 Ibanez Rocket Roll Sr, mahogany, SOLD! Photo How much? Ibanez Silver Cadet, black, SOLD! Photo How much? 2004 Jackson JS30RR, black, SOLD! Photo How much? Jackson X Series King V KVXMB, Kawasabi Green, SOLD! Photo How much? 2017 Kiesel Vader V8, Blue Denim, SOLD! Photo How much? Kramer 600ST Striker, white, SOLD! Photo How much? LTD ST-203, sunburst, SOLD! Photo How much? 1957 Levin solid body, mahogany, SOLD! Photo How much? 1960s Lindell (Teisco), sunburst, SOLD! Photo How much? Line 6 Shuriken Variax SR270, black, SOLD! Photo How much? 2003 Line 6 Variax, black, SOLD! Photo How much? Line 6 Variax JTV-69, black, SOLD! Photo How much? 1965 Magnatone Zephyr, refin purple, SOLD! Photo How much? 1970s Maya Les Paul copy, sunburst, SOLD! Photo How much? Mosrite 64 Reissue, sunburst, SOLD! Photo How much? 1967 Mosrite The Ventures Model, metallic red, SOLD! Photo How much? 1984 Mosrite VIII, black, SOLD! Photo How much? 1962 National Val-Pro 82, red, SOLD! Photo How much? 1960 National Val-Trol Custom, black, SOLD! Photo How much? 1980s-1990s Noname Skull Guitar, skulls, SOLD! Photo How much? 1968 Noname Telecaster copy, Olympic White, SOLD! Photo How much? Nystedt Stratochrister HPD, Olympic White, SOLD! Photo How much? 1973 Ovation Breadwinner, white, SOLD! Photo How much? 1975 Ovation Deacon, sunburst, SOLD! Photo How much? 2015 PRS Artist Pack P245 Black Gold Wrap Ebony Fretboard, Black Gold, SOLD! Photo How much? 1993 PRS Custom 24, Tortiose Shell, SOLD! Photo How much? 2014 PRS Custom 24, Blood Orange, SOLD! Photo How much? 1998 PRS McCarty, vintage yellow, SOLD! Photo How much? 2009 PRS SE EG SSS, white, SOLD! Photo How much? 2008 Parker Fly Deluxe, Ice Blue Burst, SOLD! Photo How much? 1997 Parker Fly Supreme CV TEG, natural, SOLD! Photo How much? 2000 Parker Fly Supreme CV/TEG, natural, SOLD! Photo How much? 1985 Peavey T-60, natural, SOLD! Photo How much? 2005 Rickenbacker 360-12 Deluxe, Fireglo, SOLD! Photo How much? 2004 Rickenbacker Model 350/12V63, black, SOLD! Photo How much? 1974 Rickenbacker Model 480, black, SOLD! Photo How much? 1990 Rickenbacker Model 620-12, black, SOLD! Photo How much? 1970s Rokkomann Deluxe, black, SOLD! Photo How much? 1981 Roland GR G-505, Candy Apple Red, SOLD! Photo How much? 2014 Ruokangas Mojo Grande, sunburst, SOLD! Photo How much? 2015 Schecter Blackjack SLS C-1P, See Thru Blue Burst, SOLD! Photo How much? Schecter Omen Extreme 7 str Diamond series, red, SOLD! Photo How much? 1970s Sigma Les Paul copy, sunburst, SOLD! Photo How much? 1960s Silvertone, black, SOLD! Photo How much? 1960s Silvertone, cherry, SOLD! Photo How much? 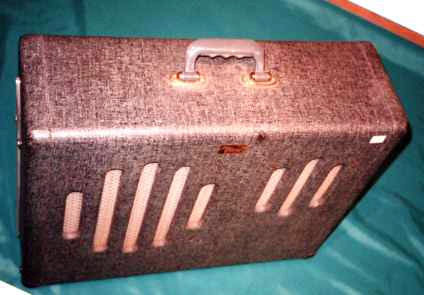 1960s Silvertone Amp-In-Case, black, SOLD! Photo How much? 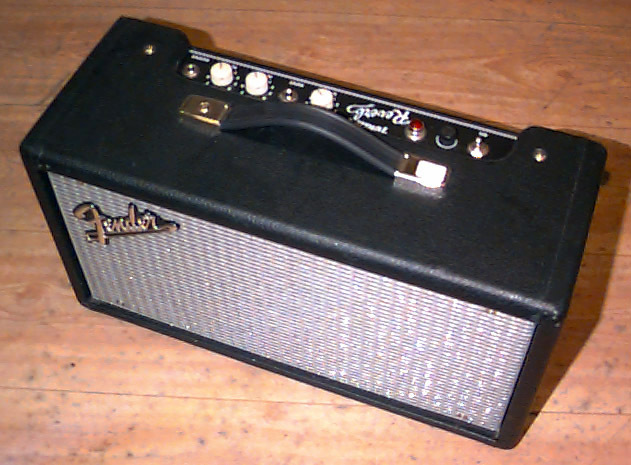 1961 Silvertone Amp-In-Case, black, SOLD! Photo How much? 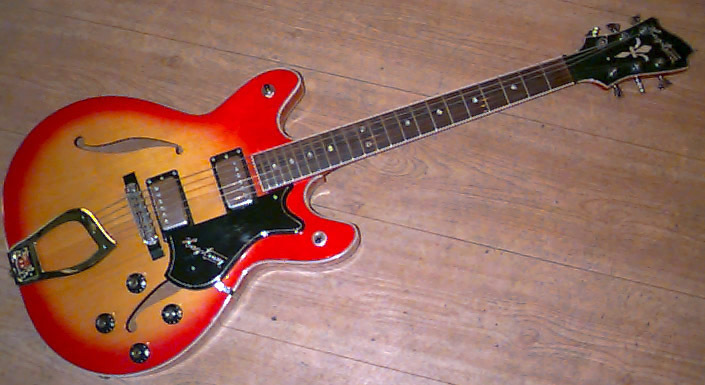 1966 Silvertone Coral Hornet 2, sunburst, SOLD! Photo How much? 1962 Silvertone Model 1448 Amp-In-Case, black sparkle, SOLD! Photo How much? 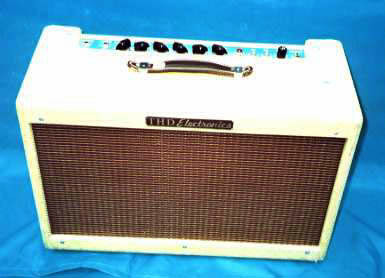 1963 Silvertone Model 1457 Amp-In-Case, sunburst, SOLD! Photo How much? 1950s Silvertone Thin Twin, sunburst, SOLD! Photo How much? 1956 Silvertone Thin Twin Jimmy Reed Model 1382L, sunburst, SOLD! Photo How much? 2001 Squier Affinity Stratocaster, black, SOLD! Photo How much? 2005 Squier Affinity Stratocaster, sunburst, SOLD! Photo How much? Squier Affinity Stratocaster SB RW, sunburst, SOLD! Photo How much? Squier Affinity Telecaster, Metallic Grey, SOLD! Photo How much? 1991-1992 Squier Hank Marvin Signature Stratocaster, Fiesta Red, SOLD! Photo How much? 2015 Squier Mini Strat, black, SOLD! Photo How much? Squier Standard Telecaster, sunburst, SOLD! Photo How much? Squier Strat, black, SOLD! Photo How much? 1983 Squier Stratocaster, black, SOLD! Photo How much? 1983 Squier Stratocaster, white, SOLD! Photo How much? 1984 Squier Stratocaster, Fiesta Red, SOLD! Photo How much? 1984-1987 Squier Stratocaster '60s Reissue Japan, black, SOLD! Photo How much? 2007 Squier Stratocaster VII, sunburst, SOLD! Photo How much? 1998 Squier Telecaster Thinline, cherry, SOLD! Photo How much? 1966 Standel Custom Deluxe Model 101, black, SOLD! Photo How much? 2015 Strandberg Boden OS6, cherry, SOLD! Photo How much? 2016 Supro Americana Coronado II, black, SOLD! Photo How much? 1964 Supro Holiday, white, SOLD! Photo How much? 1970s Takeharu Super Sounds, sunburst, SOLD! Photo How much? 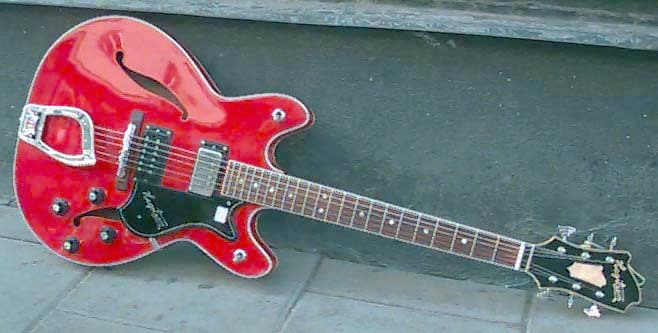 1960s Teisco, red, SOLD! Photo How much? 1960s Teisco Del Rey ET-460, blue, SOLD! Photo How much? 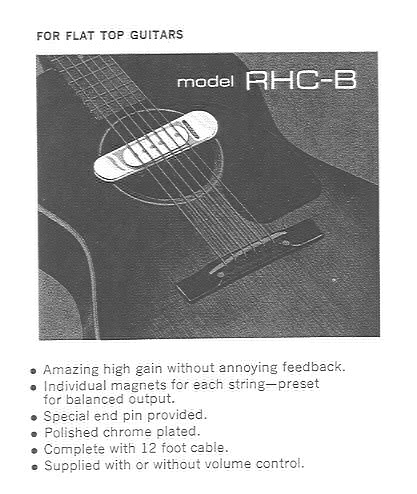 1989 The Heritage H-170CM, sunburst, SOLD! Photo How much? 1988/1989 Tom Anderson Drop Top, amber, SOLD! Photo How much? 2014 True Temperament Telecaster, sunburst, SOLD! Photo How much? 1970s Univox Mosrite-copy, natural, SOLD! Photo How much? 1960s Vox Hurricane, white, SOLD! Photo How much? 1992 Washburn MG24 Mercury Series, purple, SOLD! Photo How much? 2007 Washburn N2 Nuno Bettencourt, natural, SOLD! Photo How much? Westerberg TC-32, purple, SOLD! Photo How much? 1988 Yamaha RGX312, red, SOLD! Photo How much? Yamaha RGX320FZ Double Cutaway, black, SOLD! Photo How much? 1998 Cort TRG-1, transparent orange, SOLD! Photo How much? 2003 D'Aquisto Jazz Line DQ-JZ, natural, SOLD! Photo How much? 2000s DeArmond Starfire IV, cherry, SOLD! Photo How much? 2000s DeArmond Starfire IV, natural, SOLD! Photo How much? 1960s Eko Model 290, sunburst, SOLD! Photo How much? 2001 Epiphone AlleyKat, transparent black, SOLD! Photo How much? 1967 Epiphone Casino, sunburst, SOLD! Photo How much? 1999 Epiphone DOT, natural, SOLD! Photo How much? 2000s Epiphone ES335 DOT, black, SOLD! Photo How much? 1966 Epiphone Riviera, sunburst, SOLD! Photo How much? 1967 Epiphone Riviera Model E360TD, sunburst, SOLD! Photo How much? 1996 Epiphone Sheraton II, sunburst, SOLD! Photo How much? 2004 Epiphone Sheraton II, Vintage Sunburst, SOLD! Photo How much? 1966 Epiphone Sorrento E452TD, sunburst, SOLD! Photo How much? 2002 Epiphone Wildkat, natural, SOLD! Photo How much? 1967 Fender Coronado II, red, SOLD! Photo How much? 1975 Fender Starcaster, black, SOLD! Photo How much? 2013 Gibson 1963 ES-335 Block Reissue, cherry, SOLD! Photo How much? 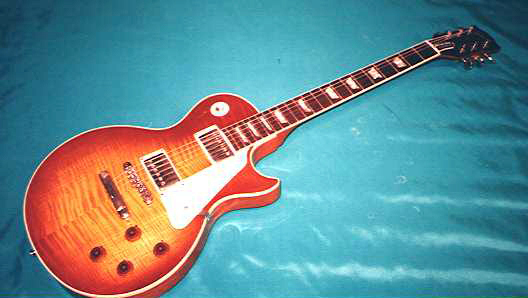 1992 Gibson B.B. King Custom, black, SOLD! Photo How much? 2003 Gibson B.B. King Lucille, cherry, SOLD! Photo How much? 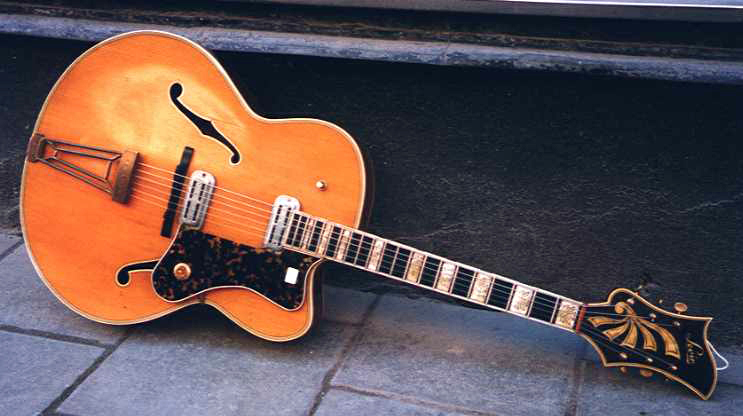 1957 Gibson Byrdland, natural, SOLD! Photo How much? 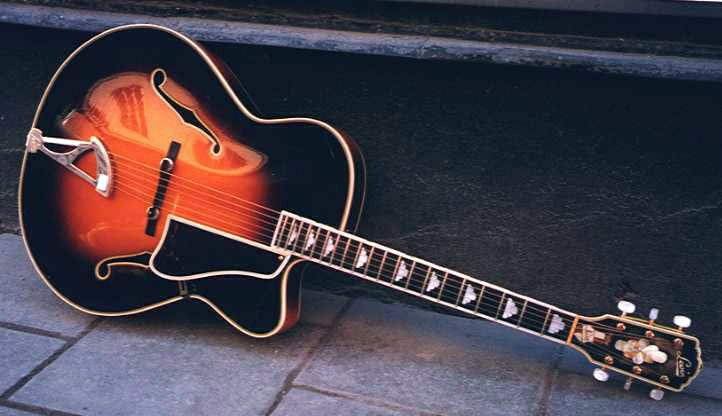 1968 Gibson Byrdland, sunburst, SOLD! Photo How much? 1969 Gibson Byrdland, sunburst, SOLD! Photo How much? 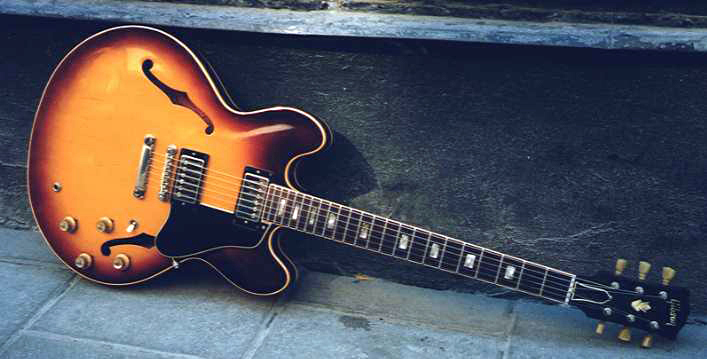 1963 Gibson ES-125TC, sunburst, SOLD! Photo How much? 1967 Gibson ES-125TDC, sunburst, SOLD! Photo How much? 1996 Gibson ES-135, sunburst, SOLD! Photo How much? 1996 Gibson ES-135, black, SOLD! Photo How much? 1997 Gibson ES-135, black, SOLD! Photo How much? 2005 Gibson ES-137 Classic, sunburst, SOLD! Photo How much? 2003 Gibson ES-137C, sunburst, SOLD! Photo How much? 2004 Gibson ES-137C, sunburst, SOLD! Photo How much? 1956 Gibson ES-225T, sunburst, SOLD! Photo How much? 1972 Gibson ES-325TD, walnut, SOLD! Photo How much? 1974 Gibson ES-325TD, Walnut, SOLD! Photo How much? 1963 Gibson ES-330TDC, cherry, SOLD! Photo How much? 1965 Gibson ES-330TDC, cherry, SOLD! Photo How much? 1966 Gibson ES-330TD, sunburst, SOLD! Photo How much? 1967 Gibson ES-330TD, sunburst, SOLD! Photo How much? 1969 Gibson ES-330TD, sunburst, SOLD! Photo How much? 2002 Gibson ES-333, faded cherry, SOLD! Photo How much? 2017 Gibson ES-335, cherry, SOLD! Photo How much? 2015 Gibson ES-335 Studio, sunburst, SOLD! Photo How much? 1960 Gibson ES-335TD, sunburst, SOLD! Photo How much? 1964 Gibson ES-335TD, sunburst, SOLD! Photo How much? 1968 Gibson ES-335TD, sunburst, SOLD! Photo How much? 1964 Gibson ES-335TDC, cherry, SOLD! Photo How much? 1966 Gibson ES-335TDC, cherry, SOLD! Photo How much? 1970 Gibson ES-335TDW, walnut, SOLD! Photo How much? 1972 Gibson ES-335TD, sunburst, SOLD! Photo How much? 1973 Gibson ES-335TD, cherry, SOLD! Photo How much? 1981 Gibson ES-335DOT, cherry, SOLD! Photo How much? 1981 Gibson ES-335DOT, natural, SOLD! Photo How much? 1982 Gibson ES-335DOT, sunburst, SOLD! Photo How much? 1982 Gibson ES-335DOT, natural, SOLD! Photo How much? 1987 Gibson ES-335DOT, natural, SOLD! Photo How much? 1991 Gibson ES-335DOT, natural, SOLD! Photo How much? 1998 Gibson ES-335, black, SOLD! Photo How much? 2001 Gibson ES-335, natural, SOLD! Photo How much? 2001 Gibson ES-335, cherry, SOLD! Photo How much? 1968 Gibson ES-340TDN, natural, SOLD! Photo How much? 1969 Gibson ES-345TDC, cherry, SOLD! Photo How much? 1973 Gibson ES-345TD, walnut, SOLD! Photo How much? 1977 Gibson ES-345TD, walnut, SOLD! Photo How much? 1980 Gibson ES-347, sunburst, SOLD! Photo How much? 1977 Gibson ES-350T, sunburst, SOLD! Photo How much? 1977 Gibson ES-350T, black, SOLD! Photo How much? 1962 Gretsch 6120, orange, SOLD! Photo How much? 2002 Gretsch 6122JR, mahogany, SOLD! Photo How much? 1975 Gretsch Chet Atkins Country Gentleman (Model 7670), walnut, SOLD! Photo How much? 1964 Gretsch Chet Atkins Tennessean (Model 6119), mahogany, SOLD! Photo How much? 1965 Gretsch Chet Atkins Tennessean (Model 6119), faded dark cherry, SOLD! Photo How much? 1967 Gretsch Chet Atkins Tennessean (Model 6119), cherry, SOLD! Photo How much? 1971 Gretsch Chet Atkins Tennessean (Model 6119), mahogany, SOLD! Photo How much? 1965 Gretsch Chet Atkins Country Gentleman, mahogany, SOLD! Photo How much? 1967-1969 Gretsch Chet Atkins Country Gentleman, mahogany, SOLD! Photo How much? 1969 Gretsch Chet Atkins Country Gentleman, mahogany, SOLD! Photo How much? 1969 Gretsch Chet Atkins Nashville, orange, SOLD! Photo How much? 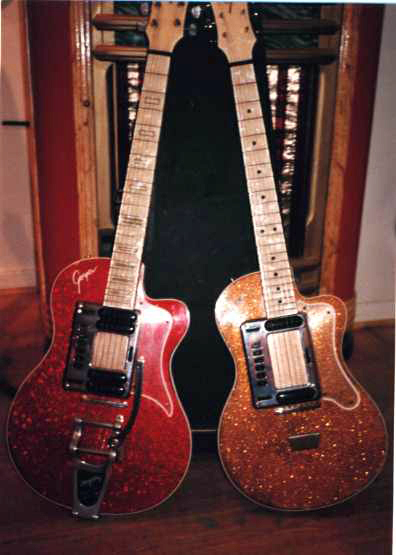 1967 Gretsch Monkees, red, SOLD! Photo How much? 1966 Guild Starfire IV, cherry, SOLD! Photo How much? 1966 Guild Starfire IV, sunburst, SOLD! Photo How much? 1974 Guild Starfire IV, cherry, SOLD! Photo How much? 1960 Guild T-50, sunburst, SOLD! Photo How much? 1967 Guild T-100, sunburst, SOLD! Photo How much? 1967 Hagström Viking 12-string, black, SOLD! Photo How much? 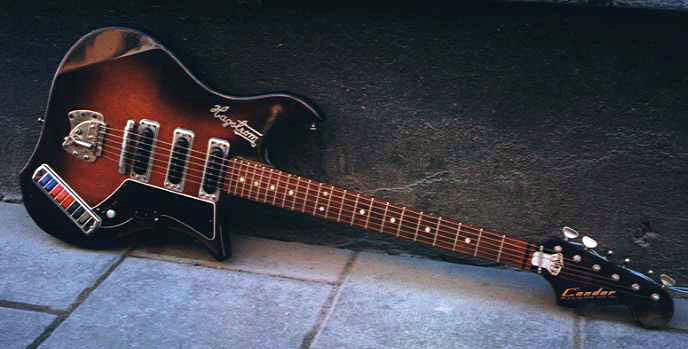 1965 Hagström Viking I, sunburst, first issue model, SOLD! Photo How much? 1965 Hagström Viking I, sunburst, SOLD! Photo How much? 1967 Hagström Viking, cherry, SOLD! Photo How much? 1967 Hagström Viking, sunburst, SOLD! Photo How much? 1967 Hagström Viking, black, SOLD! Photo How much? 1967 Hagström Viking II, sunburst, SOLD! Photo How much? 1972 Hagström Viking IN, cherry, SOLD! Photo How much? 1972 Hagström Viking IN, sunburst, SOLD! Photo How much? 1972 Hagström Viking IN, natural, SOLD! Photo How much? 1972 Hagström Viking IN, bubinga, SOLD! Photo How much? 1973 Hagström Viking IN, sunburst, SOLD! Photo How much? 1973 Hagström Viking IN, cherry, SOLD! Photo How much? 1974 Hagström Viking IN, cherry, SOLD! Photo How much? 1974 Hagström Viking IN, natural, SOLD! Photo How much? 1974 Hagström Viking IN, sunburst, SOLD! Photo How much? 1975 Hagström Viking IN, cherry, SOLD! Photo How much? 1967 Hagström Viking XII, black, SOLD! Photo How much? 1967 Hagström Viking XII, black, 12-string, SOLD! Photo How much? 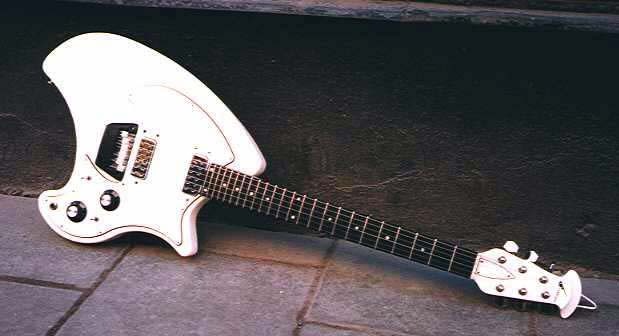 1978 Hagström Viking, white, SOLD! Photo How much? 1979 Hagström Viking, white, SOLD! Photo How much? 1979 Hagström Viking, sunburst, SOLD! Photo How much? 1979 Hagström Viking, cherry, SOLD! Photo How much? 1967 Hagström De Luxe, cherry, SOLD! Photo How much? 1967 Hagström De Luxe, sunburst, SOLD! Photo How much? Hagström Super Viking, cherry, SOLD! Photo How much? 1956 Höfner Club 50, sunburst, SOLD! Photo How much? 1961 Höfner Club 50, natural, SOLD! Photo How much? 1961 Höfner Model 4570, sunburst, SOLD! Photo How much? 1965 Höfner Model 4570 Thinline President, sunburst, SOLD! Photo How much? 1960s Höfner Verithin, sunburst, SOLD! Photo How much? 1983 Ibanez AM-205, sunburst, SOLD! Photo How much? 1982 Ibanez AS-100, sunburst, SOLD! Photo How much? 1986 Ibanez AS-100, sunburst, SOLD! Photo How much? 2012 Ibanez JSM100 John Scofield, sunburst, SOLD! Photo How much? 1950s Levin one-of-a-kind, natural, SOLD! Photo How much? 1963 Levin Model 325/M2 Thinbody, sunburst, SOLD! Photo How much? 1965 Levin Model 340, mahogany, SOLD! Photo How much? 1964 Levin Model 350, black, SOLD! Photo How much? 1964 Levin Model 350, red, SOLD! Photo How much? 1966 Levin Model 350, black, SOLD! Photo How much? 1963 Levin Model 360, black, SOLD! Photo How much? 1966 Martin GT-75, burgundy, SOLD! Photo How much? 1970s Modern ES-335 copy, cherry, SOLD! Photo How much? 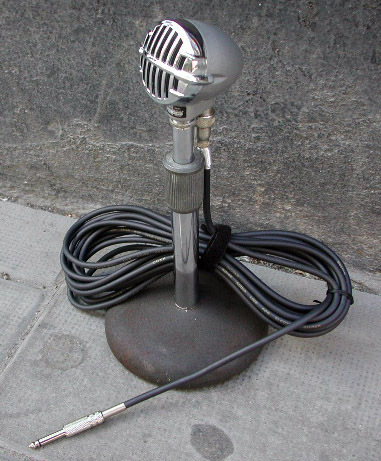 1950s Otwin Super Electric, black, SOLD! Photo How much? 2014 Rickenbacker 330, Fireglo, SOLD! Photo How much? 2004 Rickenbacker 360, Fireglo, SOLD! Photo How much? 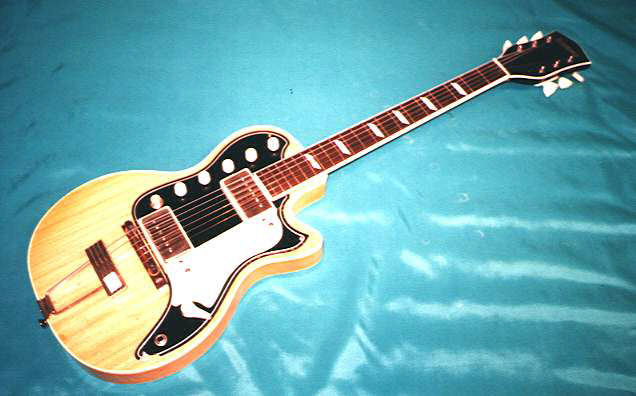 1992 Rickenbacker Model 330, Jetglo, SOLD! Photo How much? 1994 Rickenbacker Model 330, Jetglo, SOLD! Photo How much? 2003 Rickenbacker Model 330, Jetglo, SOLD! Photo How much? 1992 Rickenbacker Model 360/12V64, black, SOLD! Photo How much? 1968 Rickenbacker Model 370, burgundy, SOLD! Photo How much? 1960s Silvertone F64-JP, sunburst, SOLD! Photo How much? 1960s Silvertone Rocket, black, SOLD! Photo How much? 1990s Vintage VSA535, cherry, SOLD! Photo How much? 1990s Vintage VSA555, sunburst, SOLD! Photo How much? 2013 Voluptous Noise Darling, mahogany, SOLD! Photo How much? 2004 Yamaha SA2200, sunburst, SOLD! Photo How much? 1992 Cort York Town, sunburst, SOLD! Photo How much? 1948 Crafton Rex, sunburst, SOLD! Photo How much? 2000 DeArmond X-155, natural, SOLD! Photo How much? 2005 Eastman AR880CE John Pisano Signature, classic, SOLD! Photo How much? 2007 Eastman AR905CE, natural, SOLD! Photo How much? 1960s Eko Model 285, sunburst, SOLD! Photo How much? 1997 Epiphone Emperor Regent, sunburst, SOLD! Photo How much? 1992 Epiphone Joe Pass Emperor II, sunburst, SOLD! Photo How much? 2001 Epiphone Joe Pass Emperor II Pro, sunburst, SOLD! Photo How much? 1964 Gibson Barney Kessel Custom, sunburst, SOLD! Photo How much? 1972 Gibson ES-150DC, walnut, SOLD! Photo How much? 2001 Gibson ES-175 Reissue, natural, SOLD! Photo How much? 1974 Gibson ES-175D, sunburst, SOLD! Photo How much? 1953 Gibson ES-340 3/4, sunburst, SOLD! Photo How much? 1949 Gibson ES-5, sunburst, SOLD! Photo How much? 1998 Gibson ES-5 Switchmaster, natural, SOLD! Photo How much? 1950 Gibson ES-125, sunburst, SOLD! Photo How much? 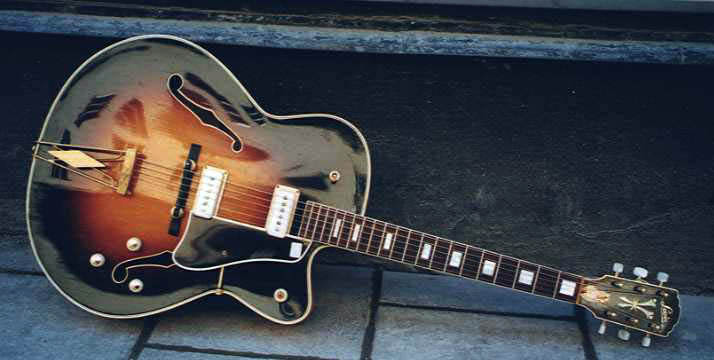 1954 Gibson ES-125, sunburst, SOLD! Photo How much? 1936 Gibson ES-150, black, SOLD! Photo How much? 1997 Gibson ES-165 Herb Ellis, sunburst, SOLD! Photo How much? 1956 Gibson ES-175, sunburst, changed pickup, SOLD! Photo How much? 1956 Gibson ES-175, sunburst, SOLD! Photo How much? 1958 Gibson ES-175D, sunburst, SOLD! Photo How much? 1961 Gibson ES-175D, sunburst, SOLD! Photo How much? 1962 Gibson ES-175D, sunburst, SOLD! Photo How much? 1963 Gibson ES-175D, sunburst, SOLD! Photo How much? 1969 Gibson ES-175D, sunburst, SOLD! Photo How much? 1979 Gibson ES-175D, sunburst, SOLD! Photo How much? 1980 Gibson ES-175D, sunburst, SOLD! Photo How much? 1988 Gibson ES-175, natural, SOLD! Photo How much? 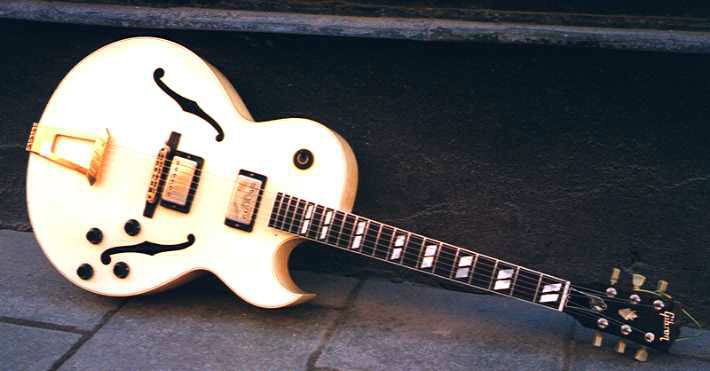 1988 Gibson ES-175, white, SOLD! Photo How much? 1997 Gibson ES-175, sunburst, SOLD! Photo How much? 1953 Gibson ES-295, all gold, SOLD! Photo How much? 1955 Gibson ES-295, 2-tone green!, SOLD! Photo How much? 1996 Gibson ES-295, wine red, SOLD! Photo How much? 1948 Gibson ES-350, natural, SOLD! Photo How much? 1994 Gibson L-4CES, sunburst, SOLD! Photo How much? 1969 Gibson L-5CES, sunburst, SOLD! Photo How much? 1993 Gibson L-5CES Custom Shop, natural, SOLD! Photo How much? 1949 Gibson Super 400 C, sunburst, added pickups, SOLD! Photo How much? 1968 Gibson Super 400 CES, sunburst, SOLD! Photo How much? 1970 Gibson S-400CES, black, SOLD! Photo How much? 2002 Gibson Super 400CES, sunburst, SOLD! Photo How much? 1959 Gretsch Anniversary, sunburst, SOLD! Photo How much? 1960 Gretsch Country Club, sunburst, SOLD! Photo How much? 1990s Gretsch G400MC Synchromatic, natural, SOLD! Photo How much? 2016 Gretsch G5420LH, orange, SOLD! Photo How much? 2013 Gretsch White Falcon (Model G6136T-LDS), white, SOLD! Photo How much? 1962 Guild CE-100, sunburst, SOLD! Photo How much? 1966 Guild CE-100D, sunburst, SOLD! Photo How much? 1961 Guild Manhattan X-175, sunburst, SOLD! Photo How much? 1954 Guild Stratford X-350, sunburst, SOLD! Photo How much? 1956 Guild Stratford X-375, natural, SOLD! Photo How much? 1997 Guild X-170T Manhattan, natural, SOLD! Photo How much? 1969 Hagström Jimmy, natural, SOLD! Photo How much? 1976 Hagström Jimmy, natural, SOLD! Photo How much? 1977 Hagström Jimmy, natural, SOLD! Photo How much? 1979 Hagström Jimmy, sunburst, SOLD! Photo How much? 1979 Hagström Jimmy, black, SOLD! Photo How much? 1977 Hagström Jimmy F-hole, sunburst, SOLD! Photo How much? 1967/1995 Hagström/Mabass , natural, SOLD! Photo How much? 1958 Höfner Model 468/S/E2 Committee, natural, SOLD! Photo How much? 1970s Hoyer Model 75, sunburst, SOLD! Photo How much? 2003 Ibanez Artcore AF75, sunburst, SOLD! Photo How much? 1980 Ibanez GB-10 George Benson, sunburst, SOLD! Photo How much? 1979 Ibanez George Benson GB10, natural, SOLD! Photo How much? 1979 Ibanez George Benson GB20, sunburst, SOLD! Photo How much? 1980 Ibanez Joe Pass JP20, sunburst, SOLD! Photo How much? 1988 Ibanez Joe Pass JP20, sunburst, SOLD! Photo How much? 1996 Ibanez Pat Metheny PM100, natural, SOLD! Photo How much? 1959 Kay Barney Kessel Pro, sunburst, SOLD! Photo How much? 1948 Levin Model 4 Orchestra, sunburst, converted to cutaway and electric, SOLD! Photo How much? 1960 Levin Model 315/M1, sunburst, SOLD! Photo How much? 1961 Levin Model 315/M2, sunburst, SOLD! Photo How much? 1962 Levin Model 315/M2, sunburst, SOLD! Photo How much? 1963 Levin Model 315N/M2, natural, SOLD! Photo How much? 1958 Levin Model 320/M2, sunburst, SOLD! Photo How much? 1958 Levin Model 320N/M2, natural, 320N converted to 320N/M2 in 1964 SOLD! Photo How much? 1960 Levin Model 320/M2, sunburst, SOLD! Photo How much? 1961 Levin Model 320N/M2, natural, SOLD! Photo How much? 1964 Levin Model 320N/M2, natural, SOLD! Photo How much? 1964 Levin Model 320/M2, sunburst, SOLD! Photo How much? 1965 Levin Model 320/M2, sunburst, SOLD! Photo How much? 1959 Levin Model 325/M2, sunburst, SOLD! Photo How much? 1960 Levin Model 325/M2, sunburst, SOLD! Photo How much? 1961 Levin Model 325/M2, sunburst, SOLD! Photo How much? 1965 Levin Model 325/M2, sunburst, SOLD! Photo How much? 1958 Levin Model 330N/M2, natural, SOLD! Photo How much? 1961 Levin Model 330/M2, sunburst, SOLD! Photo How much? 1959 Levin Model 335/M2, sunburst, SOLD! Photo How much? 1960 Levin Model 335/M2, sunburst, SOLD! Photo How much? 1973 Rokkoman ES-175 copy, sunburst, SOLD! Photo How much? 1948 Crafton Model 71 Rex, sunburst, SOLD! Photo How much? 1951 Crafton Model 73, sunburst, SOLD! Photo How much? 1950 Crafton Model 75, sunburst, SOLD! Photo How much? 1930s Gibson "Black Special #2", black, SOLD! Photo How much? 1914 Gibson L-1, natural, SOLD! Photo How much? 1920 Gibson L-3, black top, SOLD! Photo How much? 1936 Gibson L-30, sunburst, SOLD! Photo How much? 1936 Gibson L-30, black, SOLD! Photo How much? 1933 Gibson L-4, sunburst, SOLD! Photo How much? 1954 Gibson L-4, sunburst, SOLD! Photo How much? 1937 Gibson L-5, refin sunburst, SOLD! Photo How much? 1939 Gibson L-5, sunburst, SOLD! Photo How much? 1947 Gibson L-5, sunburst, SOLD! Photo How much? 1947 Gibson L-7, sunburst, SOLD! Photo How much? 1947 Gibson L-7, black, SOLD! Photo How much? 1932 Gibson L-10, black, SOLD! Photo How much? 1938 Gibson Super 400, sunburst, SOLD! Photo How much? 1952 Gibson TG-50 Tenor Guitar, sunburst, SOLD! Photo How much? 1940 Gretsch Synchromatic 400, sunburst, SOLD! Photo How much? 1956 Gretsch Corsair, sunburst, SOLD! Photo How much? 1950s Harmony H1214, butterscotch, SOLD! Photo How much? 1950s Höfner Model 458, black, SOLD! Photo How much? 1955 Höfner Model 461/S, black, SOLD! Photo How much? 1976 Ibanez Model 2461 Johnny Smith, natural, SOLD! Photo How much? 1980 Ibanez Model FA-800BS, sunburst, SOLD! Photo How much? 1940s Kalamazoo KTG-22 Tenor Guitar, sunburst, SOLD! Photo How much? 1941 Kay-Tone Emperor, natural, made by Levin SOLD! Photo How much? 1945 Kay-Tone Emperor, natural, made by Levin SOLD! Photo How much? 1941 Kay-Tone Count, natural, made by Levin SOLD! Photo How much? 1945 Kay-Tone Count, natural, made by Levin SOLD! Photo How much? 1942 Kay-Tone Duke, natural, made by Levin SOLD! Photo How much? 1944 Kay-Tone Duke, natural, made by Levin SOLD! Photo How much? ca 1942 Levin De Luxe, sunburst, top-of-the-line Levin deluxe model, SOLD! Photo How much? 1946 Levin De Luxe, sunburst, SOLD! Photo How much? Early 1940s Levin De Luxe, refinished sunburst, top-of-the-line Levin deluxe model, SOLD! Photo How much? 1945 Levin De Luxe, refinished sunburst, top-of-the-line Levin deluxe model, SOLD! Photo How much? 1945 Levin De Luxe, sunburst, top-of-the-line Levin deluxe model, SOLD! Photo How much? 1946 Levin De Luxe, sunburst, top-of-the-line Levin deluxe model, SOLD! Photo How much? 1947 Levin De Luxe, sunburst, top-of-the-line Levin deluxe model, SOLD! Photo How much? 1937 Levin Model ?, sunburst, SOLD! Photo How much? 1949 Levin Model 1N De Luxe, natural, top-of-the-line Levin deluxe model, SOLD! Photo How much? 1950 Levin Model 1 De Luxe, sunburst, top-of-the-line Levin deluxe model, SOLD! Photo How much? 1950 Levin Model 1N De Luxe, natural, top-of-the-line Levin deluxe model, SOLD! Photo How much? 1951 Levin Model 1N De Luxe, natural, SOLD! Photo How much? 1951 Levin Model 1N De Luxe, natural, added pickups, top-of-the-line Levin deluxe model, SOLD! Photo How much? 1951 Levin Model 1N De Luxe, natural, top-of-the-line Levin deluxe model, SOLD! Photo How much? 1951 Levin Model 1 De Luxe, sunburst, top-of-the-line Levin deluxe model, SOLD! Photo How much? 1952 Levin Model 1 De Luxe, sunburst, top-of-the-line Levin deluxe model, SOLD! Photo How much? 1954 Levin Model 1 De Luxe, sunburst, top-of-the-line Levin deluxe model, SOLD! Photo How much? 1955 Levin Model 1N De Luxe, refinished black, top-of-the-line Levin deluxe model, SOLD! Photo How much? 1947 Levin Model 1N De Luxe, natural, top-of-the-line Levin deluxe model, SOLD! Photo How much? 1947 Levin Model 1 De Luxe, sunburst, top-of-the-line Levin deluxe model, SOLD! Photo How much? 1948 Levin Model 1N De Luxe, natural, top-of-the-line Levin deluxe model, SOLD! Photo How much? 1947 Levin Model 2 Solist, sunburst, SOLD! Photo How much? 1950 Levin Model 2 Solist, sunburst, SOLD! Photo How much? 1951 Levin Model 2 Solist, refinished black, SOLD! Photo How much? 1951 Levin Model 2 Solist, sunburst, SOLD! Photo How much? 1952 Levin Model 2 Solist, sunburst, SOLD! Photo How much? 1952 Levin Model 2N Solist, natural, SOLD! Photo How much? 1953 Levin Model 2N Solist, natural, SOLD! Photo How much? 1954 Levin Model 2 Solist, sunburst, SOLD! Photo How much? 1955 Levin Model 2 Solist, sunburst, SOLD! Photo How much? 1948 Levin Model 3 Royal, sunburst, SOLD! Photo How much? 1949 Levin Model 3N Royal, natural, SOLD! Photo How much? 1950 Levin Model 3 Royal, sunburst, SOLD! Photo How much? 1951 Levin Model 3N Royal, natural, SOLD! Photo How much? 1951 Levin Model 3 Royal, refinished black top, SOLD! Photo How much? 1951 Levin Model 3 Royal, refinished black, SOLD! Photo How much? 1952 Levin Model 3N Royal, natural, SOLD! Photo How much? 1953 Levin Model 3 Royal, faded sunburst, SOLD! Photo How much? 1954 Levin Model 3 Royal, sunburst, SOLD! Photo How much? 1950 Levin Model 4N Orchestra, natural, SOLD! Photo How much? 1957 Levin Model 4 Orchestra, sunburst, cutaway, SOLD! Photo How much? 1951 Levin Model 5N Star, natural, SOLD! Photo How much? 1951 Levin Model 6 Dansant, faded sunburst, SOLD! Photo How much? 1938 Levin Model 20, sunburst, SOLD! Photo How much? 1939 Levin Model 20, sunburst, SOLD! Photo How much? 1941 Levin Model 22, sunburst, SOLD! Photo How much? 1944 Levin Model 22, sunburst, SOLD! Photo How much? 1945 Levin Model 22, sunburst, SOLD! Photo How much? 1939 Levin Model 25, sunburst, SOLD! Photo How much? 1942 Levin Model 32, sunburst, SOLD! Photo How much? 1946 Levin Model 32, sunburst, SOLD! Photo How much? 1940 Levin Model 35, sunburst, SOLD! Photo How much? 1944 Levin Model 35, sunburst, SOLD! Photo How much? 1945 Levin Model 35, sunburst, SOLD! Photo How much? 1933 Levin Model 170, sunburst, SOLD! Photo How much? 1935 Levin Model 170, sunburst, missing pickguard, SOLD! Photo How much? 1931 Levin Model 180, sunburst, banjo-style head, SOLD! Photo How much? 1959 Levin Model 315, sunburst, added pickup, SOLD! Photo How much? 1960 Levin Model 315, sunburst, SOLD! Photo How much? 1961 Levin Model 315N, natural, SOLD! Photo How much? 1968 Levin Model 315, sunburst, SOLD! Photo How much? 1959 Levin Model 320, sunburst, SOLD! Photo How much? 1962 Levin Model 320, refinished black, SOLD! Photo How much? 1959 Levin Model 330, sunburst, SOLD! Photo How much? 1961 Levin Model 330, sunburst, SOLD! Photo How much? 1959 Levin Model 335, sunburst, SOLD! Photo How much? 1960 Levin Model 335, sunburst, SOLD! Photo How much? 1955 Levin Model 6 Dansant, sunburst, SOLD! Photo How much? 1941 Levin Royal, sunburst, SOLD! Photo How much? 1942 Levin Royal, sunburst, SOLD! Photo How much? 1944 Levin Royal, sunburst, SOLD! Photo How much? 1946 Levin Royal, sunburst, SOLD! Photo How much? 1938 Levin Solist, sunburst, SOLD! Photo How much? 1940 Levin Solist, sunburst, SOLD! Photo How much? 1943 Levin Solist, sunburst, SOLD! Photo How much? 1961 Melodija Menges archtop, sunburst, SOLD! Photo How much? 1940s Ramona Eriksberg, sunburst, SOLD! Photo How much? 1934 Regal G-680, walnut, SOLD! Photo How much? 1950s SS Stewart Model 7001, natural, SOLD! Photo How much? 1930s A. 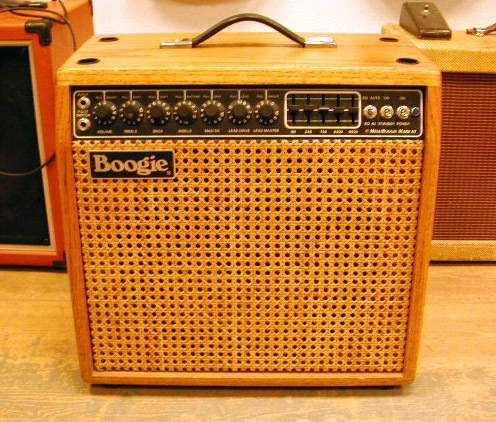 Di Mauro Model Boogie Woogie, natural, SOLD! Photo How much? 1992 Academy shallow bowl, black, SOLD! Photo How much? 2000s Akustica Model 758008, black, SOLD! Photo How much? 2006 AJL Model-503 Selmer-copy, vintage colored top, SOLD! Photo How much? 2002 AJL Standard Model-Jazz Selmer-copy, aged colored top, SOLD! Photo How much? 2002 AJL Standard Model-Jazz Selmer-copy, natural, SOLD! Photo How much? 2003 AJL Standard Model-Jazz Selmer-copy, natural, SOLD! Photo How much? 2004 AJL Standard Model-Jazz Selmer-copy, aged colored top, SOLD! Photo How much? 2003 AJL Andreas Öberg Signature Model Selmer-copy, natural, SOLD! Photo How much? 1925 Alfred Brock Lady Lute, natural, SOLD! Photo How much? 1990s Alvarez Artist Model 5072, natural, SOLD! Photo How much? 1950s Anastasio Selmer-copy, natural, SOLD! Photo How much? Anderwood LT-0MME, natural, SOLD! Photo How much? 1980s Aria LW-15, natural, SOLD! Photo How much? 1960s Paul Beuscher Selmer-copy, dark natural, SOLD! Photo How much? 1950s Bjärton Anita, natural, SOLD! Photo How much? 1957 Bjärton Anita, natural, SOLD! Photo How much? 1975 Bjärton B-120 Standard, natural, SOLD! Photo How much? 1972 or 1976 Bjärton BJ-12 De Luxe, sunburst, SOLD! Photo How much? 1976 Bjärton BJ-12 De Luxe, natural, SOLD! Photo How much? ca 1978 Bjärton BJ-12 De Luxe, natural, SOLD! Photo How much? ca 1981 Bjärton BJ-12 De Luxe, natural, SOLD! Photo How much? 1965 Bjärton BJ-12 EL, sunburst, SOLD! Photo How much? 1988 Bjärton BR-60 NF, natural, SOLD! Photo How much? 1987 Bjärton BW-50, natural, SOLD! Photo How much? 1980s Bjärton BW-50, natural, SOLD! Photo How much? 1968 Bjärton Carmencita, sunburst, SOLD! Photo How much? 1980 Bjärton Carola, natural, SOLD! Photo How much? ca 1983 Bjärton Carola, natural, SOLD! Photo How much? 1961 Bjärton Isabella, natural, SOLD! Photo How much? 1964 Bjärton Isabella, natural, SOLD! Photo How much? 1960s Bjärton Isabella, natural, SOLD! Photo How much? 1969 Bjärton Isabella, natural, SOLD! Photo How much? 1967 Bjärton Jimmy, natural, SOLD! Photo How much? 1962 Bjärton Junior De Luxe, natural, SOLD! Photo How much? 1959 Bjärton Minor, natural, SOLD! Photo How much? 1963 Bjärton Minor, natural, SOLD! Photo How much? 1964 Bjärton Minor, natural, SOLD! Photo How much? 1965 Bjärton Minor, natural, SOLD! Photo How much? 1968 Bjärton Minor, sunburst, SOLD! Photo How much? 1968 Bjärton Minor, natural, SOLD! Photo How much? 1973 Bjärton Minor, natural, SOLD! Photo How much? 1974 Bjärton Minor, natural, SOLD! Photo How much? 1966 Bjärton Sammy, sunburst, SOLD! Photo How much? 1966 Bjärton Senorita, natural, SOLD! Photo How much? 1960s Bjärton Señorita, natural, SOLD! Photo How much? 1972 Bjärton Minor, natural, SOLD! Photo How much? 2015 Blueridge BR-143A, natural, SOLD! Photo How much? Blueridge BR-160 A, natural, SOLD! Photo How much? Blueridge BR-160 X, natural, SOLD! Photo How much? 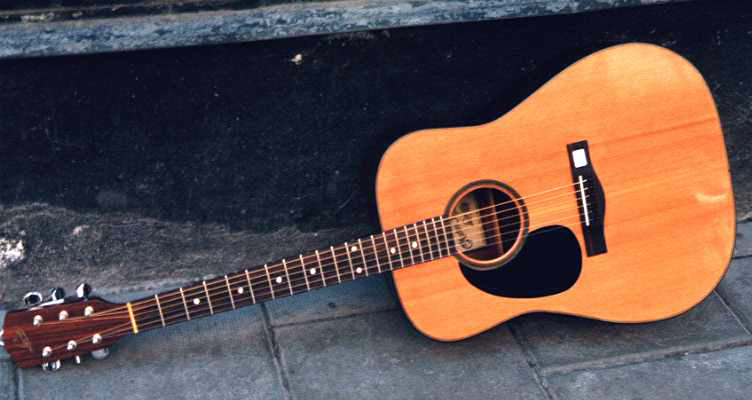 Blueridge BR-163 A, natural, SOLD! Photo How much? Blueridge BR-163 X, natural, SOLD! Photo How much? Blueridge BR-180C, natural, SOLD! Photo How much? Blueridge BR-183, natural, SOLD! Photo How much? Blueridge BR-260A, natural, SOLD! Photo How much? Blueridge BR-341, natural, SOLD! Photo How much? Blueridge BR-361, natural, SOLD! Photo How much? Blueridge BR-70, natural, SOLD! Photo How much? Blueridge BR_143C, natural, SOLD! Photo How much? 1949 Bo Wretling , natural, SOLD! Photo How much? 1948 Bo Wretling Basluta (12-string Lute), natural SOLD! Photo How much? 1952 Bo Wretling Typ 10, natural, SOLD! Photo How much? 1948 Bob West F-47, natural, SOLD! Photo How much? 1935 Bruno Hawaiian motif, sunburst, SOLD! Photo How much? 1980s Cantus CW-85, black, SOLD! Photo How much? 1940s Castelluccia Selmer-copy, natural, SOLD! Photo How much? 1970s Cimar Hummingbird-copy, sunburst, SOLD! Photo How much? 1970s/1980s Cimar Model 394, natural, SOLD! Photo How much? Cort Earth 100 LH, natural, SOLD! Photo How much? 2007 Cort Earth 70ENS, natural, SOLD! Photo How much? 2010 Cort Earth Grand Open Pore, natural, SOLD! Photo How much? Cort MR730FX, natural, SOLD! Photo How much? 1947 Crafton Lute Guitar, natural, SOLD! Photo How much? 1949 Crafton Model 14, sunburst, SOLD! Photo How much? 1955 Crafton Model 38, natural, SOLD! Photo How much? 1980s CSL Selmer-copy, natural, SOLD! Photo How much? 1959 Crafton folk, natural, SOLD! Photo How much? 1982 Daion B-54E, cherry, SOLD! Photo How much? 1980 Daion Mugen Mark III, natural, SOLD! Photo How much? 1980 Daion The '80 Double-Neck, stained mahogany, SOLD! Photo How much? 1981 Daion The '81 Caribou, natural, SOLD! Photo How much? 2008 Dean VCO CBK, black, SOLD! Photo How much? 1999 Dell Arte Sweet Chorus, Selmer Maccaferri copy, SOLD! Photo How much? 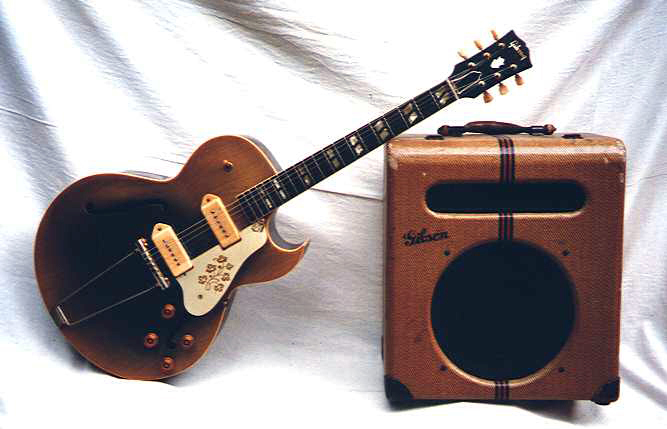 1968 Eko J-56, natural, SOLD! Photo How much? 1996 Epiphone ELVIS, black, SOLD! Photo How much? 2008 Epiphone John Lennon EJ-160E, sunburst, SOLD! Photo How much? 1990s Epiphone SQ180, black, SOLD! Photo How much? 1988 Epiphone by Gibson SQ180, black, SOLD! Photo How much? 1964 Espana (Bjärton) SL-1, natural, SOLD! Photo How much? 1965 Espana (Bjärton) SL-1, natural, SOLD! Photo How much? 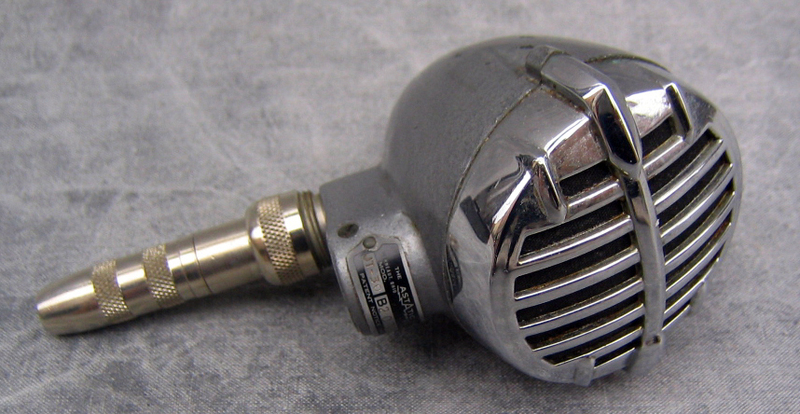 1934 Euphonon Model 519, natural, SOLD! Photo How much? 1990 Favino Selmer-copy, natural, SOLD! Photo How much? 2002-2003 Fender Acoustasonic Stratocaster, blue, SOLD! Photo How much? 1964 Fender Concert, natural, SOLD! Photo How much? Fender DG-4CE, black, SOLD! Photo How much? 2008 Fender FA-1250S NAT, natural, SOLD! Photo How much? 2013 Fender FR-50, sunburst, SOLD! Photo How much? 2010 Fender GDO500SESBST, sunburst, SOLD! Photo How much? 2004 Fender J-5, black, SOLD! Photo How much? 2010 Fender Sonoran SCE, black, SOLD! Photo How much? Fender Telecoustic, red, SOLD! Photo How much? 2013 Fender Villager 12, natural, SOLD! Photo How much? 1950s Framus, sunburst, SOLD! Photo How much? 1964 Framus Model 50/8 Teenager, sunburst, SOLD! Photo How much? 1971 Framus Model 5/296 Texan, sunburst, SOLD! Photo How much? 2010 Furch RD32-SM, natural, SOLD! Photo How much? 2008 Furch S40-CM, natural, SOLD! Photo How much? 2001 Fylde Falstaff, natural, SOLD! Photo How much? 1940s Gerdin Model 33, natural, SOLD! Photo How much? 1952 Gerdin Model 41, sunburst, SOLD! Photo How much? 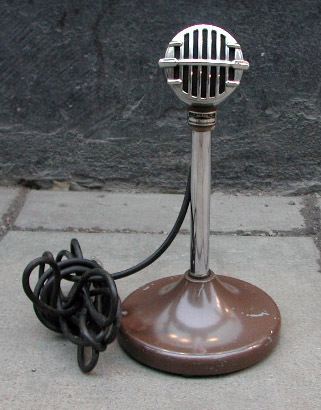 1950s Gerome Selmer-copy, natural, SOLD! Photo How much? 1966 Gibson B-25, natural, SOLD! Photo How much? 1962 Gibson B-25T, natural, SOLD! Photo How much? 1966 Gibson B-45-12, sunburst, SOLD! Photo How much? 1969 Gibson Blueridge, natural, SOLD! Photo How much? 1990 Gibson Chet Atkins SST 12-string, black, SOLD! Photo How much? 2007 Gibson CJ-165, natural, SOLD! Photo How much? 1977 Gibson Dove, black, SOLD! Photo How much? 1968 Gibson Everly Brothers, black, SOLD! Photo How much? 1994 Gibson Gospel, natural, SOLD! Photo How much? 1938 Gibson HG-00, sunburst, SOLD! Photo How much? 1970 Gibson Heritage, natural, SOLD! Photo How much? 1970s Gibson Hummingbird Custom, natural, SOLD! Photo How much? Gibson Hummingbird Montana Signature, heritage cherry, SOLD! Photo How much? 2012 Gibson Hummingbird Pro, sunburst, SOLD! Photo How much? 2013 Gibson J-35, natural, SOLD! Photo How much? 2017 Gibson J-35, Antique Natural, SOLD! Photo How much? 1964 Gibson J-45, sunburst, SOLD! Photo How much? 1969 Gibson J-45, sunburst, SOLD! Photo How much? 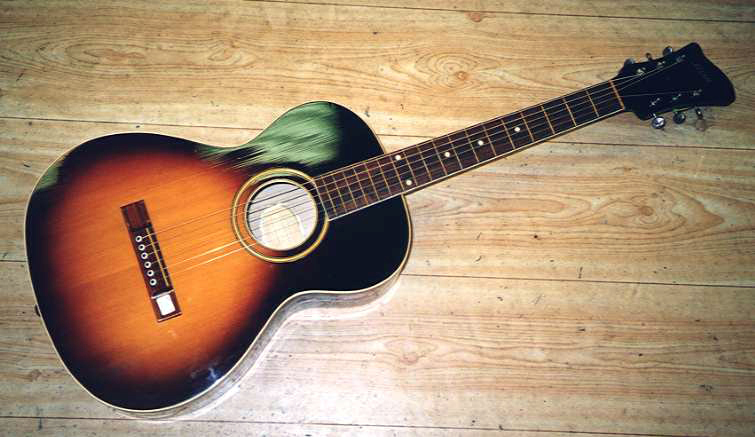 1995 Gibson J-45, sunburst, SOLD! Photo How much? 1954 Gibson J-50, natural, SOLD! Photo How much? 1973-1975 Gibson J-50 Deluxe, natural, SOLD! Photo How much? 1964 Gibson J-50ADJ, natural, SOLD! Photo How much? 1969 Gibson J-50, natural, SOLD! Photo How much? 1992 Gibson J-160, sunburst, SOLD! Photo How much? 1972 Gibson J-160E, sunburst, SOLD! Photo How much? 1987 Gibson J-180, black, SOLD! Photo How much? 1994 Gibson J-200 Rose, black, SOLD! Photo How much? 1995 Gibson J-200, black, SOLD! Photo How much? 1996 Gibson J-200, natural, SOLD! Photo How much? 2012 Gibson J-200 True Vintage, natural, SOLD! Photo How much? 1996 Gibson J-200 Elvis The King Of Rock Model, black, SOLD! Photo How much? 1967 Gibson J-50ADJ, natural, SOLD! Photo How much? 2002 Gibson John Lennon J-160E Peace, natural, SOLD! Photo How much? 1920s Gibson L-0, natural, SOLD! Photo How much? 1930 Gibson L-0, natural, SOLD! Photo How much? 1937 Gibson L-00, black, SOLD! Photo How much? 1929 Gibson L-1, sunburst, SOLD! Photo How much? 1965 Gibson LG-0, mahogany, SOLD! Photo How much? 1970 Gibson LG-0, natural, SOLD! Photo How much? 1952 Gibson LG-1, sunburst, SOLD! Photo How much? 1967 Gibson LG-1, sunburst, SOLD! Photo How much? 1944 Gibson LG-2, refin sunburst, SOLD! Photo How much? 1946 Gibson LG-2, sunburst, SOLD! Photo How much? 1949 Gibson LG-2, sunburst, SOLD! Photo How much? 1954-55 Gibson LG-2, sunburst, SOLD! Photo How much? 1999 Gibson Nick Lucas Reissue, sunburst, SOLD! Photo How much? 2004 Gibson Nick Lucas Reissue, sunburst, SOLD! Photo How much? 1997 Gibson '50s SJ-200, natural, SOLD! Photo How much? 1936 Gibson Roy Smeck Stage Deluxe, sunburst, SOLD! Photo How much? 2000 Gibson SJ-200 Reissue, sunburst, SOLD! Photo How much? 2011 Gibson SJ-200 Standard, Vintage Sunburst, SOLD! Photo How much? 1970 Gibson SJN Southern Jumbo, natural, SOLD! Photo How much? 2007 Gibson Songwriter Deluxe, natural, SOLD! Photo How much? 1968 Gibson Southern Jumbo, natural, SOLD! Photo How much? 1968 Gibson Southern Jumbo, sunburst, SOLD! Photo How much? 1991 Gibson The Star, black, SOLD! Photo How much? 1995 Gibson Vintage AJ, sunburst, SOLD! Photo How much? 1973 Ginza Gibson Dove-copy, natural, SOLD! Photo How much? 2003 Gitane D-500, natural, SOLD! Photo How much? 2008 Gitane DG-255, natural, SOLD! Photo How much? 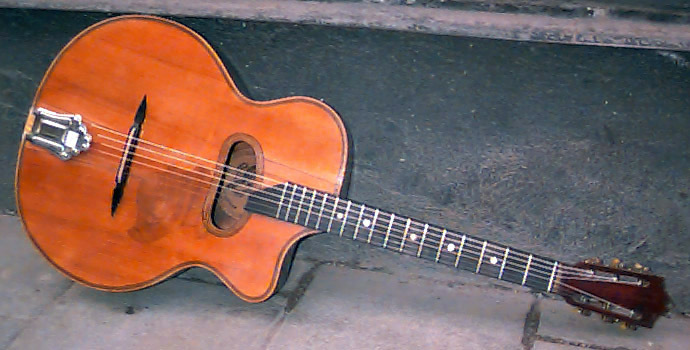 1990s Godin Acousticaster L.R. Baggs Model, black, SOLD! Photo How much? 1963 Goya M-50, natural, made by Levin SOLD! Photo How much? ca 1970 Goya GG-161, sunburst, made by Levin SOLD! Photo How much? 1972 Goya Model 163, sunburst, made by Levin SOLD! Photo How much? 1958 Goya S-16, natural, made by Levin SOLD! Photo How much? ca 1967 Goya T-16, natural, made by Levin SOLD! Photo How much? 1962 Granström & Sundquist Typ F, natural, SOLD! Photo How much? Gretsch G9500 Jim Dandy, sunburst, SOLD! Photo How much? 1955 Gretsch Rancher, orange, SOLD! Photo How much? 1979 Guild D-25, dark stained, SOLD! Photo How much? 1996 Guild D25-NT, natural, SOLD! Photo How much? 1977 Guild D40CNT, natural, SOLD! Photo How much? 1996 Guild D55, sunburst, SOLD! Photo How much? 1963 Guild F-30 Aragon, natural, SOLD! Photo How much? 1978 Guild F-50, natural, SOLD! Photo How much? 1988 Guild F25-BLK, black, SOLD! Photo How much? 1975 Guild F-112, natural, SOLD! Photo How much? 1975 Guild G-212, natural, SOLD! Photo How much? 1976 Guild G-41, natural, SOLD! Photo How much? 1966 Hagström BJ-12, natural, SOLD! Photo How much? 1960s Hagström Model 15, sunburst, SOLD! Photo How much? 1971 Harmony Sovereign Model H164, black, SOLD! Photo How much? 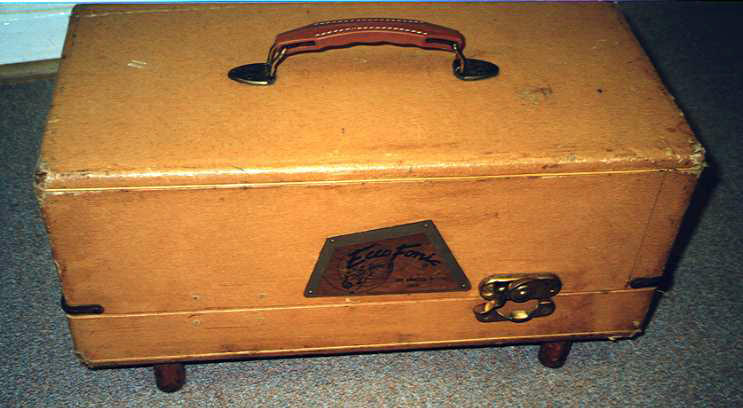 1950s Hopf, natural, SOLD! Photo How much? 1975 Ibanez Concord Model 684, sunburst, SOLD! Photo How much? 1977 Ibanez Concord Model 684, sunburst, SOLD! Photo How much? 1975 Ibanez Concord Model 684-12, sunburst, SOLD! Photo How much? 1976 Ibanez Concord Model 684-12, sunburst, SOLD! Photo How much? 1977 Ibanez Concord Model 698, sunburst, SOLD! Photo How much? 1981 Ibanez F-360BK, black, SOLD! Photo How much? 1982 Ibanez F-360, black, SOLD! Photo How much? 1980s Ibanez J-502BS, sunburst, 12-string, SOLD! Photo How much? Ibanez JX70TBS, blueburst, SOLD! Photo How much? 1981 Ibanez Maccaferri MAC10, natural, SOLD! Photo How much? 2004 Ibanez Masa Commemorative SX60RCB1201, natural, SOLD! Photo How much? 1994 Ibanez PF5, natural, SOLD! Photo How much? 1981 Ibanez Ragtime Special R 400, natural, SOLD! Photo How much? 1985 Ibanez S300, natural, SOLD! Photo How much? 2005 Ibanez Talman Inter City TCY10WLNT1201, natural, SOLD! Photo How much? 2006 Ibanez Talman Inter City TCY200621-MGT, pink stars, SOLD! Photo How much? 1986 Ibanez V280, natural, SOLD! Photo How much? 1983 Ibanez V300BS, sunburst, SOLD! Photo How much? 1984 Ibanez V300BS, sunburst, SOLD! Photo How much? 1984 Ibanez V300L, natural, SOLD! Photo How much? 1989 Ibanez V300, natural, SOLD! Photo How much? 1984 Ibanez V302, natural, SOLD! Photo How much? 1991 Ibanez V302, black, SOLD! Photo How much? 1970s JBX Custom, sunburst, SOLD! Photo How much? 1975 JBX Gibson Hummingbird-copy, sunburst, SOLD! Photo How much? 1974 JBX Hummingbird-copy, sunburst, SOLD! Photo How much? Jason F-100, sunburst, SOLD! Photo How much? 1994 John Le Voi Selmer-copy, natural, SOLD! Photo How much? 1982 K. Yairi Model M2, natural, SOLD! Photo How much? 1994 K. Yairi WY-1, natural, SOLD! Photo How much? 1987-1988 Kramer Ferrington KFS-2, black, SOLD! Photo How much? 1970s Landola F-66, natural, SOLD! Photo How much? 1970s Landola F-211 Texas, natural, SOLD! Photo How much? 1970s Landola FL-70, natural, SOLD! Photo How much? 1970s Landola H-6, sunburst, SOLD! Photo How much? 1970s Landola H-12, sunburst, SOLD! Photo How much? 1973 Landola J-20, natural, SOLD! Photo How much? 1985 Landola J-20, natural, SOLD! Photo How much? 1979 Landola J-20L, natural, SOLD! Photo How much? 1980s Landola J-20T, sunburst, SOLD! Photo How much? 1983 Landola J-20T, sunburst, SOLD! Photo How much? 1987 Landola J-20T, sunburst, SOLD! Photo How much? 1983 Landola J-60, natural, SOLD! Photo How much? 1983 Landola J-200LS, sunburst, SOLD! Photo How much? 1984 Landola J-800LS Cut, natural, SOLD! Photo How much? 1952 Landola Model 20, 7/8 size, SOLD! Photo How much? 1972-1974 Landola V-64, natural, SOLD! Photo How much? 1973-1974 Landola V-64, natural, SOLD! Photo How much? 2010 Lars Tholstrup Rasmussen Koa Model D 12-fret, natural, SOLD! Photo How much? 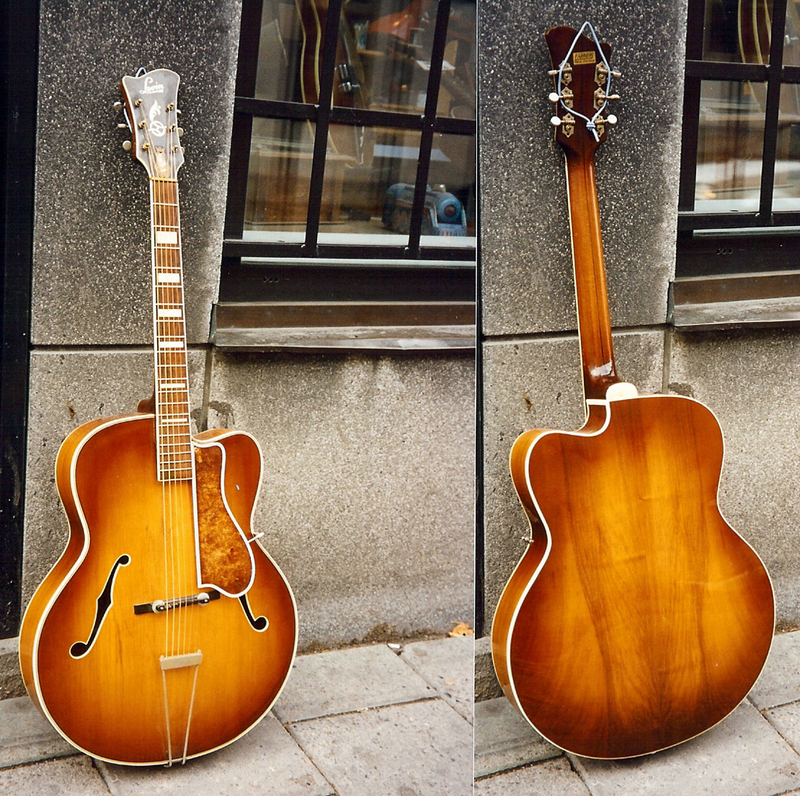 1950s Leif Hansson - Oslo, sunburst, SOLD! Photo How much? ca 1979 Levin LDR 28 H, natural, SOLD! Photo How much? 1965 Levin LN 26, sunburst, SOLD! Photo How much? 1967 Levin LN 26, sunburst, SOLD! Photo How much? 1963 Levin LS 14, natural, SOLD! Photo How much? 1970 Levin LT 3, natural, SOLD! Photo How much? 1966 Levin LT 14, natural, SOLD! Photo How much? 1966 Levin LT 16, natural, SOLD! Photo How much? 1963 Levin LT 18, natural, SOLD! Photo How much? 1965 Levin LT 18, natural, SOLD! Photo How much? 1966 Levin LT 18, natural, SOLD! Photo How much? 1968 Levin LTS 4, natural, SOLD! Photo How much? 1969 Levin LTS 4, natural, SOLD! Photo How much? 1919 Levin Model ?, natural, SOLD! Photo How much? 1923 Levin Model 1, natural, SOLD! Photo How much? 1956 Levin Model 116, natural, SOLD! Photo How much? 1964 Levin Model 123, sunburst, SOLD! Photo How much? 1964 Levin Model 124, sunburst, SOLD! Photo How much? 1972 Levin Model 174, natural, SOLD! Photo How much? 1949 Levin Model 18 Ideal, natural, SOLD! Photo How much? 1920 Levin Model 2, natural, SOLD! Photo How much? 1907 Levin Model 13, natural, SOLD! Photo How much? 1949 Levin Model 13 Ambassadör, sunburst, SOLD! Photo How much? 1949 Levin Model 15 Diplomat, sunburst, SOLD! Photo How much? 1950 Levin Model 16 Carmen, natural, SOLD! Photo How much? 1948 Levin Model 18 Ideal, natural, SOLD! Photo How much? 1950 Levin Model 18 Ideal, natural, SOLD! Photo How much? 1949 Levin Model 19 Favorit, sunburst, SOLD! Photo How much? 1950 Levin Model 19 Favorit, sunburst, SOLD! Photo How much? 1951 Levin Model 19 Favorit, sunburst, SOLD! Photo How much? 1948 Levin Model 20 Senorita, natural, SOLD! Photo How much? 1951 Levin Model 20 Senorita, natural, SOLD! Photo How much? 1951 Levin Model 21 Kentucky, faded sunburst, SOLD! Photo How much? 1952 Levin Model 21 Kentucky, sunburst, SOLD! Photo How much? 1954 Levin Model 23 Havanna, sunburst, SOLD! Photo How much? 1954 Levin Model 24 Carmencita, natural, SOLD! Photo How much? 1952 Levin Model 26 Pepita, natural, SOLD! Photo How much? 1953 Levin Model 26 Pepita, natural, SOLD! Photo How much? 1954 Levin Model 26 Pepita, natural, SOLD! Photo How much? 1955 Levin Model 26 Pepita, natural, SOLD! Photo How much? 1953 Levin Model 27 Texas, sunburst, SOLD! Photo How much? 1954 Levin Model 27 Texas, sunburst, SOLD! Photo How much? 1955 Levin Model 27 Texas, sunburst, SOLD! Photo How much? 1951 Levin Model 28 Nevada, sunburst, SOLD! Photo How much? 1955 Levin Model 28 Nevada, sunburst, SOLD! Photo How much? 1930 Levin Model 29, natural, SOLD! Photo How much? 1944 Levin Model 47, sunburst, SOLD! Photo How much? 1946 Levin Model 47, sunburst, SOLD! Photo How much? 1945 Levin Model 52, sunburst, SOLD! Photo How much? 1912 Levin Model 68, natural, SOLD! Photo How much? 1947 Levin Model 72, natural, SOLD! Photo How much? 1960 Levin Model 116, natural, SOLD! Photo How much? 1963 Levin Model 116, natural, SOLD! Photo How much? 1962 Levin Model 118, natural, SOLD! Photo How much? 1956 Levin Model 123, sunburst, SOLD! Photo How much? 1967 Levin Model 133, natural, SOLD! Photo How much? 1970 Levin Model 174, natural, SOLD! Photo How much? 1971 Levin Model 174, natural, SOLD! Photo How much? 1936 Levin Model 182, sunburst, SOLD! Photo How much? 1932 Levin Model 195, dark mahogany stained, SOLD! Photo How much? 1937 Levin Model 195, sunburst, SOLD! Photo How much? 1936 Levin Model 198, sunburst, SOLD! Photo How much? 1937 Levin Model 198, sunburst, SOLD! Photo How much? 1929 Levin Model 202, dark mahogany, SOLD! Photo How much? 1926 Levin Model 211, wine red, SOLD! Photo How much? 1931 Levin Model 212, dark brown, SOLD! Photo How much? 1930 Levin Model 262, natural, SOLD! Photo How much? 1932 Levin Model 267, natural, SOLD! Photo How much? 1934 Levin Model 267, natural, SOLD! Photo How much? 1974 Levin W 9-32, natural SOLD! Photo How much? 1979 Levin W 12-38, natural, SOLD! Photo How much? 1974 Levin W 30, natural, SOLD! Photo How much? ca 1979 Levin W 32 J, natural, SOLD! Photo How much? Early 1970s Levin W 36, natural, SOLD! Photo How much? 1973 Levin W 36, natural, SOLD! Photo How much? 1979 Levin W 36, natural, left-handed, SOLD! Photo How much? Levin W21, natural, SOLD! Photo How much? 1990 Levin W32R, natural, SOLD! Photo How much? 1970s Levin WR 34 Ragtime, natural, SOLD! Photo How much? 1976 Levin WR 34 Ragtime, natural, SOLD! Photo How much? 1979 Levin WR 34 Ragtime, natural, SOLD! Photo How much? Levin WR 34B, natural, SOLD! Photo How much? 2005 Line 6 Variax Acoustic 700, black, SOLD! Photo How much? 1980s Lowden S5, natural, SOLD! Photo How much? Manuel Rodriguez Model G Sapele, natural, SOLD! Photo How much? 1942 Martin 0-15, mahogany, SOLD! Photo How much? 1913 Martin 0-18, natural, SOLD! Photo How much? 1947 Martin 0-18, natural, SOLD! Photo How much? 1955 Martin 0-18, natural, SOLD! Photo How much? 1947 Martin 00-17, natural, STOLEN! Serial number 100256 Photo How much? 1941 Martin 00-18, natural, SOLD! Photo How much? 1947 Martin 00-18, refinished natural, SOLD! Photo How much? 1956 Martin 00-18, natural, SOLD! Photo How much? 1958 Martin 00-18, natural, SOLD! Photo How much? 1963 Martin 00-18, natural, SOLD! Photo How much? 1927 Martin 00-21, natural, SOLD! Photo How much? 1963 Martin 00-21NY, natural, SOLD! Photo How much? 2004 Martin 000-16RGT, natural, SOLD! Photo How much? 1948 Martin 000-18, natural, SOLD! Photo How much? 2002 Martin 00CXAE Grand Concert, black, SOLD! Photo How much? 1953 Martin 000-21, natural, SOLD! Photo How much? 1997 Martin 000-28EC Eric Clapton, aged natural, SOLD! Photo How much? 1990s Martin Backpacker, natural, SOLD! Photo How much? 2000 Martin D-16DT, natural, SOLD! Photo How much? 1973 Martin D-18, natural, SOLD! Photo How much? 1975 Martin D-18, natural, SOLD! Photo How much? 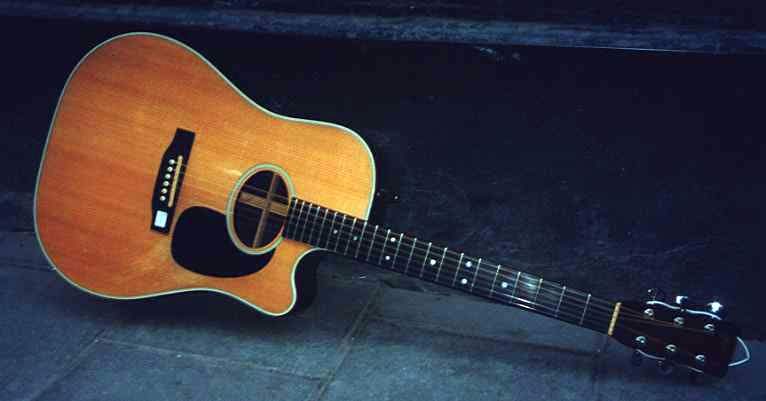 1976 Martin D-18, sunburst, SOLD! Photo How much? 1972 Martin D-18S, natural, SOLD! Photo How much? 1959 Martin D-21, natural, SOLD! Photo How much? 1969 Martin D-28, natural, SOLD! Photo How much? 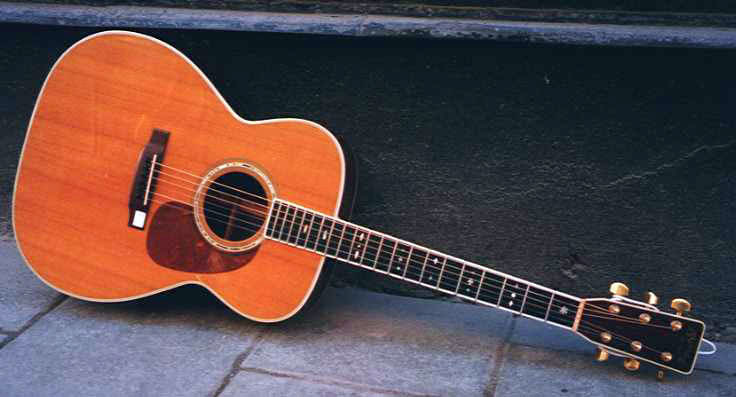 1975 Martin D-28, natural, SOLD! Photo How much? 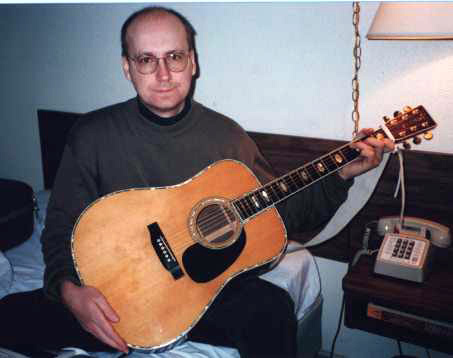 1998 Martin D-28, natural, SOLD! Photo How much? 2001 Martin D-28, natural, SOLD! Photo How much? 2002 Martin D-28, natural, SOLD! Photo How much? 2015 Martin D-28, natural, SOLD! Photo How much? 2003 Martin D-35, natural, SOLD! Photo How much? 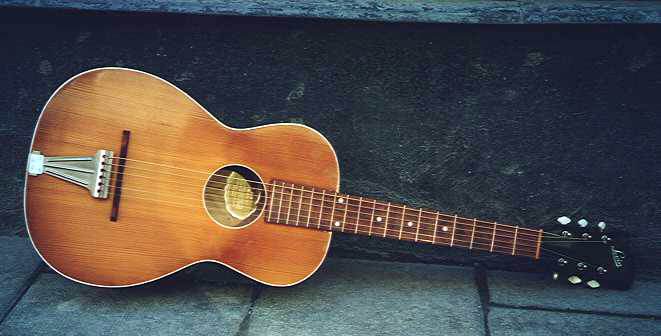 1974 Martin D-41, natural, SOLD! Photo How much? 1995 Martin D-42, natural, SOLD! Photo How much? 1975 Martin D-45, natural, SOLD! Photo How much? 1991 Martin D-45, natural, SOLD! Photo How much? 1979 Martin D12-28, natural, SOLD! Photo How much? 1981 Martin DC-28, natural, SOLD! Photo How much? 1997 Martin DM, natural, SOLD! Photo How much? 2001 Martin DM, natural, SOLD! Photo How much? 1999 Martin DR, natural, SOLD! Photo How much? 2013 Martin DX1RAE, natural, SOLD! Photo How much? 1976 Martin HD-28, natural, changed fingerboard inlays, added neck binding, SOLD! Photo How much? 1977 Martin HD-28, natural, SOLD! Photo How much? 1999 Martin HPD-41, natural, SOLD! Photo How much? 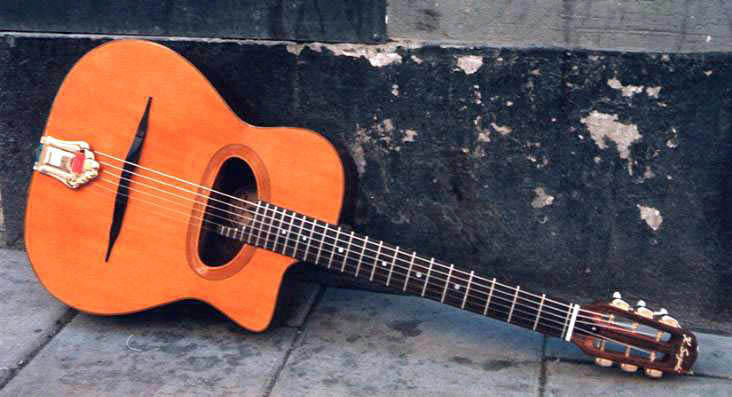 2001 Martin J-15, all mahogany, SOLD! Photo How much? 2001 Martin JM, natural, SOLD! Photo How much? 2018 Martin LX Black, black, SOLD! Photo How much? 2018 Martin Little Martin LX1E, natural, SOLD! Photo How much? 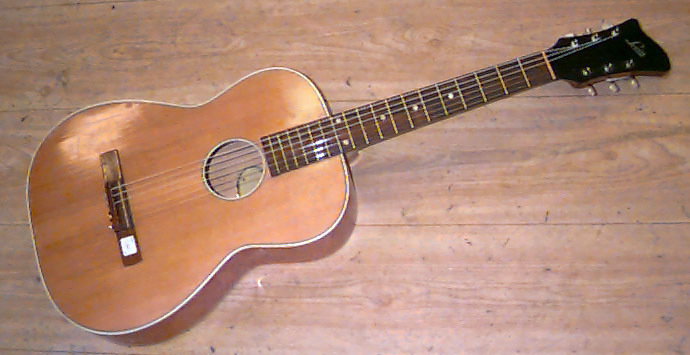 1977 Martin M-38, natural, SOLD! Photo How much? 1983 Martin M-38, natural, SOLD! Photo How much? 1987 Martin M-38, natural, SOLD! Photo How much? 1981 Martin MC-28 Custom, natural, SOLD! Photo How much? 1998 Martin OM-21 Custom , natural, SOLD! Photo How much? 1992 Martin OM-28, natural, SOLD! Photo How much? 2005 Martin OM-28GE 1931 Golden Era, natural, SOLD! Photo How much? 2001 Martin OM-42, natural, SOLD! Photo How much? 2002 Martin OM-42, sunburst, SOLD! Photo How much? 2011 Martin OM-42, natural, SOLD! Photo How much? 2003 Martin OMC-16E Premium, natural, SOLD! Photo How much? 1986 Martin Shenandoah D-3532, natural, SOLD! Photo How much? 2000 Martin SPOM-16, natural, SOLD! Photo How much? 2014 Michael Sandén Dreadnought Cocobolo, natural, SOLD! Photo How much? 2011 Michael Sandén JRB-HMB, baritone, natural, SOLD! Photo How much? 2007 Michael Sandén VRB-MII, natural, SOLD! Photo How much? 1965 Mohawk archtop, sunburst, SOLD! Photo How much? 1996 Morgan W500SCEBLK, black, SOLD! Photo How much? 1970s Morris MD-510, sunburst, SOLD! Photo How much? 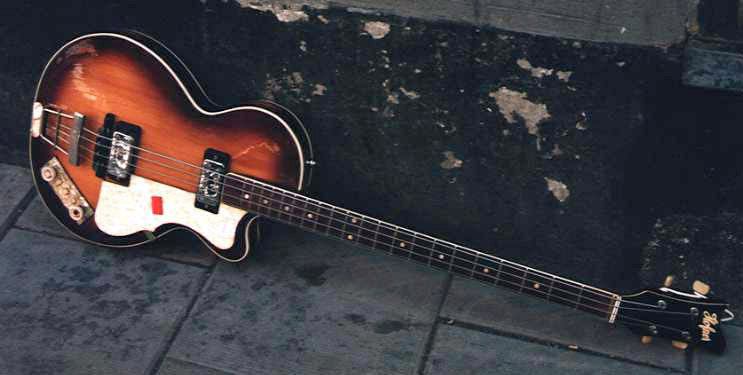 1960s Noname (Framus?) 12-string, natural, SOLD! Photo How much? 1900s Noname Lute Guitar, natural, round back, SOLD! Photo How much? 1932 Noname Lute Guitar, natural, SOLD! Photo How much? 1800s Noname Parlor Guitar, natural, SOLD! Photo How much? 1908 Noname Parlor Guitar, natural, SOLD! Photo How much? 1940s Noname Selmer-copy, natural, SOLD! Photo How much? Nordwall 12-string Folk-Tuned Whole Mahogany, natural, SOLD! Photo How much? Nordwall Jumbo 12A, dark stained natural, SOLD! Photo How much? 1930s Oahu Style 65M, sunburst, SOLD! Photo How much? 1990s O.C. Smith SD-10, natural, SOLD! Photo How much? 2003 Oscar Schmidt OG2B, black, SOLD! Photo How much? 1979 Ovation Adamas Model 1687-7, beige/blue sunburst, SOLD! Photo How much? 1983 Ovation Balladeer Model 1112-4, natural, SOLD! Photo How much? 1992 Ovation Custom Legend Model 1869, black, SOLD! Photo How much? 1981 Ovation Legend 1617, sunburst, SOLD! Photo How much? 1940s Paresic Selmer-copy, natural, SOLD! Photo How much? 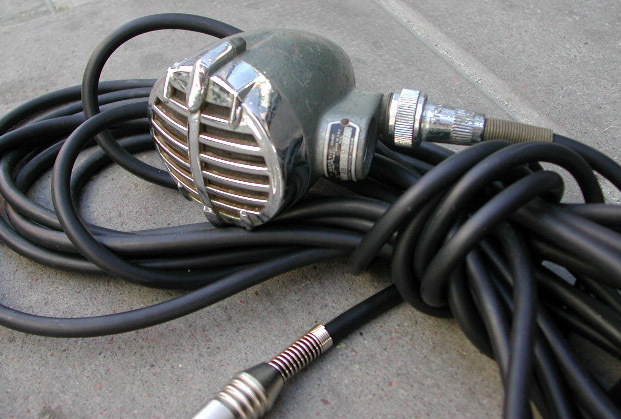 1950s Picco Selmer-copy, natural, SOLD! Photo How much? 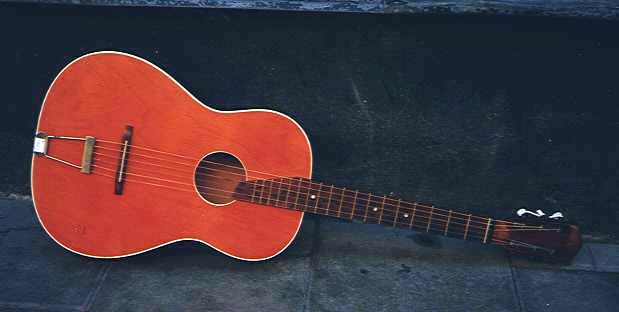 1970s Pro Martin Custom W30A, mahogany, SOLD! Photo How much? 1970s Pro Martin Custom W120, natural, SOLD! Photo How much? 1990s Saga BM-250 Selmer-copy, natural, SOLD! Photo How much? 2002 Samick SMJ10CEBK, black, SOLD! Photo How much? 2008 Santa Cruz H Model, natural, SOLD! Photo How much? 1990s Santa Cruz Tony Rice, natural, brazilian rosewood back and sides, SOLD! Photo How much? Seagull S6 Cedar, natural, SOLD! Photo How much? 1980 Sigma D-10, natural, SOLD! Photo How much? 1980s Sigma DM-5, natural, SOLD! Photo How much? 1970s Sigma DM-12-5, natural, SOLD! Photo How much? 2017 Sigma GJA-SG200, sunburst, SOLD! Photo How much? 1970s Sigma SG-9, black, SOLD! Photo How much? 1981 Sigma SG-9, black, SOLD! Photo How much? ca 1978 Sigma SG-9, black, SOLD! Photo How much? 1980 Sigma SG-9, black, SOLD! Photo How much? ca 1981 Sigma SG-9, black, SOLD! Photo How much? 1980s Suzuki Selmer-copy, natural, SOLD! Photo How much? 2008 Tacoma DM9C, natural, SOLD! Photo How much? 2018 Takamine CP7MO-TT, natural, SOLD! Photo How much? 1985 Takamine EF371C, darkburst, SOLD! Photo How much? 2010 Takamine EG333C-LTD, sunburst, SOLD! Photo How much? 1992 Takamine EN-40C, natural, SOLD! Photo How much? 1973 Takamine F360, natural, SOLD! Photo How much? 2000 Takamine F360SO NSVN, natural, SOLD! Photo How much? 1975 Takamine F365S, natural, SOLD! Photo How much? 1985 Takamine PT-05E, mahogany, SOLD! Photo How much? 1992 Takamine PT05E, mahogany, SOLD! Photo How much? 1977 Tama TG-120, natural, SOLD! Photo How much? 2012 Tanglewood TVC KOA C, natural, SOLD! Photo How much? 2002 Tanglewood TW1000NS, natural, SOLD! Photo How much? 2006 Tanglewood TW15/12NSB, natural, SOLD! Photo How much? 2017 Tanglewood TW28CSN, natural, SOLD! Photo How much? Tanglewood TW28STUSA-E, natural, SOLD! Photo How much? Tanglewood TWB Z Baritone, natural, SOLD! Photo How much? 2015 Tanglewood TWRO-12, natural, SOLD! Photo How much? 2017 Taylor 210ce DLX, natural, SOLD! Photo How much? 2004 Taylor 314ce, natural, SOLD! Photo How much? 2002 Taylor 355, natural, SOLD! Photo How much? 2011 Taylor 414ce-LTD, natural, SOLD! Photo How much? Taylor 616e Maple, natural, SOLD! Photo How much? 2015 Taylor BT1 Baby Taylor, natural, SOLD! Photo How much? 2001 Taylor Big Baby, natural, SOLD! Photo How much? 2001 Taylor Big Baby Model 306-GB, natural, SOLD! Photo How much? 2018 Taylor GS Mimi-e, natural, SOLD! Photo How much? 2017 Taylor GS Mini-e Walnut ES-B, natural, SOLD! Photo How much? 1960s The Hawk, natural, SOLD! Photo How much? 2002 Toledo Selmer-copy, natural, SOLD! Photo How much? 1921 Washburn 1896 New Model, natural, SOLD! Photo How much? 1923 Washburn 1897 New Model, natural, SOLD! Photo How much? 1998 Washburn D-10CE/BK, black, SOLD! Photo How much? 2007 Washburn PS9BK Paul Stanley, black, SOLD! Photo How much? 1973 Yamaha FG-180, natural, SOLD! Photo How much? 1970s Yamaha FG-180-1, natural, SOLD! Photo How much? 1970s Yamaha FG-200, natural, SOLD! Photo How much? 1974 Yamaha FG-200, natural, SOLD! Photo How much? 1971 Yamaha FG-300, natural, SOLD! Photo How much? 1990s Yamaha FG-411C BL, black, SOLD! Photo How much? 1980s Yamaha FG-460S, natural, SOLD! Photo How much? 2009 Yamaha FG612S, natural, SOLD! Photo How much? 2003 Yamaha SLG-100S, SOLD! Photo How much? 1964 Airline Res-O-Glas, black, SOLD! Photo How much? 2010s Dean Thin Body Resonator Electric, chrome/gold, SOLD! Photo How much? 1990 Dobro DM33 Duolian, chrome, SOLD! Photo How much? 2000s Dobro Hound Dog Deluxe Square Neck, vintage brown, SOLD! Photo How much? 2010 Dobro Hound Dog Deluxe Square Neck, vintage brown, SOLD! Photo How much? 1990 Dobro HoundDog, sunburst, SOLD! Photo How much? 1989 Dobro Model 33B, black, metal body, SOLD! Photo How much? 1992 Dobro Model 33, black, wood body, SOLD! Photo How much? 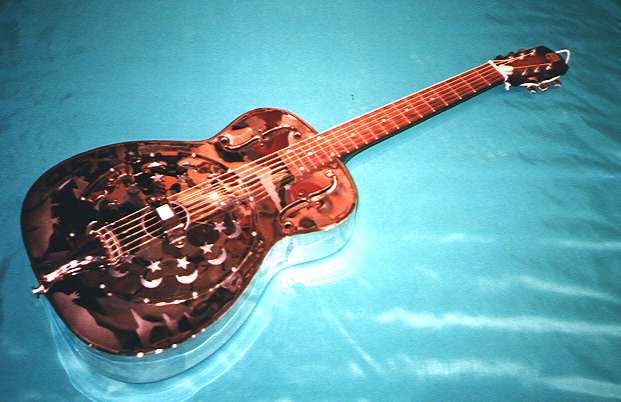 1987 Dobro Model 36 The Rose, chrome, SOLD! Photo How much? 1933 Dobro Model 37, sunburst, SOLD! Photo How much? 1987 Dobro Model 90, chrome, SOLD! Photo How much? 1980 Dobro S8, sunburst, SOLD! Photo How much? 1990 Dobro Zephyr, wood body, SOLD! Photo How much? 2000 Fender FR-50, black, SOLD! Photo How much? 2003 Harley Benton Model 531, chrome, SOLD! Photo How much? 1931 National Duolian, gray frost, SOLD! Photo How much? 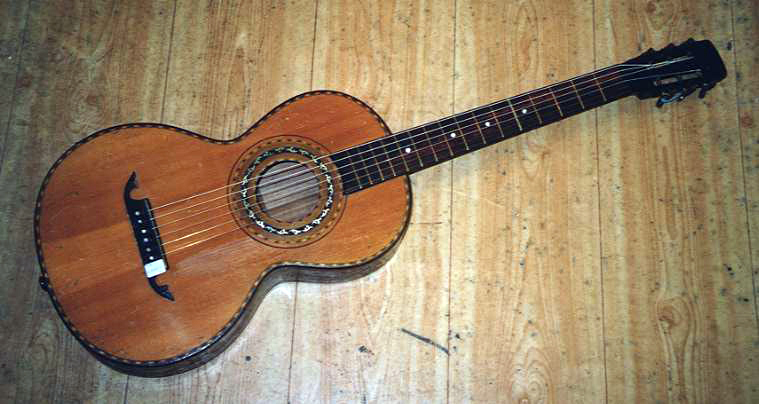 1938 National Duolian Squareneck, mahogany-grain, SOLD! Photo How much? 1991 National Reso-Phonic Resolectric, blue, SOLD! Photo How much? 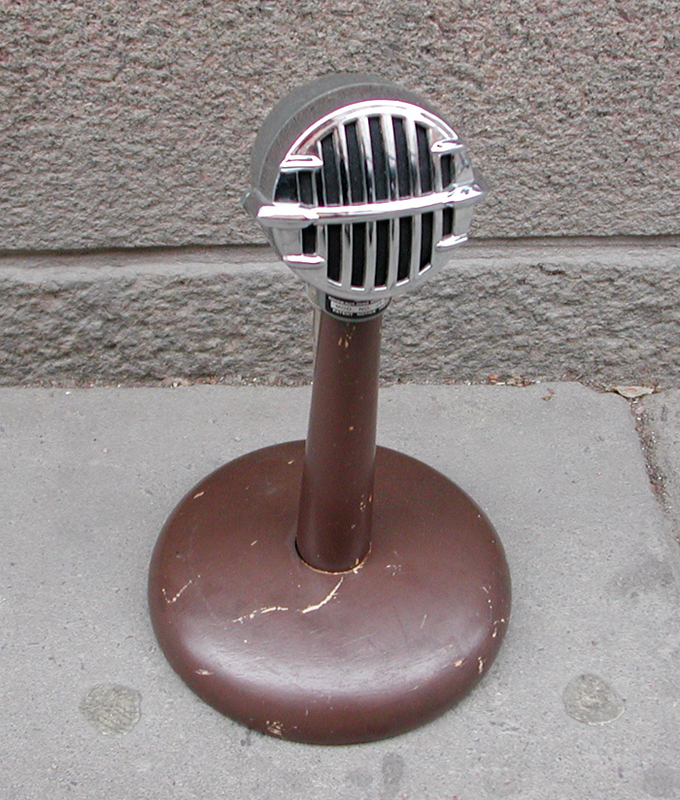 Republic Tricone, aged, SOLD! Photo How much? 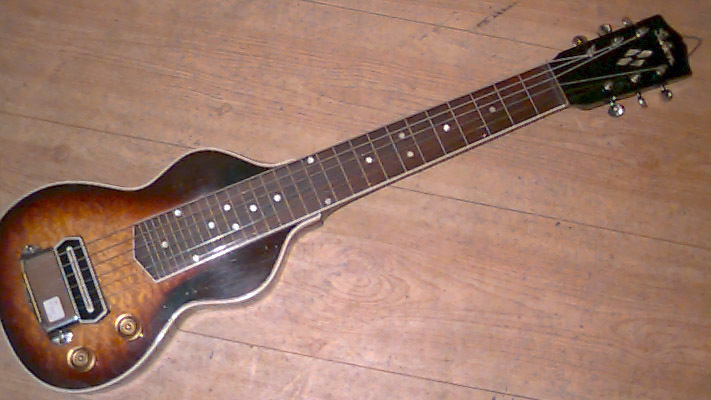 1934-1939 The Michigan (Regal Dobro Model 27), sunburst, SOLD! Photo How much? ADR Guitars Alfredo Dominguez Romero, natural, SOLD! Photo How much? Ahlander Classic, natural, SOLD! Photo How much? 1971 Ahlander Student, natural, SOLD! Photo How much? 2018 Alhambra 1C-E1 Cedar Top, natural, SOLD! Photo How much? Alhambra 2C, natural, SOLD! Photo How much? 2017 Alhambra 3C, natural, SOLD! Photo How much? Alhambra 3F-CT-E1, natural, SOLD! Photo How much? 1998 Alhambra CTWE.7FC ELE, natural, SOLD! Photo How much? 1980s Alpha A100, natural, SOLD! Photo How much? Antonio Aparicio Model 150, natural, SOLD! Photo How much? 1971 Aria A551, natural, SOLD! Photo How much? 1978 Aria A551, natural, SOLD! Photo How much? Aria AC-8, natural, SOLD! Photo How much? 1970s Aria AC-8, natural, SOLD! Photo How much? 1970s Aria AC-10, natural, SOLD! Photo How much? 1984 Aria AC-30, natural, SOLD! Photo How much? 1984 Aria Model 6, natural, SOLD! Photo How much? 1986 Bjärton B-10, natural, SOLD! Photo How much? 1987 Bjärton B-10, natural, SOLD! Photo How much? 1990 Bjärton B-10N, natural, SOLD! Photo How much? 1989 Bjärton B-15, natural, SOLD! Photo How much? 1990 Bjärton B-15, natural, SOLD! Photo How much? 1988 Bjärton B-15S HPF, natural, SOLD! Photo How much? 1987 Bjärton C-110, natural, SOLD! Photo How much? ca 1978 Bjärton Camilla, natural, SOLD! Photo How much? 1973 Bjärton Carmencita, sunburst, SOLD! Photo How much? 1975 Bjärton Carmencita, natural, SOLD! Photo How much? 1978 Bjärton Carmencita, natural, SOLD! Photo How much? ca 1978 Bjärton Carmencita, natural, SOLD! Photo How much? 1975 Bjärton Classic, natural, SOLD! Photo How much? ca 1960 Bjärton España, natural, SOLD! Photo How much? 1965 Bjärton Espana, natural, SOLD! Photo How much? 1966 Bjärton Espana, natural, SOLD! Photo How much? 1978 Bjärton Estrella, natural, SOLD! Photo How much? 1965 Bjärton Isabella, natural, SOLD! Photo How much? 1972 Bjärton Isabella, natural, SOLD! Photo How much? 1973 Bjärton Isabella, natural, SOLD! Photo How much? 1975 or 1977 Bjärton Isabella, natural, SOLD! Photo How much? ca 1978 Bjärton Isabella, natural, SOLD! Photo How much? ca 1980 Bjärton Isabella, natural, SOLD! Photo How much? ca 1981 Bjärton Isabella, natural, SOLD! Photo How much? 1982 Bjärton Isabella, natural, SOLD! Photo How much? 1965 Bjärton La Rita, natural, SOLD! Photo How much? 1966 Bjärton La Rita, natural, SOLD! Photo How much? 1971 Bjärton La Rita, natural, SOLD! Photo How much? 1974 Bjärton La Rita, natural, SOLD! Photo How much? ca 1983 Bjärton La Rita, natural, SOLD! Photo How much? 1970 Bjärton Minor, sunburst, SOLD! Photo How much? 1979 Bjärton Rebecka, natural, SOLD! Photo How much? 1980 Bjärton Rebecka, natural, SOLD! Photo How much? ca 1980 or ca 1981 Bjärton Rebecka, natural, SOLD! Photo How much? 1977 Bjärton Rosita, natural, SOLD! Photo How much? ca 1978 Bjärton Rosita, natural, SOLD! Photo How much? ca 1981 Bjärton Rosita, natural, SOLD! Photo How much? 1981 Bjärton Rosita, natural, SOLD! Photo How much? ca 1984 Bjärton Rosita, natural, SOLD! Photo How much? 1975 Bjärton Senorita, natural, SOLD! Photo How much? 1980s Bjärton Tina, sunburst, SOLD! Photo How much? ca 1982 Bjärton Tina, sunburst, SOLD! Photo How much? 1984 Bjärton Tina, natural, SOLD! Photo How much? 1960 Bjärton Isabella, natural, SOLD! Photo How much? 1974 Bo Wretling, natural, SOLD! Photo How much? 1974 Bo Wretling Regalia, natural, SOLD! Photo How much? 1964 Bo Wretling Typ R Regalia, natural, SOLD! Photo How much? 2005 Brüko Octave Guitar, shaded, SOLD! Photo How much? 1940s Casa Nunez, natural, SOLD! Photo How much? Classic 38 Model 38, natural, SOLD! Photo How much? 1952 Crafton Concert, natural, SOLD! Photo How much? 1974 DiGiorgio Autor 3, natural, SOLD! Photo How much? 1995 Epiphone C70CE, natural, SOLD! Photo How much? 1973 Epiphone DO-22, natural, SOLD! Photo How much? 1993 Esteve Model 30340 Octave Guitar, natural, SOLD! Photo How much? 2006 Esteve Model 655, natural, SOLD! Photo How much? 1960s Framus Model 5/24, natural, SOLD! Photo How much? 2003 Fredholm konsertgitarr, natural, SOLD! Photo How much? 1982 Georg Bolin, natural, SOLD! Photo How much? 1991 Georg Bolin 8-string, natural, SOLD! Photo How much? 1981 Georg Bolin Pia, natural, SOLD! Photo How much? 1961 Georg Bolin Tusensköna, natural, SOLD! Photo How much? Gewa Classica, natural, SOLD! Photo How much? 1956 Granström & Sundquist Typ C, natural, SOLD! Photo How much? 1963 Granström & Sundquist F-nylon, natural, SOLD! Photo How much? 1972 Granström & Sundquist F-nylon, natural, SOLD! Photo How much? 1960 Granström & Sundquist Daniel, natural, SOLD! Photo How much? 1966 Granström & Sundquist Daniel, natural, SOLD! Photo How much? 1963 Granström & Sundquist Daniel, natural, SOLD! Photo How much? 1967 Granström & Sundquist F-nylon, natural, SOLD! Photo How much? 1960s Granström & Sundquist F-nylon, natural, SOLD! Photo How much? 1959 Granström & Sundquist Typ C, natural, SOLD! Photo How much? 1970 Granström & Sundquist Typ F, natural, SOLD! Photo How much? 1970s Hans Persson BSII, natural, SOLD! Photo How much? 2006 Henrik Jansson Model Kohno, natural, SOLD! Photo How much? 1965 Hopf nylon-string guitar, natural, SOLD! Photo How much? Höfner , natural, SOLD! Photo How much? 1973 Ibanez Model 356, natural, SOLD! Photo How much? 1978 Ibanez Model 398WM, natural, SOLD! Photo How much? J. Navarro NC-40 Spruce Classical Guitar, natural, SOLD! Photo How much? J. Navarro NC-41 Cedar Classical Guitar, natural, SOLD! Photo How much? J. Navarro NC-60 Spruce Classical Guitar, natural, SOLD! Photo How much? 1902 Jul. Zimmerman parlor, natural, SOLD! Photo How much? Kantare Midel I 500 C LH, natural, SOLD! Photo How much? 1950s Landola 7c, natural, SOLD! Photo How much? 1972 Landola C-21, 7/8 size, SOLD! Photo How much? 1970s Landola C-23, natural, SOLD! Photo How much? 1980 Landola C-23, natural, SOLD! Photo How much? 1980 Landola C-25, natural, SOLD! Photo How much? 1988 Landola C-25M, natural, SOLD! Photo How much? 1977 Landola C-65, natural, SOLD! Photo How much? 1979 Landola C-65, natural, SOLD! Photo How much? 1987 Landola C-65M, natural, SOLD! Photo How much? 1988 Landola C-65M, natural, SOLD! Photo How much? 1985 Landola C-85, natural, SOLD! Photo How much? 1987 Landola C-90, natural, SOLD! Photo How much? 1968 Landola Model 9a, natural, SOLD! Photo How much? 1960s Landola SL-25, natural, SOLD! Photo How much? 1970s Landola SL-25, natural, SOLD! Photo How much? 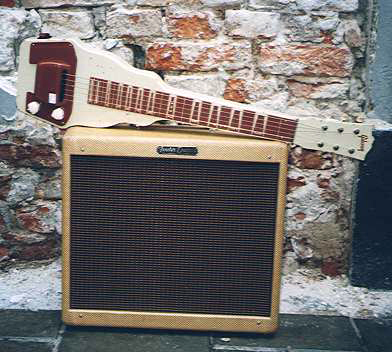 1970s Landola V-63, natural, SOLD! Photo How much? 1970 Landola skolgitarr, natural, SOLD! Photo How much? 1975 Levin 1975 Anniversary, natural, SOLD! Photo How much? Levin C12, natural, SOLD! Photo How much? 1975 Levin Classic 2, natural, SOLD! Photo How much? 1971 Levin Classic 5, natural, SOLD! Photo How much? 1974 Levin Classic 5, natural, SOLD! Photo How much? 1975 Levin Classic 5, natural, SOLD! Photo How much? 1977 Levin Classic 5, natural, SOLD! Photo How much? 1978 Levin Classic 5, natural, SOLD! Photo How much? 1979 Levin Classic 5, natural, SOLD! Photo How much? 1973 Levin Classic 7, natural, SOLD! Photo How much? 1970s Levin Classic 7, natural, SOLD! Photo How much? 1971 Levin Classic 11, natural, SOLD! Photo How much? 1973 Levin Classic 11, natural, SOLD! Photo How much? Levin L30, natural, SOLD! Photo How much? 2010 Levin L45, natural, SOLD! Photo How much? 1967 Levin LFL 7, natural, SOLD! Photo How much? 1979 Levin LG 17, natural, SOLD! Photo How much? 1975 Levin LG 4, natural, SOLD! Photo How much? 1973 Levin LG 8, natural, SOLD! Photo How much? 1977 Levin LG 8, natural, SOLD! Photo How much? 1965 Levin LG 10, natural, SOLD! Photo How much? 1966 Levin LG 10, natural, SOLD! Photo How much? 1969 Levin LG 10, natural, SOLD! Photo How much? 1967 Levin LG 13, natural, SOLD! Photo How much? 1970 Levin LG 13, natural, SOLD! Photo How much? 1966 Levin LG 17, natural, SOLD! Photo How much? 1971 Levin LG 17, natural, SOLD! Photo How much? 1973 Levin LG 17, natural, SOLD! Photo How much? 1975 Levin LG 17, natural, SOLD! Photo How much? 1976 Levin LG 17, natural, SOLD! Photo How much? 1980s Levin LG 17, natural, SOLD! Photo How much? 1973 Levin LG 19, natural, SOLD! Photo How much? 1967 Levin LG 20, natural, SOLD! Photo How much? 1970 Levin LG 20, natural, SOLD! Photo How much? 1966 Levin Model 112, natural, SOLD! Photo How much? 1967 Levin Model 113, natural, SOLD! Photo How much? 1960 Levin Model 115, natural, SOLD! Photo How much? 1957 Levin Model 120, sunburst, SOLD! Photo How much? 1960 Levin Model 121, sunburst, SOLD! Photo How much? 1953 Levin Model 7 Valencia, natural, SOLD! Photo How much? 1952 Levin Model 8 Sevilla, natural, SOLD! Photo How much? 1950 Levin Model 10 Madrid, natural, SOLD! Photo How much? 1949 Levin Model 11 Tarragona, natural, SOLD! Photo How much? 1950 Levin Model 11 Tarragona, natural, SOLD! Photo How much? 1950 Levin Model 12 Barcelona, natural, SOLD! Photo How much? 1955 Levin Model 22 Bolero, natural, SOLD! Photo How much? 1960 Levin Model 111, natural, SOLD! Photo How much? 1969 Levin Model 111, natural, SOLD! Photo How much? 1964 Levin Model 112, natural, SOLD! Photo How much? 1957 Levin Model 113, natural, SOLD! Photo How much? 1966 Levin Model 113, natural, SOLD! Photo How much? 1970 Levin Model 113, natural, SOLD! Photo How much? 1955 Levin Model 114, natural, SOLD! Photo How much? 1958 Levin Model 115, natural, SOLD! Photo How much? 1964 Levin Model 118, natural, SOLD! Photo How much? 1963 Levin Model 120, sunburst, SOLD! Photo How much? 1972 Levin Model 140, natural, SOLD! Photo How much? 1961 Levin Model VIII, natural, SOLD! Photo How much? 1980s Levin School Maxi, natural, SOLD! Photo How much? Lugnås Studio, natural, SOLD! Photo How much? 1960s Lugnås Studio, natural, SOLD! Photo How much? 1970s Lugnås Valencia, natural, SOLD! Photo How much? Luna MG80, 1/4, SOLD! Photo How much? 2007 Manuel Rodriguez C-1, natural, SOLD! Photo How much? Manuel Rodriguez Model B Cutaway Sol yo Sombra, natural, SOLD! Photo How much? 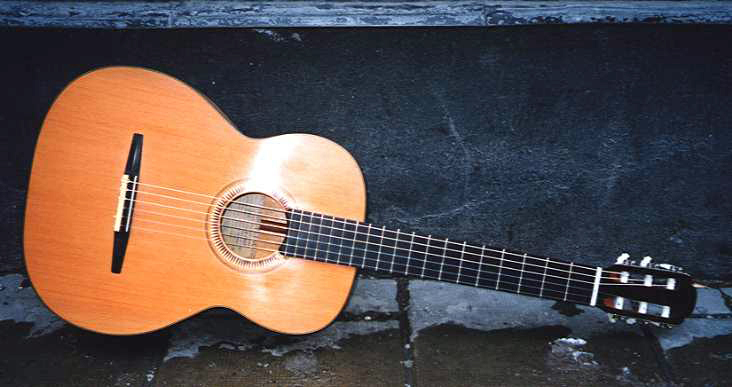 1980 Manuel Rodriguez Sr , natural, SOLD! Photo How much? 2010 Manuel Rodriquez FG Cedar, natural, SOLD! Photo How much? 1980s Master Chappell B12, natural, SOLD! Photo How much? ca 1970s Noname, natural, SOLD! Photo How much? 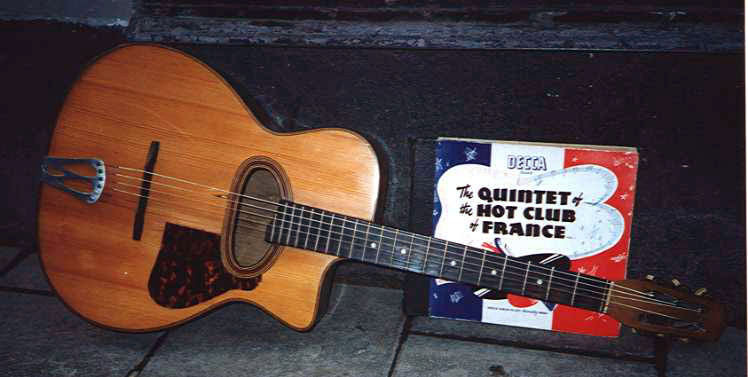 2006 Quilles C-2, natural, SOLD! Photo How much? 1995 Ramirez 1A Tradicional C-664, natural, SOLD! Photo How much? 1970s Sakura C119, natural, SOLD! Photo How much? 1980 Sakura G-15, natural, SOLD! Photo How much? Salvador Ibanez G850-NT-2Y-01, natural, SOLD! Photo How much? ca 1970s Santana Model 1520, natural, SOLD! Photo How much? ca 1980s Seiwa G-100, natural, SOLD! Photo How much? 1989 Shiro SR-8, natural, SOLD! Photo How much? 1980 Sigma School Mini 7/8, natural, SOLD! Photo How much? 1980s Swedtone Carina, natural, SOLD! Photo How much? 2002 Swedtone Tarragona, natural, SOLD! Photo How much? Takamine CF-132SC, natural, SOLD! Photo How much? 1996 Takamine CP-132SC, natural, SOLD! Photo How much? 1990s Takamine EG522C, natural, SOLD! Photo How much? 1989 Takamine EN-60C, natural, SOLD! Photo How much? 1991 Takamine NP-65C, natural, SOLD! Photo How much? 1992 Takamine NP-65C, natural, SOLD! Photo How much? 1950s Tegebo Typ 2 Hansita, natural, SOLD! Photo How much? 2002 Yamaha C-40, natural, SOLD! Photo How much? 2007 Yamaha C-45, natural, SOLD! Photo How much? Yamaha CS-40 3/4, natural, SOLD! Photo How much? 1981 Yamaha G-231 II, natural, SOLD! Photo How much? 2007 Yamaha Guitalele GL-1, natural, SOLD! Photo How much? 1988 Yamaha Model 550, natural, SOLD! Photo How much? Yamaha No 85, natural, SOLD! Photo How much? 2002 Yamaha SLG-100N, SOLD! Photo How much? 1957 Zandelin Sonatin, SOLD! Photo How much? 1920 Alfred Brock 12-string Lute, natural, SOLD! Photo How much? Ashbury AT-40, natural, SOLD! Photo How much? 1923 Bacon & Day Silver Bell No. 1 Tenor Banjo, SOLD! Photo How much? 2016 Chinese Moon Guitar, (Yueqin or Yueiqin), SOLD! Photo How much? Crafter M75E, natural, SOLD! Photo How much? Deering Goodtime, 5-string, SOLD! Photo How much? 1970s Dixie tenor banjo, SOLD! Photo How much? 2003 El Chasqui Charango, natural, SOLD! Photo How much? Framus 6-string, banjo, SOLD! Photo How much? 1970s Framus Tenor Banjo, SOLD! Photo How much? 1930 Gibson A-50, natural, SOLD! Photo How much? 1940s Gibson A-50 Mandolin, sunburst, SOLD! Photo How much? 1941 Gibson ETB-150 Electric Tenor Banjo, sunburst, SOLD! Photo How much? 1925 Gibson Style A Mandolin, black, SOLD! Photo How much? 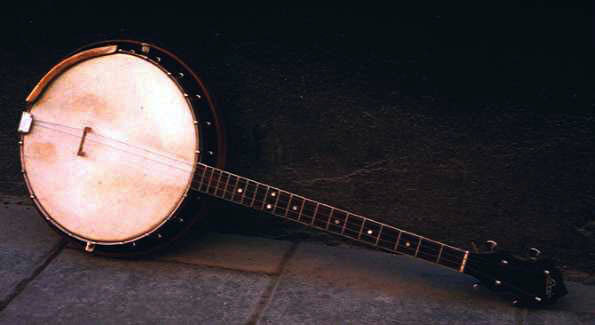 1925-1926 Gibson TB-5 Mastertone Tenor Banjo, SOLD! Photo How much? 1965 Gibson TB-100 Tenor Banjo, SOLD! Photo How much? 1950s Gibson UKE-1 Ukulele, sunburst, SOLD! Photo How much? Gold Tone Banjola, natural, SOLD! Photo How much? Gold Tone OB-250, vintage brown, SOLD! Photo How much? 1960s Hagström Capri windorgan, accordion style pushbuttons, SOLD! Photo How much? 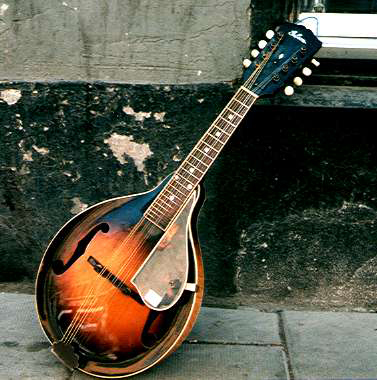 Late 1930s Kalamazoo KM-11 Mandolin, sunburst, SOLD! Photo How much? 1930 Harmony Roy Smeck Vita Uke, natural, SOLD! Photo How much? 1937 Kalamazoo KG-11, sunburst, SOLD! Photo How much? 1988 Landola M-90 Mandolin, natural, SOLD! Photo How much? 1923 Levin A 2 Mandolin, natural, SOLD! Photo How much? 1929 Levin G 100 Guitar Banjo, SOLD! Photo How much? 1940 Levin M 50, sunburst, SOLD! Photo How much? 1945 Levin Model 122, natural, SOLD! Photo How much? 1945 Levin Model 131, sunburst, SOLD! Photo How much? 1939 Levin Model 375, sunburst, SOLD! Photo How much? 1951 Levin Model 40 Aristokrat, sunburst, SOLD! Photo How much? 1956 Levin Model 42, sunburst, SOLD! Photo How much? 1951 Levin Model 44 Rosalie, natural, SOLD! Photo How much? 1936 Levin Model 505, natural, SOLD! Photo How much? 1920s Levin Model 52, natural, SOLD! Photo How much? 1957 Levin Model 55, sunburst, SOLD! Photo How much? 1946 Levin Model 335, sunburst, SOLD! Photo How much? 1938 Levin Model 375, sunburst, SOLD! Photo How much? 1948 Levin Model 40 Aristokrat Mandolin, sunburst, SOLD! Photo How much? 1948 Levin Model 40N Aristokrat Mandolin, natural, SOLD! Photo How much? 1949 Levin Model 40N Aristokrat Mandolin, natural, SOLD! Photo How much? 1953 Levin Model 40N Aristokrat Mandolin, natural, SOLD! Photo How much? 1955 Levin Model 40 Mandolin, faded sunburst, SOLD! Photo How much? 1952 Levin Model 41N King, natural, SOLD! Photo How much? 1948 Levin Model 42N Master Mandolin, natural, SOLD! Photo How much? 1953 Levin Model 42N Master Mandolin, natural, SOLD! Photo How much? 1952 Levin Model 43 Serenad, sunburst, SOLD! Photo How much? 1956 Levin Model 44 Mandolin, sunburst, SOLD! Photo How much? 1950 Levin Model 46 Classic Mandolin, sunburst, SOLD! Photo How much? 1950 Levin Model 47 Mandolin, sunburst, SOLD! Photo How much? 1954 Levin Model 54 Taranto, sunburst, SOLD! Photo How much? 1956 Levin Model 54 Mandolin, sunburst, SOLD! Photo How much? 1958 Levin Model 54 Mandolin, sunburst, SOLD! Photo How much? 1918 Levin Model 55 Mandolin, natural, SOLD! Photo How much? 1955 Levin Model 55 Mandolin, sunburst, SOLD! Photo How much? 1958 Levin Model 55 Mandolin, sunburst, SOLD! Photo How much? 1963 Levin Model 55 Mandolin, sunburst, SOLD! Photo How much? 1963 Levin Model 55, sunburst, SOLD! Photo How much? 1960 Levin Model 92 Honolulu Ukulele, mahogany, SOLD! Photo How much? 1955 Levin Model 92 Honolulu, natural, SOLD! Photo How much? 1946 Levin Model 105, natural, SOLD! Photo How much? 1947 Levin Model 131, sunburst, SOLD! Photo How much? 1928 Levin Model 135, natural, SOLD! Photo How much? 1977 Levin Model 158 Mandolin, sunburst, SOLD! Photo How much? 1930 Levin Model 300 Tenor Guitar, natural, SOLD! Photo How much? 1943 Levin Model 320 Mandolin, sunburst, SOLD! Photo How much? 1945 Levin Model 320 Mandolin, sunburst, SOLD! Photo How much? 1946 Levin Model 320 Mandolin, sunburst, SOLD! Photo How much? 1944 Levin Model 335 Mandolin, sunburst, SOLD! Photo How much? 1947 Levin Model 340 Mandolin, sunburst, SOLD! Photo How much? 1944 Levin Model 345 Mandolin, sunburst, SOLD! Photo How much? 1947 Levin Model 350 Mandolin, sunburst, SOLD! Photo How much? 1934 Levin Model 365 Mandolin, natural, SOLD! Photo How much? 1936 Levin Model 380 Mandolin, sunburst, SOLD! Photo How much? 1934 Levin Model 395 Mandolin, sunburst, SOLD! Photo How much? 1936 Levin Model 412 Mandolin, sunburst, SOLD! Photo How much? 1937 Levin Model 420 Mandolin, mahogany, SOLD! Photo How much? 1927 Levin T 100 Tenor Banjo, SOLD! Photo How much? 1928 Levin T 100 Tenor Banjo, SOLD! Photo How much? 1935 Levin T 100 Tenor Banjo, SOLD! Photo How much? 1935 Levin T 175, SOLD! Photo How much? 1929 Levin T 175 Tenor Banjo, SOLD! Photo How much? 1929 Levin archtop mandola, sunburst, SOLD! Photo How much? 2010s Mahalo U30G YW, yellow, SOLD! Photo How much? 1963 Martin 0-18T, natural, SOLD! Photo How much? 1951 Martin 5-15T, mahogany, SOLD! Photo How much? 2004 Mike Soaresy Tenor Resonator Archtop, sunburst, SOLD! Photo How much? Monica archtop plectrum guitar, natural, SOLD! Photo How much? 1905 Musikalia Mandolin Banjo, natural, SOLD! Photo How much? 1999 Musikalia baritone ukulele, natural, SOLD! Photo How much? 1970s Musima Guitar Banjo, 6-string, SOLD! Photo How much? 1940s Noname Mandolin Banjo, SOLD! Photo How much? Noname Tenor Banjo, Candy Apple Red, SOLD! Photo How much? ca 1950s Noname Ukulele, SOLD! Photo How much? 1950s Noname round bottom mandolin, natural, SOLD! Photo How much? Noname tenor banjo, SOLD! Photo How much? Nordwall #100 Stor Cittern, natural, SOLD! Photo How much? Nordwall Cittern Mellan, natural, SOLD! Photo How much? Nordwall Mandolin, natural, SOLD! Photo How much? Ozark Model 3616T, tenor guitar, SOLD! Photo How much? Saga 5-string, open back, SOLD! Photo How much? 1961 Silvertone Harmonium, SOLD! Photo How much? ca 1920s Slingerland Tenor Banjo, open back, SOLD! Photo How much? 2000s Villanueva Quisbert Charango, made in Bolivia, SOLD! Photo How much? ABM lap steel, black, SOLD! Photo How much? 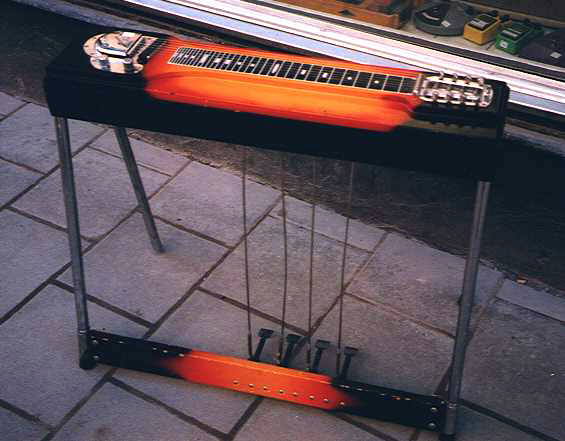 1961 Airline Studio Lap Steel, black, SOLD! Photo How much? 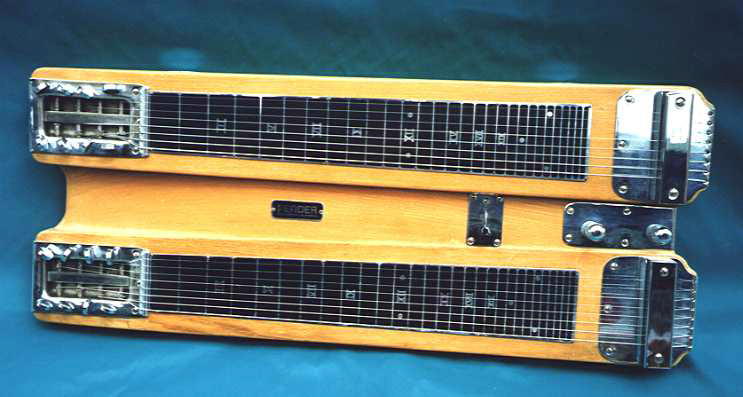 1953 Fender Champ Lap Steel, SOLD! Photo How much? 1948 Fender Dual 8 Professional Lap Steel, butterscotch, SOLD! Photo How much? 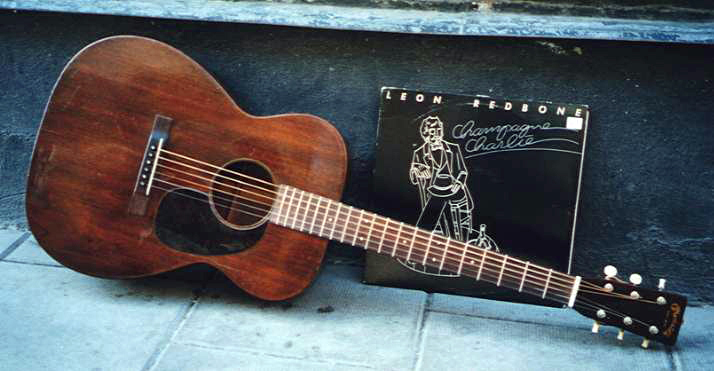 1957 Fender Model 1000, refin marble, SOLD! Photo How much? 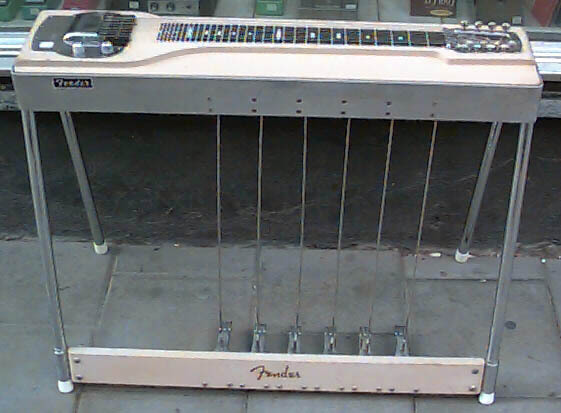 1958 Fender Model 400 Pedal Steel, Desert Sand, SOLD! Photo How much? 1965 Fender Model 400 Pedal Steel, sunburst, SOLD! Photo How much? 1957 Fender Stringmaster D8, blonde, SOLD! Photo How much? 1952 Gibson BR-6 Lap Steel, sunburst, SOLD! Photo How much? 1950s Gibson BR-9 Lap Steel, tan & brown, SOLD! Photo How much? 1955 Gibson Console Grande CGN, natural, SOLD! Photo How much? 1939 Gibson EH-150 Lap Steel, sunburst, SOLD! Photo How much? 1975 MSA D-10, gold metallic, SOLD! Photo How much? 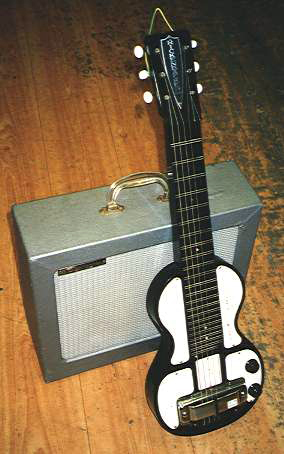 1950s Magnatone Palmtree lap steel & amp, gray MOTS, SOLD! Photo How much? 1990s Morrell Lap Steel, black, SOLD! Photo How much? 1966 National 3-leg Steel red/white, SOLD! Photo How much? 1942-1947 National-Dobro Princess Lap Steel, white pearl, SOLD! Photo How much? ca 1950 Rickenbacker Model BD-8 Lap Steel, black bakelite, SOLD! Photo How much? 1950s Rickenbacker Model BD-8 Lap Steel, black bakelite, SOLD! Photo How much? 1953 Rickenbacker Model B Lap Steel, black bakelite, SOLD! Photo How much? 1978 Sho-Bud Maverick, pedal steel, SOLD! Photo How much? 1964 Supro Jet Airliner, 8-string leg steel, black/white, SOLD! Photo How much? 1950 Supro Student Deluxe Lap Steel, natural, SOLD! Photo How much? 1981 Belomy Jazz Bass, sunburst, SOLD! Photo How much? 1965 Burns Jazz Bass, sunburst, SOLD! Photo How much? 1962-1963 Burns Vista Sonic Bass, refinished red, cut down body, SOLD! Photo How much? 1970s Cimar Jazz Bass-copy, sunburst, SOLD! Photo How much? Danelectro 58 Longhorn, black, SOLD! Photo How much? 2003 Eagle Hazze Wazzeen, gold metallic, SOLD! Photo How much? Egmond Princess, sunburst, SOLD! Photo How much? 1960s Eko Model 995 Violin Bass, walnut, SOLD! Photo How much? 2015 Epiphone Thunderbird IV PRO, Trans Black, SOLD! Photo How much? Epiphone Thunderbird IV Pro, Trans Black, SOLD! Photo How much? Ernie Ball Music Man Silhouette Baritone Bass VI, black, SOLD! Photo How much? 2016 Fender 1962 CS Precision Bass Closet Classic, Sonic Blue, SOLD! Photo How much? 2012 Fender American Vintage '62 Jazz Bass, sunburst, SOLD! Photo How much? 1961 Fender Bass VI, sunburst, SOLD! Photo How much? 1996-1997 Fender Bass VI, sunburst, SOLD! Photo How much? 1997 Fender BG-29, black, SOLD! Photo How much? 1967 Fender Coronado Bass I, sunburst, SOLD! Photo How much? 2002 Fender Deluxe Zone BK, black, SOLD! Photo How much? 2010 Fender Jaguar Bass, sunburst, SOLD! Photo How much? 1964 Fender Jazz Bass, refinished sunburst, SOLD! Photo How much? 1964 Fender Jazz Bass, refinished transparent orange, SOLD! Photo How much? 1965 Fender Jazz Bass, sunburst, SOLD! Photo How much? 1965 Fender Jazz Bass, refinished sunburst, SOLD! Photo How much? 1966 Fender Jazz Bass, refinished body only Olympic White, SOLD! Photo How much? 1966 Fender Jazz Bass, refinished black, SOLD! Photo How much? 1966 Fender Jazz Bass, sunburst, SOLD! Photo How much? 1968 Fender Jazz Bass, sunburst, SOLD! Photo How much? 1970 Fender Jazz Bass, sunburst, SOLD! Photo How much? 1971 Fender Jazz Bass, sunburst, SOLD! Photo How much? 1971 Fender Jazz Bass, Candy Apple Red, SOLD! Photo How much? 1972 Fender Jazz Bass, sunburst, SOLD! Photo How much? 1973 Fender Jazz Bass, Lake Placid Blue, SOLD! Photo How much? 1973 Fender Jazz Bass, sunburst, SOLD! Photo How much? 1974 Fender Jazz Bass, refinished black, SOLD! Photo How much? 1974 Fender Jazz Bass, refinished natural, SOLD! Photo How much? 1974 Fender Jazz Bass, sunburst, SOLD! Photo How much? 1974 Fender Jazz Bass, natural, SOLD! Photo How much? 1975 Fender Jazz Bass, Mocha Brown, SOLD! Photo How much? 1975 Fender Jazz Bass, sunburst, SOLD! Photo How much? 1975 Fender Jazz Bass, Olympic White, SOLD! Photo How much? 1977 Fender Jazz Bass, Olympic White, SOLD! Photo How much? 1977 Fender Jazz Bass, sunburst, SOLD! Photo How much? 1977 Fender Jazz Bass, black, SOLD! Photo How much? 1978 Fender Jazz Bass, see through red, SOLD! Photo How much? 1978 Fender Jazz Bass, walnut, SOLD! Photo How much? 1978 Fender Jazz Bass, black, SOLD! Photo How much? 1979 Fender Jazz Bass, sunburst, SOLD! Photo How much? 1980 Fender Jazz Bass, sunburst, SOLD! Photo How much? 1983 Fender Jazz Bass, black, SOLD! Photo How much? 1992 Fender Jazz Bass '62 Reissue, Olympic White, SOLD! Photo How much? 1998 Fender Jazz Bass '62 Reissue, Olympic White, SOLD! Photo How much? 1998 Fender Jazz Bass '62 Reissue, sunburst, SOLD! Photo How much? 1999 Fender Jazz Bass '62 Reissue, Lake Placid Blue, SOLD! Photo How much? 2012 Fender Jazz Bass Deluxe V, Olympic White, SOLD! Photo How much? 1997-1998 Fender Jazz Bass Japan, sunburst, SOLD! Photo How much? 2015 Fender Kingman Bass SCE 3TS, sunburst, SOLD! Photo How much? 1971 Fender Musicmaster Bass, refinished Dakota Red, SOLD! Photo How much? 1972 Fender Musicmaster Bass, refin blue, SOLD! Photo How much? 1972 Fender Musicmaster Bass, Dakota Red, SOLD! Photo How much? 1975 Fender Musicmaster Bass, refin blue, SOLD! Photo How much? 1975 Fender Musicmaster Bass, Olympic White, SOLD! Photo How much? 1976 Fender Musicmaster Bass, black, SOLD! Photo How much? 1971 Fender Mustang Bass, Competition Blue, SOLD! Photo How much? 1977 Fender Mustang Bass, black, SOLD! Photo How much? 1977 Fender Mustang Bass, walnut, SOLD! Photo How much? 1978 Fender Mustang Bass, walnut, SOLD! Photo How much? 1965 Fender Precision Bass, sunburst, SOLD! Photo How much? 1966 Fender Precision Bass, sunburst, SOLD! Photo How much? 1966 Fender Precision Bass, old refinished yellowed Olympic White, SOLD! Photo How much? 1970 Fender Precision Bass, sunburst, SOLD! Photo How much? 1974 Fender Precision Bass, sunburst, SOLD! Photo How much? 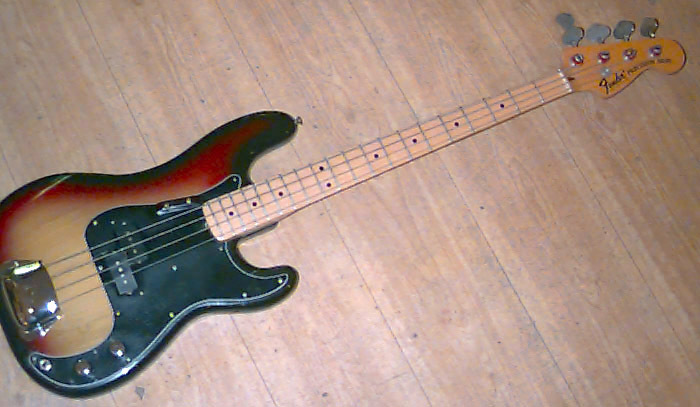 1974 Fender Precision Bass, black, SOLD! Photo How much? 1974 Fender Precision Bass, old refinished white, SOLD! Photo How much? 1975 Fender Precision Bass, mocha brown, SOLD! Photo How much? 1975 Fender Precision Bass, sunburst, SOLD! Photo How much? 1975 Fender Precision Bass, Olympic White, SOLD! Photo How much? 1975 Fender Precision Bass, walnut, SOLD! Photo How much? 1976 Fender Precision Bass, blonde, SOLD! Photo How much? 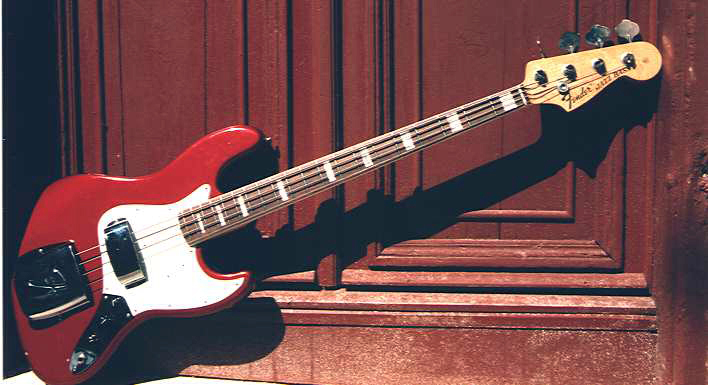 1983 Fender Precision Bass, Candy Apple Red, SOLD! Photo How much? 1976 Fender Precision Fretless Bass, sunburst, SOLD! Photo How much? 1976 Fender Precision Bass, sunburst, SOLD! Photo How much? 1977 Fender Precision Bass, black, SOLD! Photo How much? 1978 Fender Precision Bass, sunburst, SOLD! Photo How much? 1979 Fender Precision Bass, Antigua, SOLD! Photo How much? 1979 Fender Precision Bass, natural, SOLD! Photo How much? 1979 Fender Precision Bass Lefty, blonde, SOLD! Photo How much? 1980 Fender Precision Bass, wine red, SOLD! Photo How much? 1984 Fender Precision Bass, black, SOLD! Photo How much? 2000 Fender Precision Bass Mexico, Candy Apple Red, SOLD! Photo How much? 1998 Fender Precision Bass Duck Dunn Japan, Candy Apple Red, SOLD! Photo How much? 1982 Fender Precision Bass Japan, sunburst, SOLD! Photo How much? 1993 Fender Precision Bass '51 Reissue Japan, sunburst, SOLD! Photo How much? 1994 Fender Precision Bass '51 Reissue Japan, butterscotch, SOLD! Photo How much? 1992 Fender Precision Bass '57 Reissue, black, SOLD! Photo How much? 1992 Fender Precision Bass '57 Reissue, vintage white, SOLD! Photo How much? 2000 Fender Precision Bass '59 Relic, sunburst, SOLD! Photo How much? 2003 Fender Standard Jazz Bass, sunburst, SOLD! Photo How much? 2009 Fender Standard Precision Bass, sunburst, SOLD! Photo How much? 2015 Fender Standard Precision Bass, black, SOLD! Photo How much? 1972 Fender Telecaster Bass, sunburst, SOLD! Photo How much? 1974 Fender Telecaster Bass, refinished natural, SOLD! Photo How much? 1989 Fernandez Tomahawk, red metallic, SOLD! Photo How much? 1965 Framus Star, sunburst, SOLD! Photo How much? 1970s Framus Star-Bass-Linie, sunburst, SOLD! Photo How much? 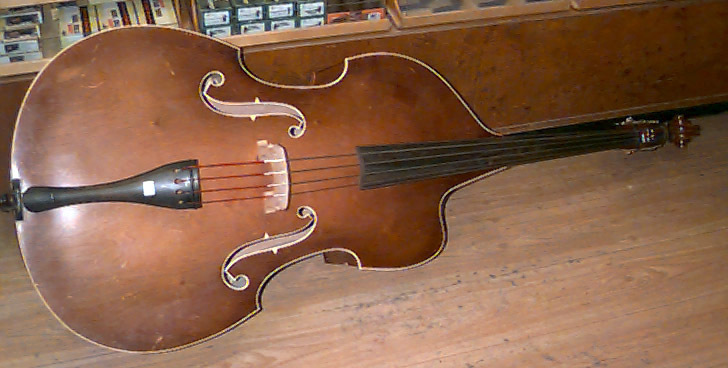 Framus double bass, natural, SOLD! Photo How much? 1960 Gibson EB-0, faded cherry, SOLD! Photo How much? 1962 Gibson EB-0, cherry, SOLD! Photo How much? 1973 Gibson EB-0, walnut, SOLD! Photo How much? 1973 Gibson EB-0, cherry, SOLD! Photo How much? 1970 Gibson EB-0L, walnut, SOLD! Photo How much? 1964 Gibson EB-2, sunburst, converted to EB-2D, SOLD! Photo How much? 1967 Gibson EB-2, sunburst, SOLD! Photo How much? 1966 Gibson EB-3, cherry, SOLD! Photo How much? 1971 Gibson EB-3, walnut, SOLD! Photo How much? 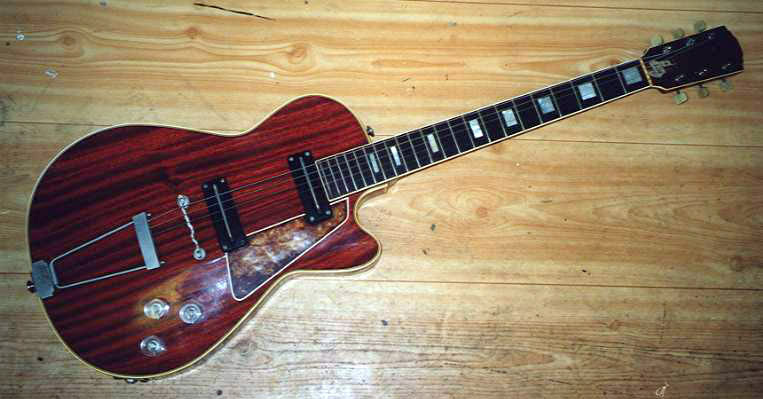 1973 Gibson EB-3, faded cherry, SOLD! Photo How much? 1974 Gibson EB-3L, cherry, SOLD! Photo How much? 1984 Gibson Explorer, Alpine White, SOLD! Photo How much? 1975 Gibson Grabber G-3, natural, SOLD! Photo How much? 1978 Gibson RD Artist Bass, natural, SOLD! Photo How much? 1978 Gibson Ripper, natural, SOLD! Photo How much? 1976 Gibson Ripper L-9S, black, SOLD! Photo How much? 1974 Gibson The Grabber, walnut, SOLD! Photo How much? 1973 Gibson Triumph Bass, walnut, SOLD! Photo How much? 1990 Godin Acoustibass, black, SOLD! Photo How much? Greco SAB-100, cherry, SOLD! Photo How much? 1980 Gretsch Committee Bass, natural, SOLD! Photo How much? 2017 Gretsch Electromatic Junior Jet II, black, SOLD! Photo How much? 1979 Guild B-302, mahogany, SOLD! Photo How much? 1979 Guild B-302, cherry, SOLD! Photo How much? 1997 HPD Warmoth Marty Bell finish, red flake, SOLD! Photo How much? 1966 Hagström Concord, sunburst, SOLD! Photo How much? 1966 Hagström HIIB, red, SOLD! Photo How much? 1978 Hagström HPD Jazzbass/Scanbass, natural, SOLD! Photo How much? 1965 Hagström II B, red, SOLD! Photo How much? 1966 Hagström II B, black, SOLD! Photo How much? 1967 Hagström II B, black, SOLD! Photo How much? 1967 Hagström Concord, black, SOLD! Photo How much? 1967 Hagström Concord, sunburst, SOLD! Photo How much? 1965 Hagström Coronado IV, sunburst, SOLD! Photo How much? 1966 Hagström Coronado IV, sunburst, SOLD! Photo How much? 1966 Hagström Coronado IV, glowing red, SOLD! Photo How much? 1961 Hagström De Luxe, red sparkle, SOLD! Photo How much? 1970 Hagström HIIB, sunburst, SOLD! Photo How much? 1971 Hagström HIIBN, sunburst, SOLD! Photo How much? 1972 Hagström HIIBN, cherry, SOLD! Photo How much? 1974 Hagström HIIBN, cherry, SOLD! Photo How much? 1976 Hagström HIIBN, sunburst, SOLD! Photo How much? 1974 Hagström Jazz Bass, cherry, SOLD! Photo How much? 1970s Hagström Jazzbass , sunburst, SOLD! Photo How much? 1974 Hagström Jazzbass, cherry, SOLD! Photo How much? 1974 Hagström Jazzbass, mahogany, SOLD! Photo How much? 1964 Hagström Kent PB-24-BG, rare burgundy color, SOLD! Photo How much? 1964 Hagström Kent, blue, SOLD! Photo How much? 1964 Hagström Kent, red, SOLD! Photo How much? 1965 Hagström Kent IB, red, SOLD! Photo How much? 1962 Hagström PB-24-BG, red, SOLD! Photo How much? 1963 Hagström PG-24-BG, blue, SOLD! Photo How much? 1977 Hagström Scanbass, mahogany, SOLD! Photo How much? 1980 Hagström Super Swede, sunburst, Lefty, SOLD! Photo How much? 1981 Hagström Super Swede, walnut, SOLD! Photo How much? 1981 Hagström Super Swede, black, SOLD! Photo How much? 1974 Hagström Swede, dark cherry, SOLD! Photo How much? 1976 Hagström Swede, black, SOLD! Photo How much? 1958 Höfner 500/1, sunburst, SOLD! Photo How much? 2016 Höfner Club Ignition HI-CB-CS, sunburst, SOLD! Photo How much? 2018 Höfner Ignition Violin Bass HI-BB VSB, sunburst, SOLD! Photo How much? 1960s Höfner Model 182, red vinyl, SOLD! Photo How much? 1963 Höfner Model 182, red, SOLD! Photo How much? 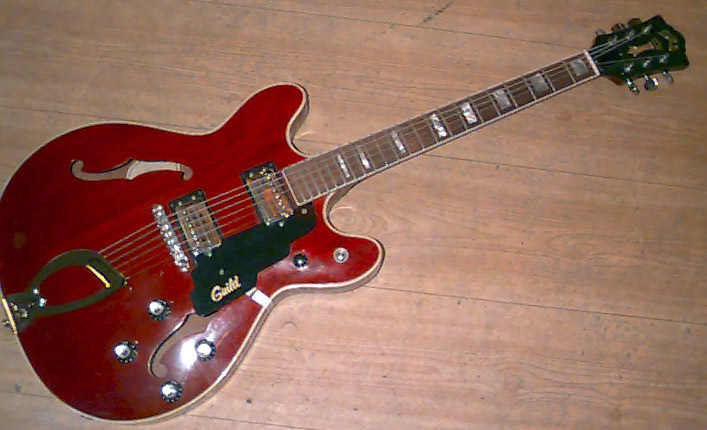 1964 Höfner Model 185, red vinyl, SOLD! Photo How much? 1962 Höfner Model 500/1, sunburst, SOLD! Photo How much? 1963 Höfner Model 500/1, sunburst, SOLD! Photo How much? 1965 Höfner Model 500/1, sunburst, SOLD! Photo How much? 1966 Höfner Model 500/1, sunburst, SOLD! Photo How much? 1969 Höfner Model 500/1, sunburst, SOLD! Photo How much? 1980 Höfner Model 500/1, sunburst, SOLD! Photo How much? 1967 Höfner Model 500/1B, sunburst, SOLD! Photo How much? 1964 Höfner Model 500/2, sunburst, SOLD! Photo How much? 1965 Höfner Model 500/2, sunburst, SOLD! Photo How much? 1966 Höfner Model 500/2, sunburst, SOLD! Photo How much? 1966 Höfner Model 500/5 President, sunburst, SOLD! Photo How much? 1979 Ibanez Black Eagle, black, SOLD! Photo How much? Ibanez GSR180-BS, sunburst, SOLD! Photo How much? 1977 Ibanez Jazz Bass, sunburst, SOLD! Photo How much? Ibanez K5-BKF, black, SOLD! Photo How much? 2016 Ibanez Talman Bass TMB100, Mint Green, SOLD! Photo How much? 1960s JG (Eko), cherry, SOLD! Photo How much? 1975 Kasuga Jazz Bass, sunburst, SOLD! Photo How much? 1958 Kay, sunburst, SOLD! Photo How much? 1987-1988 Kramer Ferrington KFB-2, black, SOLD! Photo How much? 1983 Kramer Pioneer Special, black, SOLD! Photo How much? 1988 LTD B-55, black, SOLD! Photo How much? Line 6 Lowdown LD150 Variax Bass 700, black, SOLD! Photo How much? 1991 Martin B-40 Acoustic Bass, natural, SOLD! Photo How much? 1976 Matsumoku Alembic-style, natural, SOLD! Photo How much? 1970s Morris Jazz Bass-copy, sunburst, SOLD! Photo How much? 1980s Morris, white, SOLD! Photo How much? 1977 Music Man StingRay, walnut, SOLD! Photo How much? 1940s Noname Rockabilly Stand Up Bass, cutaway and binding, SOLD! Photo How much? 1984 Peavey T-20, sunburst, SOLD! Photo How much? 1991 Peavey TL-Five, red, SOLD! Photo How much? 2014 Rickenbacker 4003, Mapleglo, SOLD! Photo How much? 2016 Rickenbacker 4003, Midnight Blue, SOLD! Photo How much? 1973 Rickenbacker Model 4001, fireglo, SOLD! Photo How much? 1973 Rickenbacker Model 4001, jetglo, SOLD! Photo How much? 1974 Rickenbacker Model 4001, fireglo, SOLD! Photo How much? 1975 Rickenbacker Model 4001, cherry, SOLD! Photo How much? 1976 Rickenbacker Model 4001, wine red, SOLD! Photo How much? 1976 Rickenbacker Model 4001, white, SOLD! Photo How much? 1976 Rickenbacker Model 4001, jetglo, SOLD! Photo How much? 1977 Rickenbacker Model 4001, burgundy, SOLD! Photo How much? 1992 Rickenbacker Model 4003, jetglo, SOLD! Photo How much? 2002 Rickenbacker Model 4003, fireglo, SOLD! Photo How much? 2004 Rickenbacker Model 4003, fireglo, SOLD! Photo How much? Rock Bass by Warwick , sunburst, SOLD! Photo How much? 2011 Sandberg California PM5, cream white, SOLD! Photo How much? Sandberg California TM4 Custom Order, aged black, SOLD! Photo How much? Schecter Hellcat VI, Gloss Black, SOLD! Photo How much? ca 1972-1973 Sears Roebuck Model 1494, ivory, SOLD! Photo How much? 1974 Sigma Rickenbacker copy, fireglo, SOLD! Photo How much? Spector R5 NS2000, sunburst, SOLD! Photo How much? 2014 Squier Classic Vibe Precision Bass 50, Blonde, SOLD! Photo How much? 1982 Squier Precision Bass JV, sunburst, SOLD! Photo How much? Squier Vintage Modified Bass VI, black, SOLD! Photo How much? 2002 Steinberger XQ-2A, black, SOLD! Photo How much? 2014 Tanglewood TW155A Bass, natural, SOLD! Photo How much? 1974 Travis Bean 2000 Bass, natural, SOLD! Photo How much? 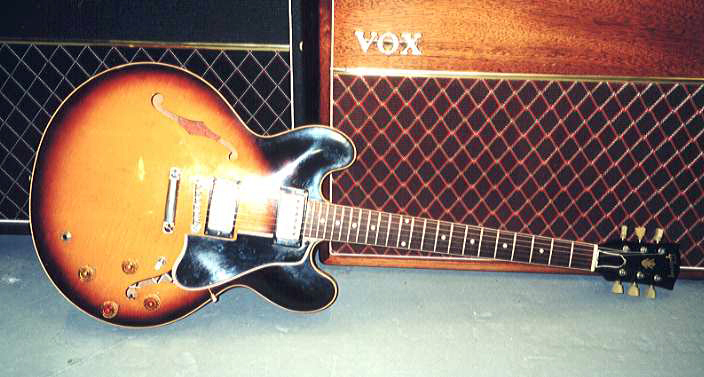 1968 Vox Saturn IV, sunburst, SOLD! Photo How much? Warwick Corvette 4 BR TS, red, SOLD! Photo How much? 1992 Washburn AB20, black, SOLD! Photo How much? 1980 Washburn Vulture, sunburst, SOLD! Photo How much? 1988 Westone Spectrum Series II, red, SOLD! Photo How much? Yamaha BBN5, walnut, SOLD! Photo How much? Yamaha RBX270J, black, SOLD! Photo How much? 2012 Yamaha RBX374, black, SOLD! Photo How much? Yamaha RBX550, black, SOLD! Photo How much? 1991 Ashdown MAG300, 1x15", SOLD! Photo How much? 2015 Blackstar S1-412A Cabinet, 4x12", SOLD! Photo How much? 1990s Budda Twinmaster Ten, SOLD! Photo How much? Bugera 212V-BK Vintage 2x12 140W Stereo Guitar Cabinet, SOLD! Photo How much? 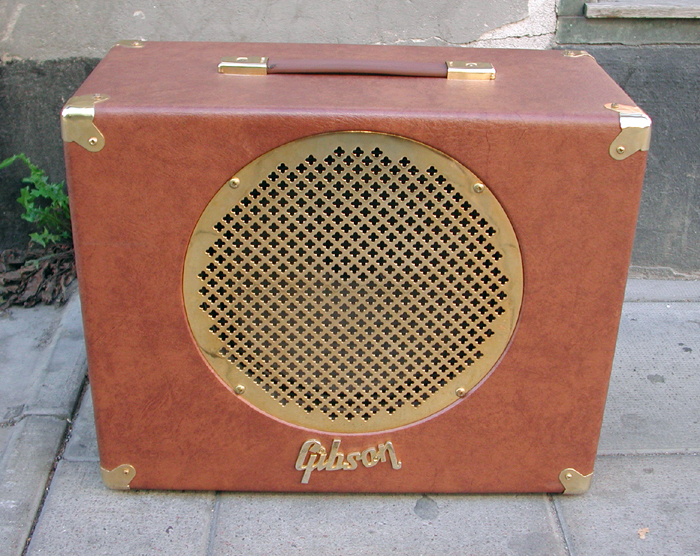 Carlsbro Bassline 120, 40 watts, SOLD! Photo How much? Crate GT112SL 1x12 Guitar Cabinet, SOLD! Photo How much? 1967 Danelectro DM25, 15 watts, 1x12, SOLD! Photo How much? 2017 EBS Classic Session, 120 watts, SOLD! Photo How much? EBS MultiComp, black, SOLD! Photo How much? EVH 5150 III, 100 watts, SOLD! Photo How much? 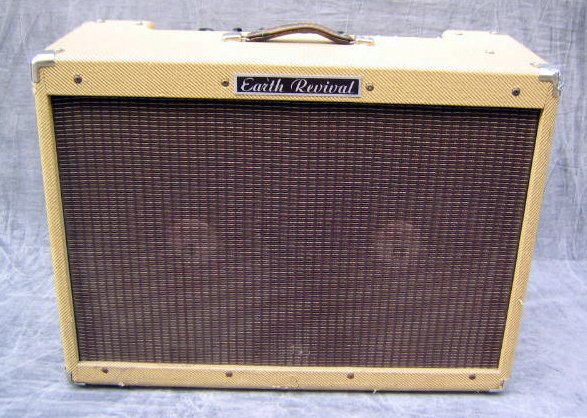 1975 Earth Revival, plastic tweed, 100 watts, 2x12" speakers, SOLD! Photo How much? 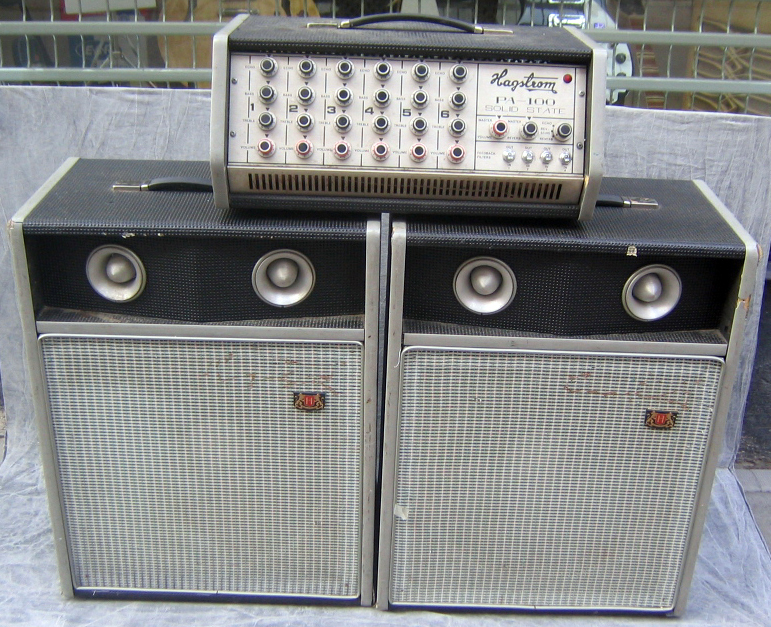 1976 Earth Revival, plastic tweed, 100 watts, 2x12" speakers, SOLD! Photo How much? Egnater Tweaker 15 Head, SOLD! Photo How much? 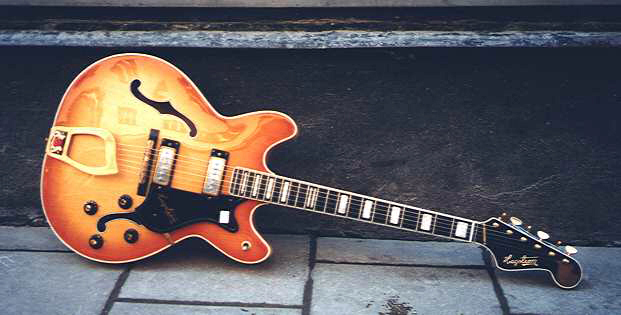 1962 Epiphone EA-50T Pacemaker, SOLD! Photo How much? 2016 Epiphone Slash Snakepit, 15 watts, SOLD! Photo How much? 1980 Fender 75, 1x15", SOLD! Photo How much? 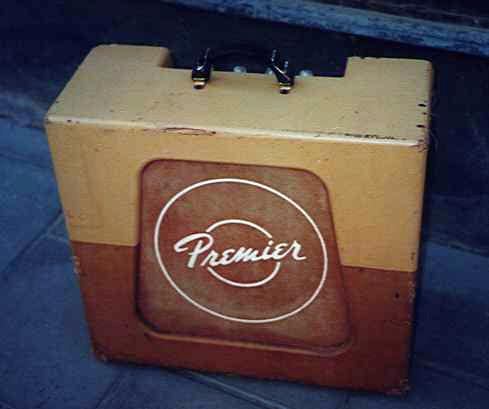 1965 Fender Bandmaster, 2x12", SOLD! Photo How much? 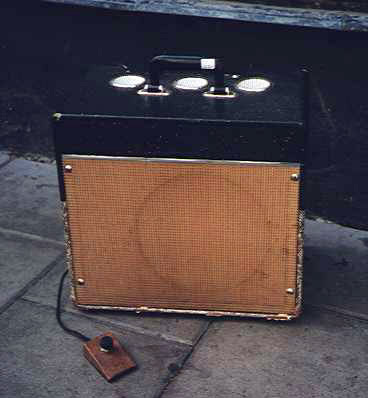 1958 Fender Bassman, 4x10", SOLD! Photo How much? 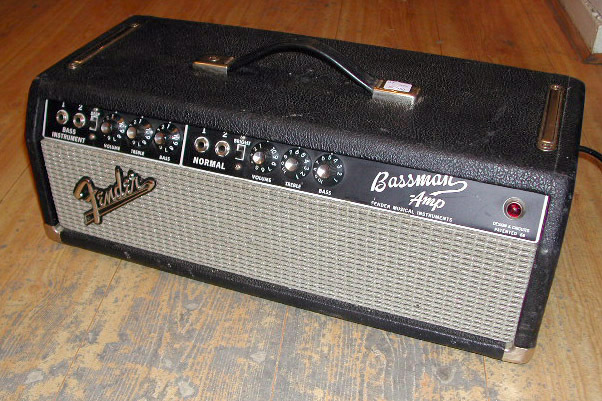 1965 Fender Bassman Amp, 50 watts, blackface, SOLD! Photo How much? 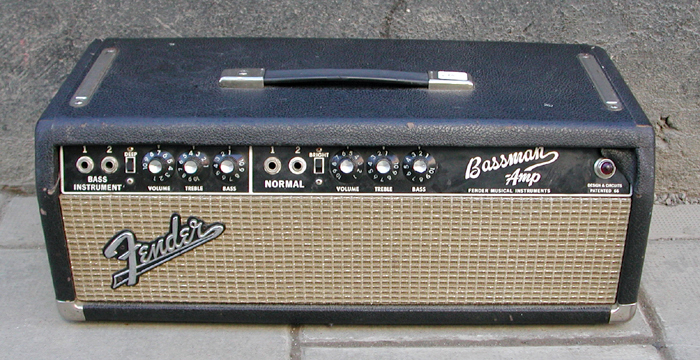 1967 Fender Bassman Amp, 50 watts, blackface, SOLD! Photo How much? 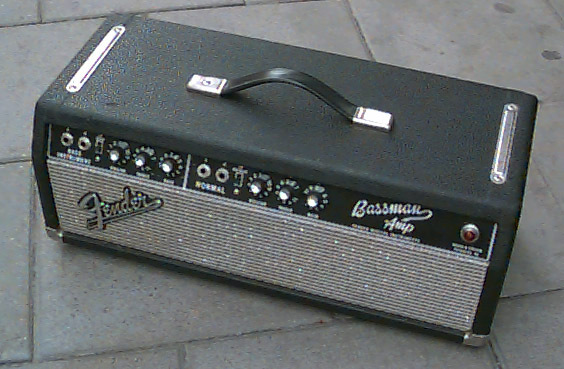 1967 Fender Bassman Amp, blackface, with 2x12" cabinet, SOLD! Photo How much? Fender Blues Junior, SOLD! Photo How much? Fender Blues Junior III, black, SOLD! Photo How much? Fender Blues Junior NOS, tweed, SOLD! Photo How much? 1957 Fender Champ, tweed, SOLD! Photo How much? 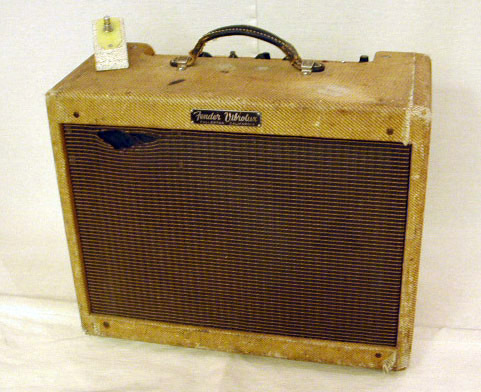 1960 Fender Champ, tweed, SOLD! Photo How much? 1962 Fender Champ, tweed, SOLD! Photo How much? 1965 Fender Champ, blackface, SOLD! Photo How much? 1977 Fender Champ, black, SOLD! Photo How much? 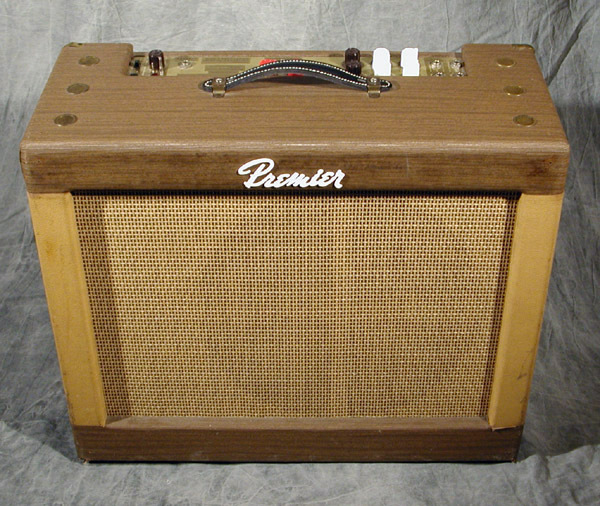 1962 Fender Concert, brown toolex, SOLD! Photo How much? 2004 Fender Cyber-Deluxe, SOLD! Photo How much? 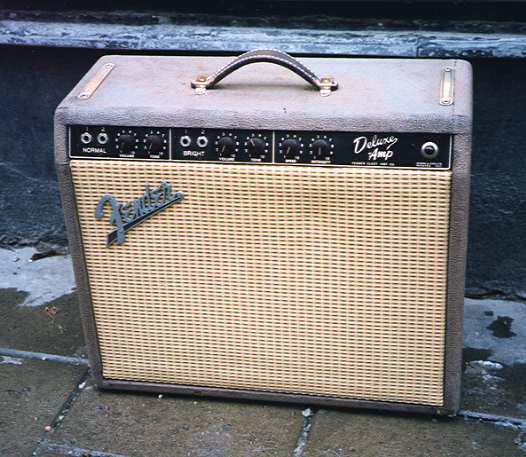 1955 Fender Deluxe, tweed, narrow panel SOLD! Photo How much? 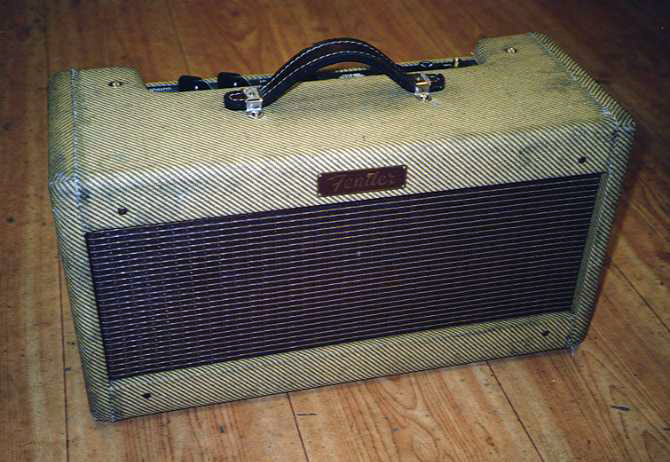 1960 Fender Deluxe, tweed, SOLD! Photo How much? 1962 Fender Deluxe, brownface, SOLD! Photo How much? 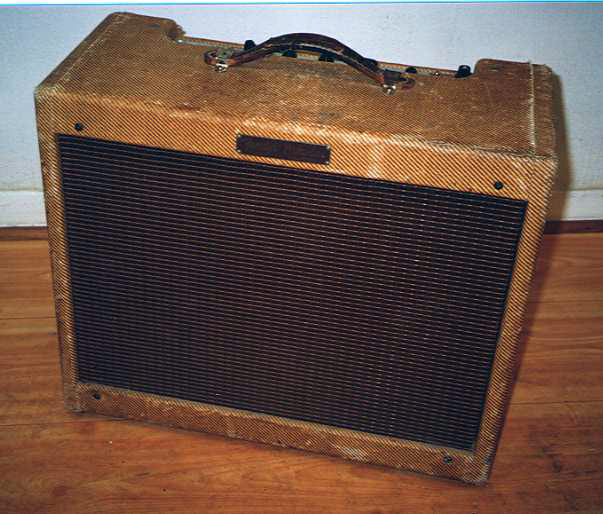 1961 Fender Deluxe Amp, brown toolex, SOLD! Photo How much? 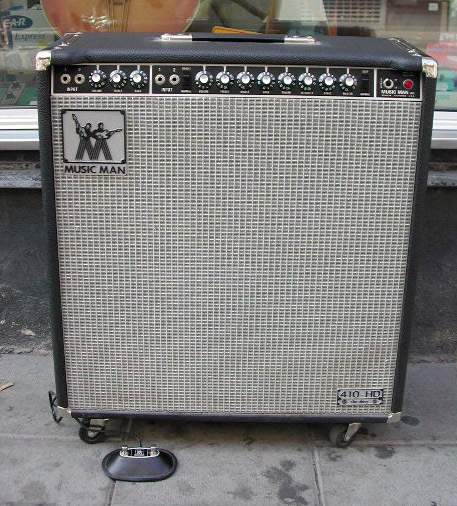 1966 Fender Deluxe Reverb, blackface, SOLD! Photo How much? 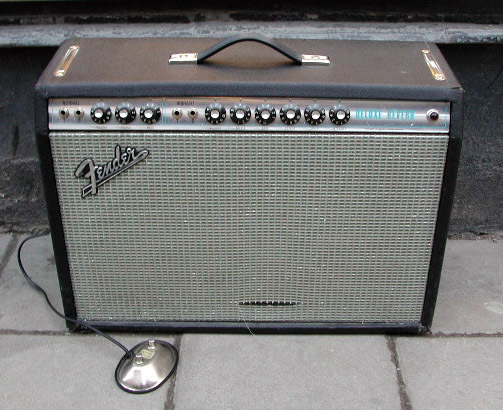 1972 Fender Deluxe Reverb, silverface, SOLD! Photo How much? 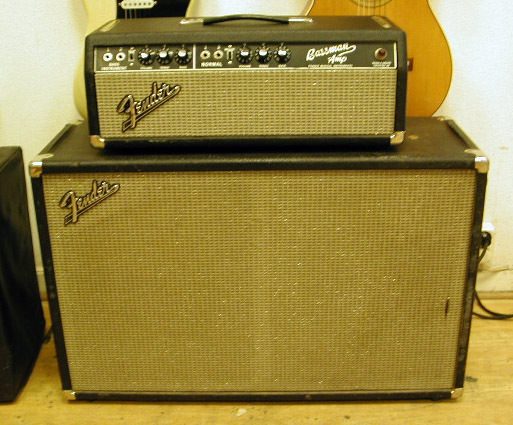 1964 Fender Deluxe Reverb-Amp, black toolex, SOLD! Photo How much? 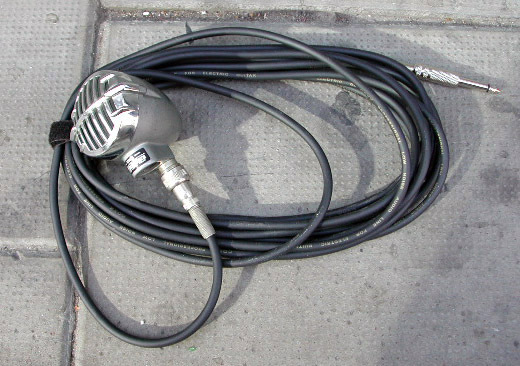 1997 Fender Frontman Reverb, SOLD! Photo How much? 2000s Fender G-DEC, built-in rhythm section and more!, SOLD! Photo How much? Fender Mustang Mini, block logo, SOLD! Photo How much? 1969 Fender Priceton Reverb, silverface, SOLD! Photo How much? 1964 Fender Princeton, blackface, SOLD! Photo How much? 1966 Fender Princeton, blackface, SOLD! Photo How much? 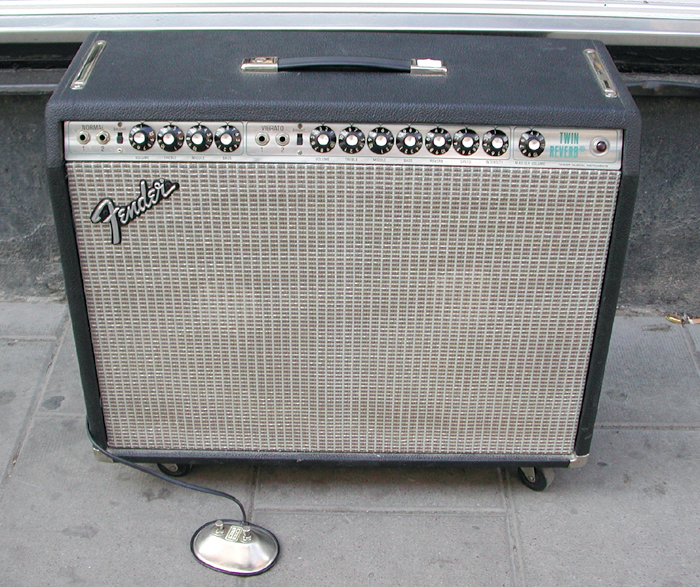 1966 Fender Princeton Reverb, blackface, SOLD! Photo How much? 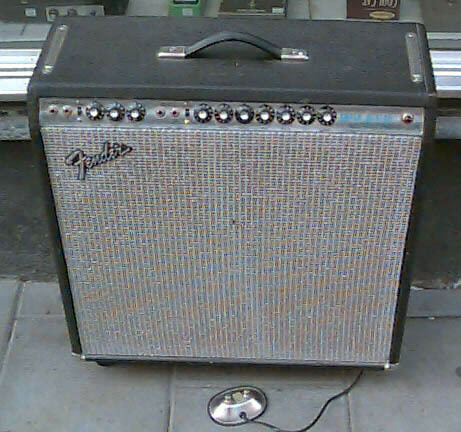 1981 Fender Princeton Reverb, silverface, SOLD! Photo How much? 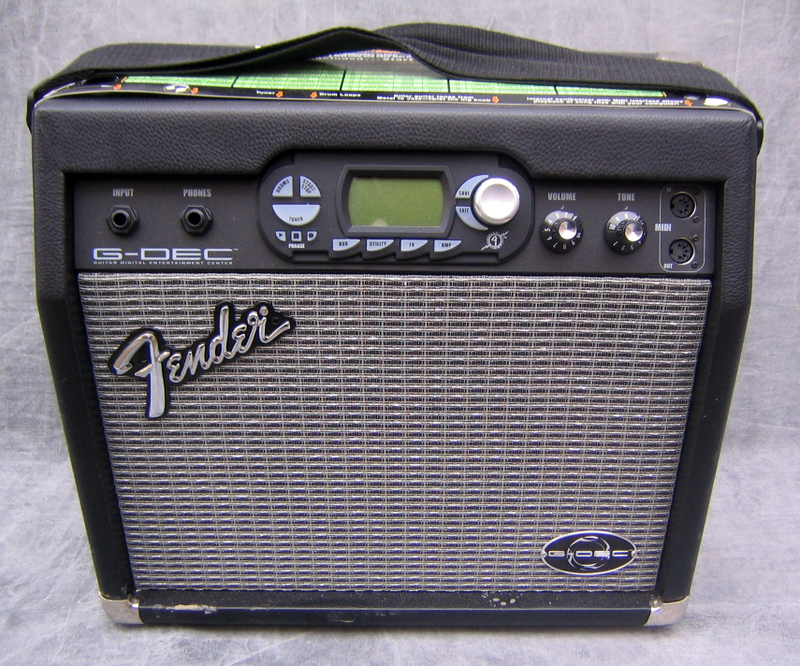 Fender Pro Junior, Weber speaker, SOLD! Photo How much? 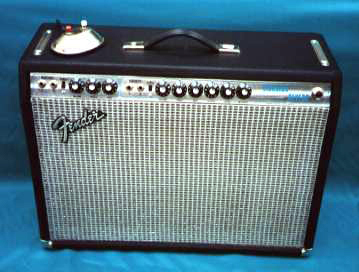 Fender Rumble 100, SOLD! Photo How much? 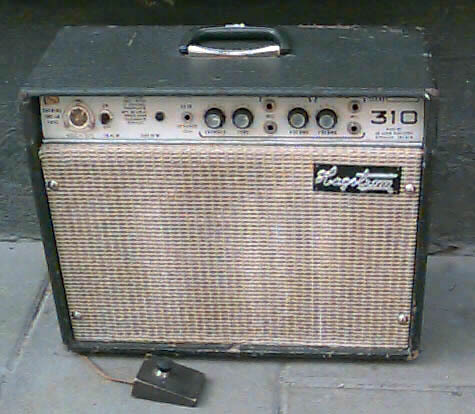 1965 Fender Showman Amp, blackface, 1x15" cabinet, SOLD! Photo How much? 1995 Fender Sidekick Reverb 35, 1x12", SOLD! Photo How much? 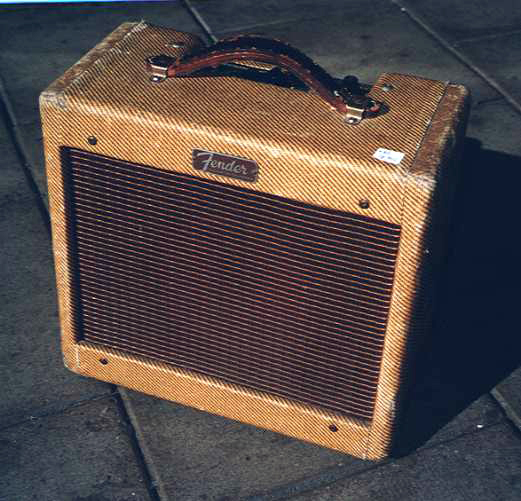 Fender Super Champ, 18 watts, SOLD! Photo How much? 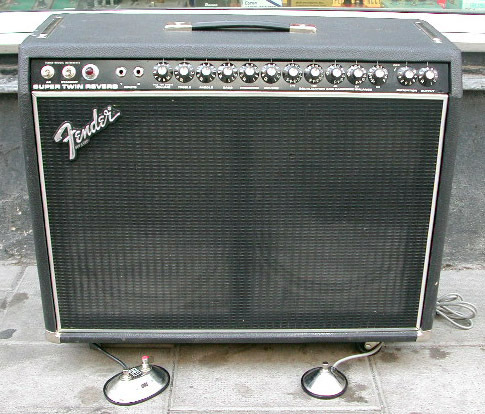 1974 Fender Super Reverb, 45 watts, SOLD! Photo How much? 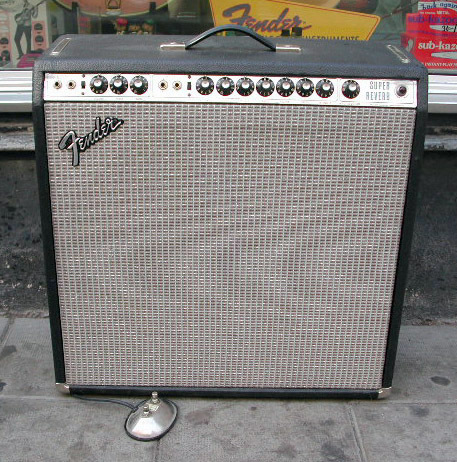 1974 Fender Super Reverb, SOLD! Photo How much? 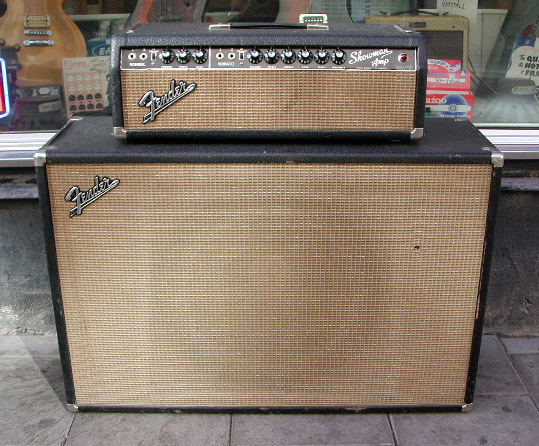 1976 Fender Super Reverb, SOLD! Photo How much? 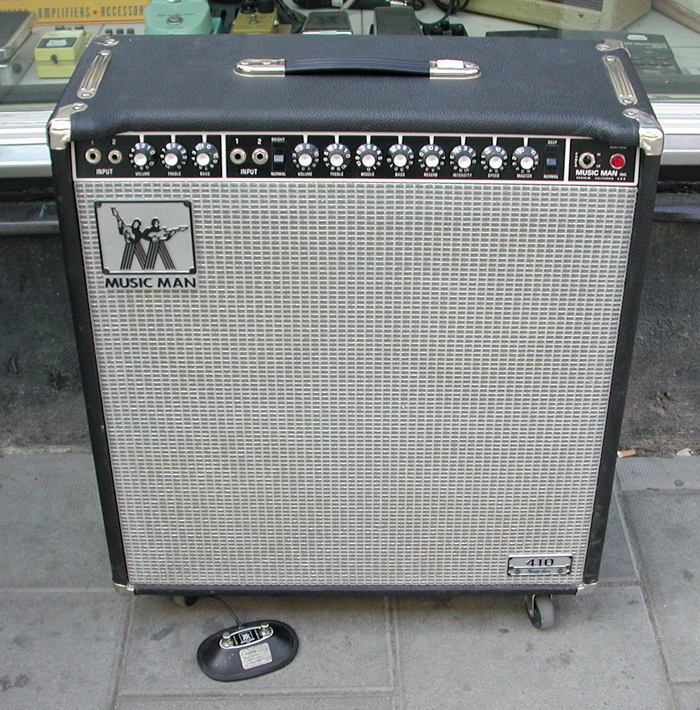 1977 Fender Super Twin Reverb, SOLD! Photo How much? 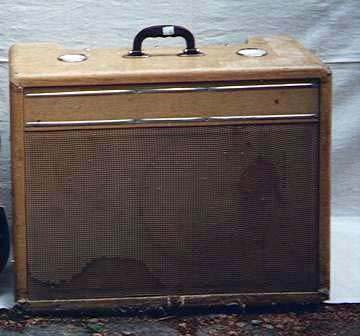 1973 Fender Twin Reverb, SOLD! Photo How much? 1976 Fender Twin Reverb, SOLD! Photo How much? 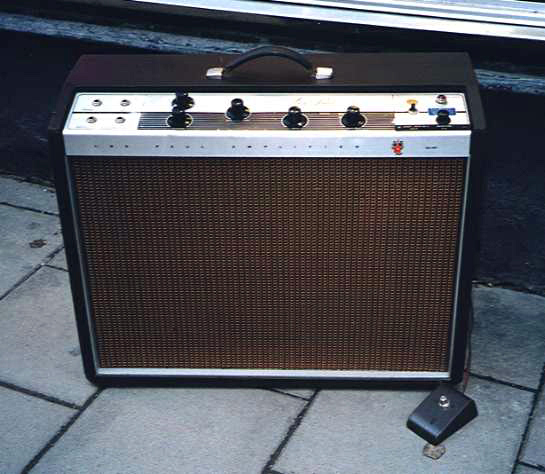 1967 Fender Vibro Champ, blackface, SOLD! Photo How much? 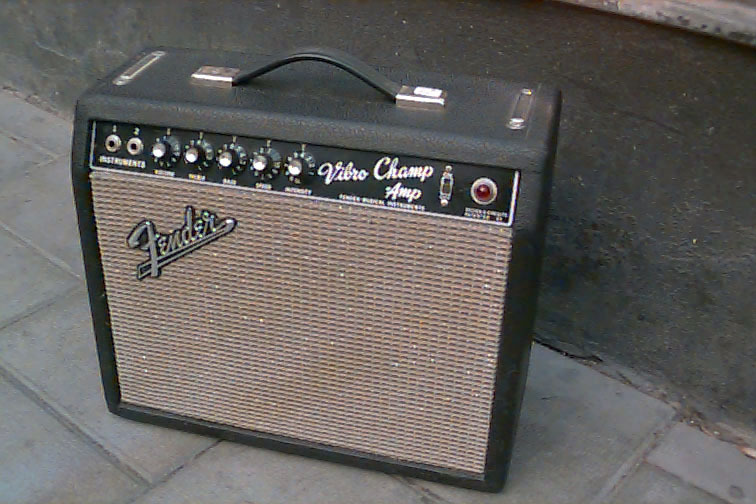 1966 Fender Vibro Champ Amp, blackface, SOLD! Photo How much? 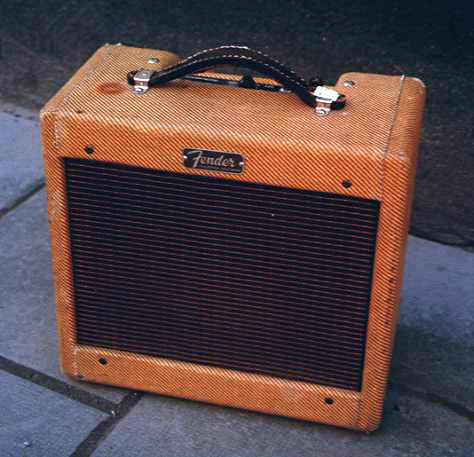 1959 Fender Vibrolux, tweed, SOLD! Photo How much? 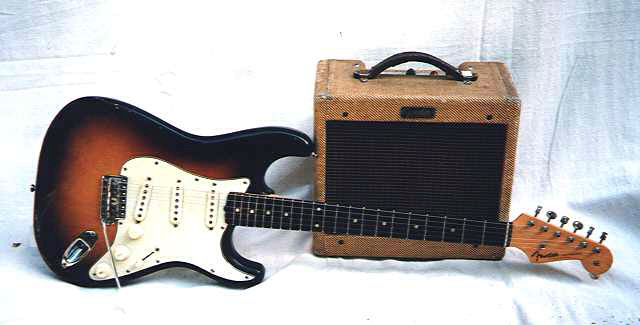 1961 Fender Vibrolux, tweed, SOLD! Photo How much? 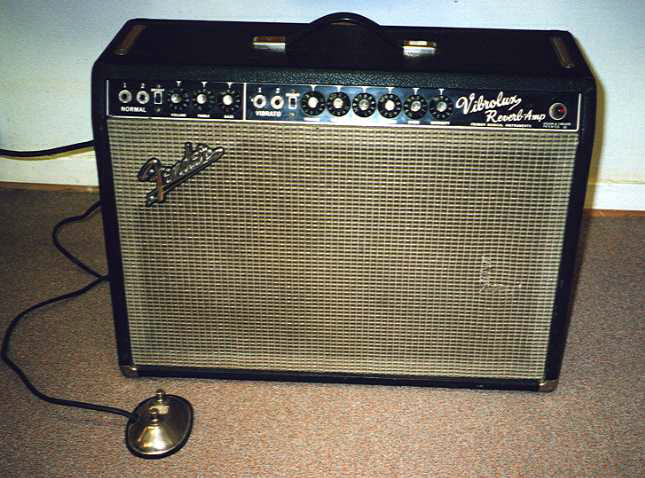 1966 Fender Vibrolux Reverb Amp, blackface, SOLD! Photo How much? 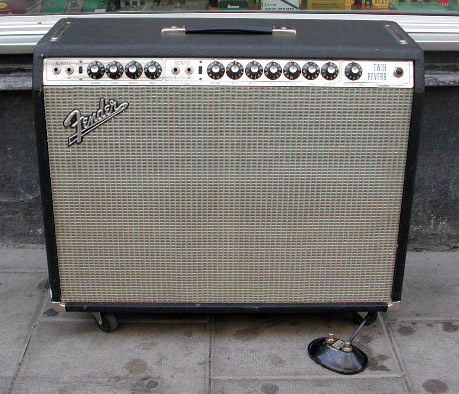 1973 Fender Vibrolux Reverb, chromeface, SOLD! Photo How much? Filen saknas! Hot Plate 8 ohm, SOLD! Photo How much? 1970s Georg Bolin Tonbord, SOLD! Photo How much? 1940 Gibson EH-185, SOLD! Photo How much? 2000s Gibson GA-15RV, brown, 14-16 watts, 1x12", reverb, SOLD! Photo How much? 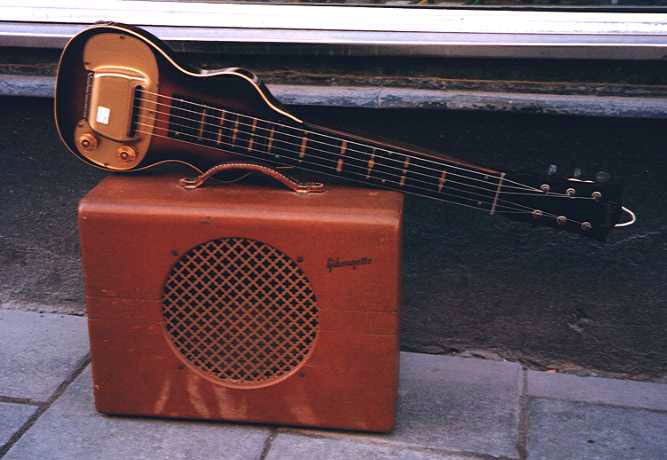 1962 Gibson GA-30RV Invader, tweed, 30 watts, 1x12" + 1x8" Jensen speakers, reverb, SOLD! Photo How much? 1962 Gibson GA-40T, SOLD! Photo How much? 1957 Gibson GA-5 Les Paul Junior, tan, SOLD! Photo How much? 1955 Gibson GA-50, SOLD! Photo How much? 1961 Gibson GA-77RV Vanguard, tweed, SOLD! Photo How much? 1953 Gibson Gibsonette, SOLD! Photo How much? 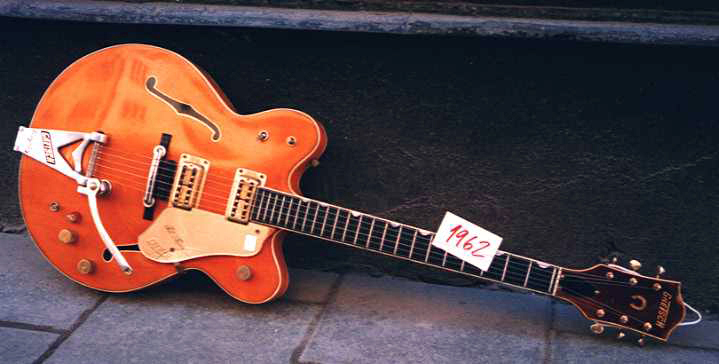 1950s Gretsch Artist, brown, SOLD! Photo How much? 1956 Gretsch Electromatic Artist (Model 6155), grey, SOLD! Photo How much? 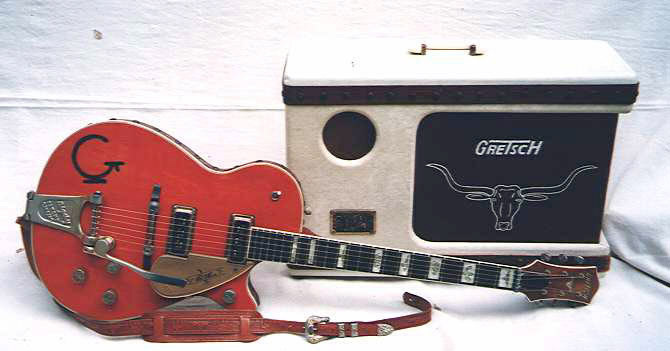 1956 Gretsch Electromatic Western Amp, tweed and white with steerhead grill, SOLD! Photo How much? 1965 Hagström Bass 210, top w/cabinet, SOLD! Photo How much? 1966 Hagström Bass 210, top w/cabinet, SOLD! Photo How much? 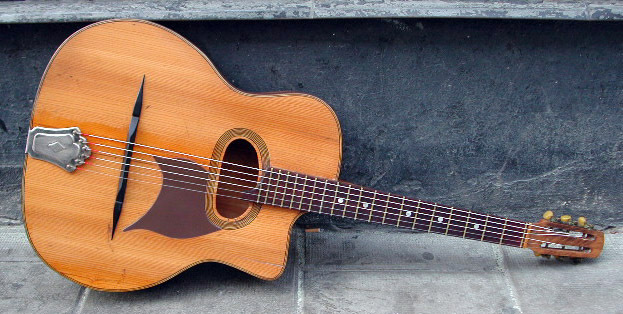 1975 Hagström BT-50, SOLD! Photo How much? 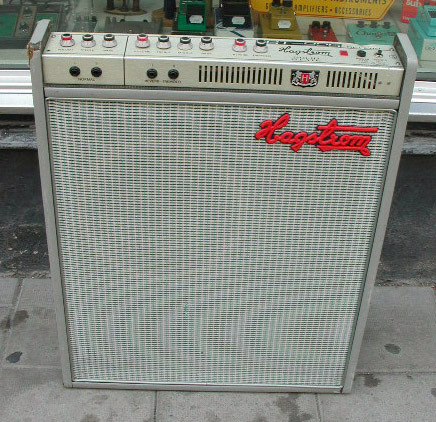 1966 Hagström GA-85 Reverb, SOLD! Photo How much? 1972 Hagström GT-225, SOLD! Photo How much? 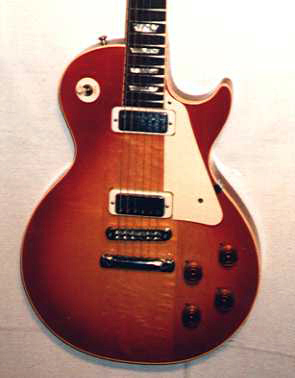 1972-1973 Hagström GT-225, SOLD! Photo How much? 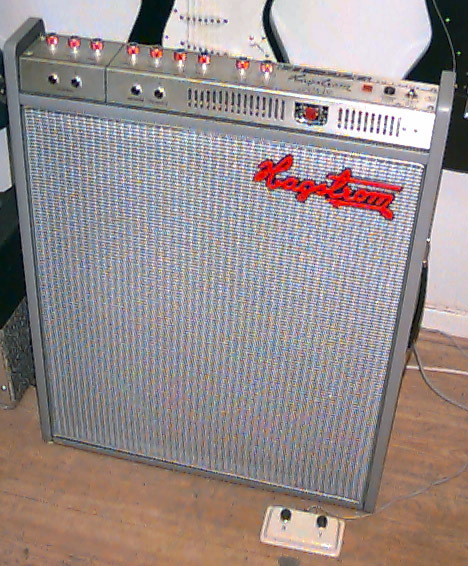 1969 Hagström GT-280 Reverb, SOLD! Photo How much? 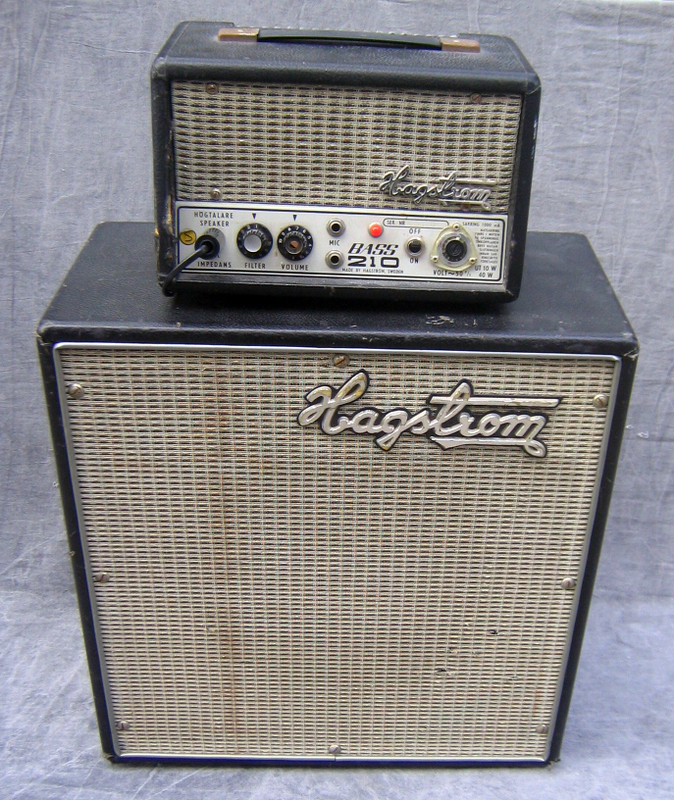 1965 Hagström Model 26, 6 watts, SOLD! Photo How much? 1961 Hagström Model 39, SOLD! Photo How much? 1962 Hagström Model 39, tweed, SOLD! Photo How much? 1965 Hagström Model 310, SOLD! Photo How much? 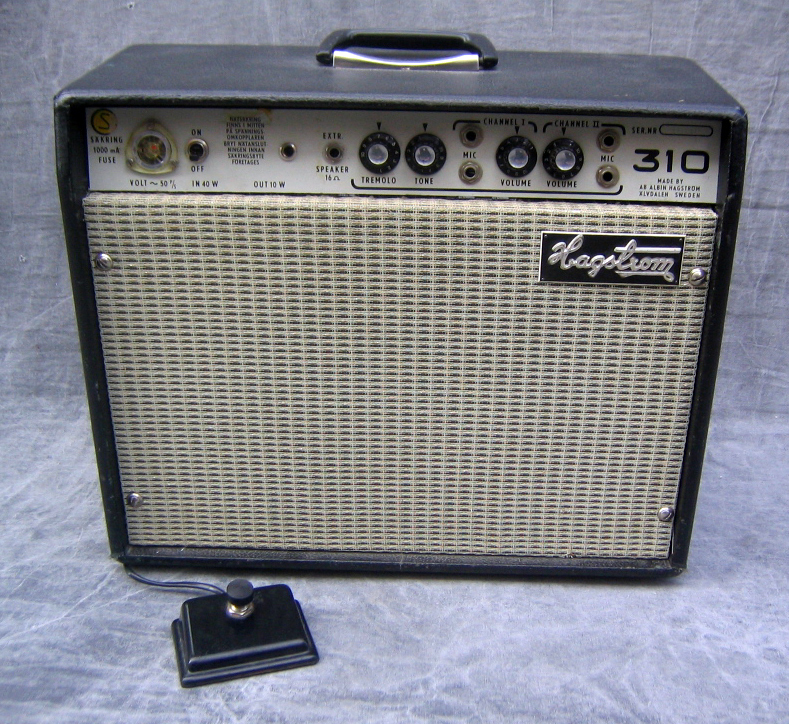 1966 Hagström Model 310, SOLD! Photo How much? 1960 Hagström Model 614, SOLD! Photo How much? 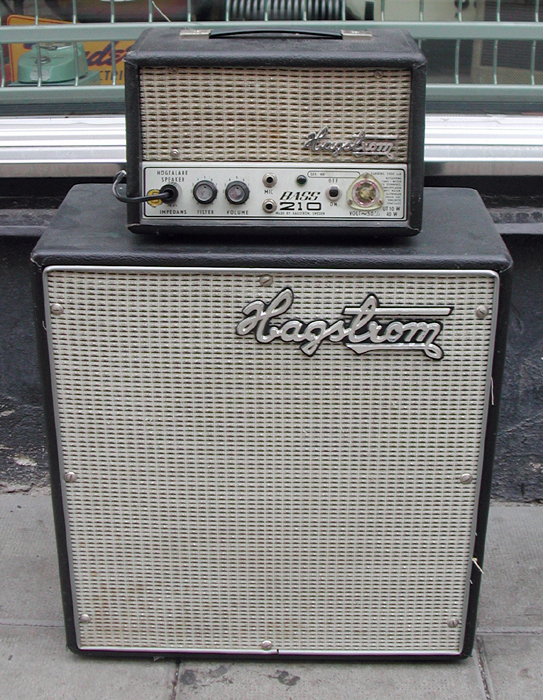 1975 Hagström PA-100, with two speaker cabinets, SOLD! Photo How much? 1980s Halkan's Model GRA-60dt - The Five Year Anniversary Model, SOLD! Photo How much? Hughes & Kettner Tubemeister 36, natural, SOLD! Photo How much? Ibanez TA35 35 Watt Acoustic Amp, SOLD! Photo How much? JJLabs Thunder Mark II, SOLD! Photo How much? KLD GT30-H Top, 30 watts, SOLD! Photo How much? Kemper Profiling Amplifier, SOLD! Photo How much? 2000s Kustom KGA10, SOLD! Photo How much? 2012 Laney LG35R, 10 watts, SOLD! Photo How much? Laney TF300, natural, SOLD! Photo How much? Line 6 Bass Pod XT Pro rack, SOLD! Photo How much? 1990s Line 6 Flextone 1x12, 60 watts, 1x12" speaker, SOLD! Photo How much? 2016 Line 6 Lowdown Studio 110, SOLD! Photo How much? Line 6 Spider IV 75, black, SOLD! Photo How much? 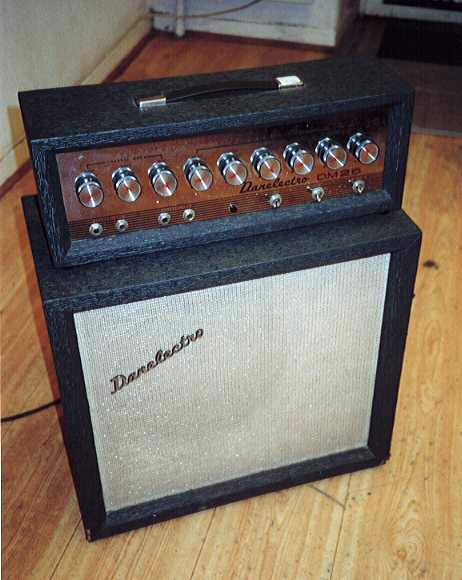 1959 Magnatone Custom 260 High Fidelity, 2x12", SOLD! Photo How much? Marshall 6101LM 30th Anniversary Combo, 1x12", SOLD! Photo How much? 2010 Marshall AS50D, 50 watts, SOLD! Photo How much? Marshall MG412A, black, SOLD! Photo How much? 2005 Marshall MG50DFX, 50 watts, 1x12" speaker, with built-in effects, SOLD! Photo How much? Marshall Studio 15, 15 watts, SOLD! Photo How much? Marshall Valvestate S80, black, SOLD! Photo How much? 1989 Mesa-Boogie MKIII, walnut, SOLD! Photo How much? 1978 Music Man 210 Sixty-Five, SOLD! Photo How much? 1976 Music Man 410 Sixty-five, SOLD! Photo How much? 1976 Music Man 410-HD, SOLD! Photo How much? 1978 Music Man 410-HD, SOLD! Photo How much? 1979 Music Man 410-HD One thirty, SOLD! Photo How much? 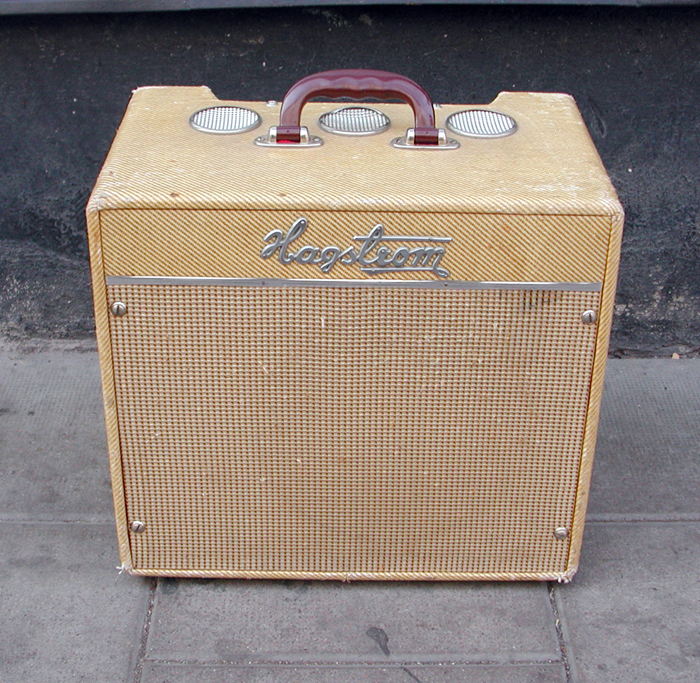 1960 National Stagestar Amp, SOLD! Photo How much? Orange CS50 Custom Shop 50, black, SOLD! Photo How much? 1979 Orange OR112m Overdrive Series Two, SOLD! Photo How much? Orange PPC212 Lead Guitar Cabinet, 2x12", 120 watts, SOLD! Photo How much? Orange PPC412, 4x12", SOLD! Photo How much? Orange PPC412HP8, 4x12", SOLD! Photo How much? Orange TH100, 100 watts, SOLD! Photo How much? Orange Thunderverb 200, natural, SOLD! Photo How much? Orange Tiny Terror, combo, SOLD! Photo How much? PRS Dallas Combo, 50 watts, SOLD! Photo How much? Peavey Bandit 112 Transtube, 1x12", SOLD! Photo How much? 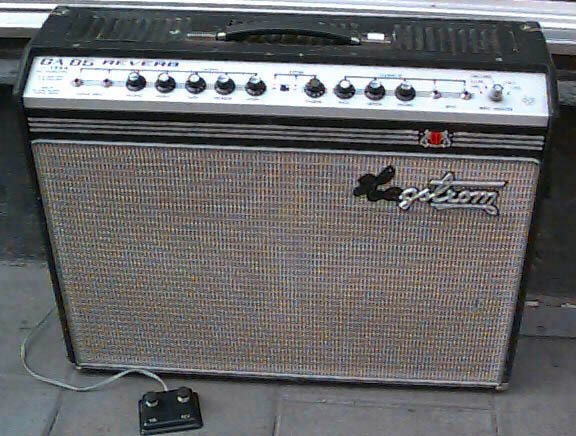 2007 Peavey Classic 30, 30 watts, SOLD! Photo How much? Peavey Max 158 Bass, black, SOLD! Photo How much? Peavey Micro Bass Amp, SOLD! Photo How much? Peavey Packstage Plus, 35 watts, SOLD! Photo How much? Peavey Rage 158, SOLD! Photo How much? Peavey Rage 158, 15 watts, SOLD! Photo How much? Peavey Valveking vk112, sunburst, SOLD! Photo How much? 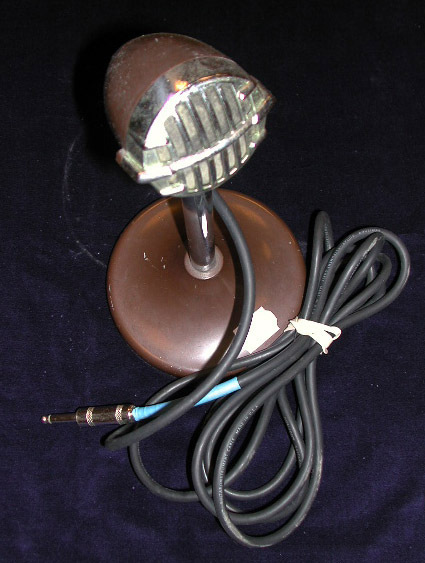 1950s Philips Typ 2808, SOLD! Photo How much? 1964 Premier Model 71, SOLD! Photo How much? 1957 Premier 120, SOLD! Photo How much? 1961 Rickenbacker Model M-8E, SOLD! Photo How much? 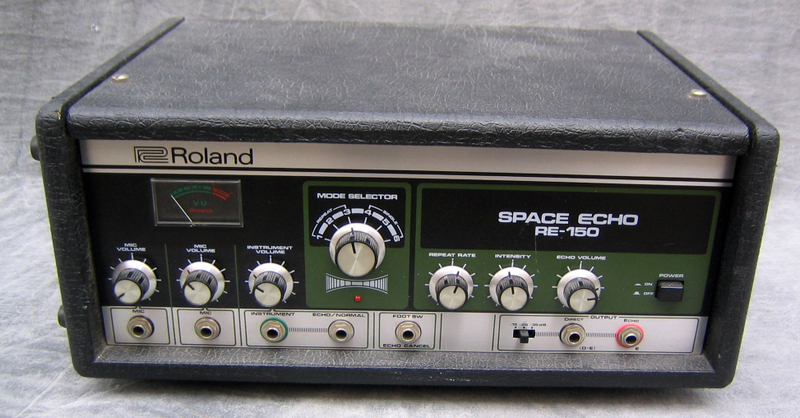 1988 Roland DAC-15XD, 15 watts, SOLD! Photo How much? 1989 Roland DAC-15XD, natural, SOLD! Photo How much? 2014 Roland Micro Cube, Olympic White, SOLD! Photo How much? 1980s Roland Spirit Bass 50, 1x15", SOLD! Photo How much? SX GA10, sunburst, SOLD! Photo How much? 1964 Sears Silvertone Model 1482, 1x12" speaker, SOLD! Photo How much? TC Electronic BG250-115 MKII, 250 watts, SOLD! Photo How much? 1995 THD 2x10", SOLD! Photo How much? 2002 Top Hat Club Royale, 1x12", SOLD! Photo How much? 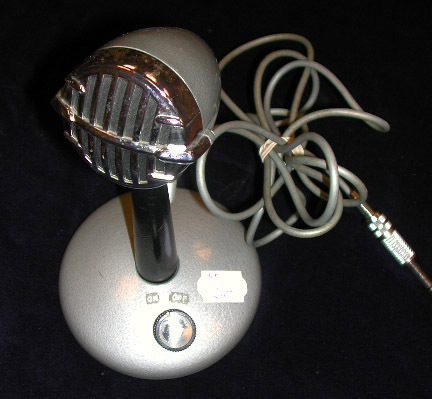 Trace Elliott Series 6 Model 715, 100 watts, SOLD! Photo How much? 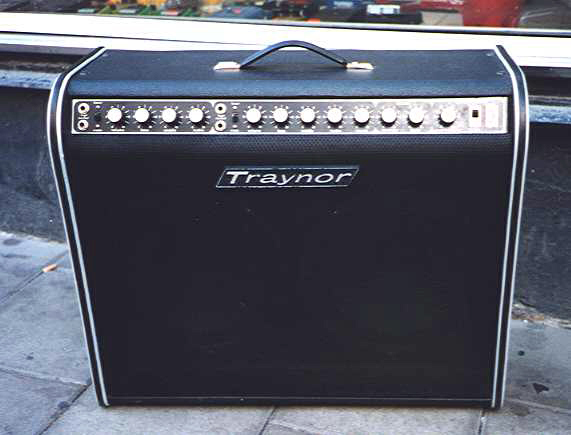 1986 Traynor TS-25, 25 watts, SOLD! Photo How much? 1977 Traynor YGL-3, SOLD! Photo How much? 1979 Traynor YGL-3 Mark Three, SOLD! Photo How much? 1965 Vox AC10 Twin, 2x10" speakers, SOLD! Photo How much? 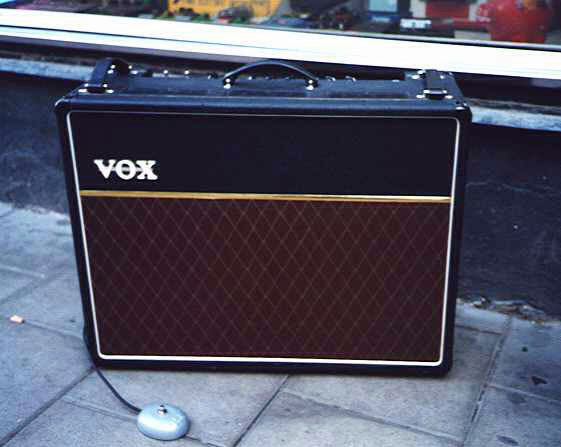 Vox AC100CPH, SOLD! Photo How much? 1960s Vox AC30 Top Boost, SOLD! Photo How much? 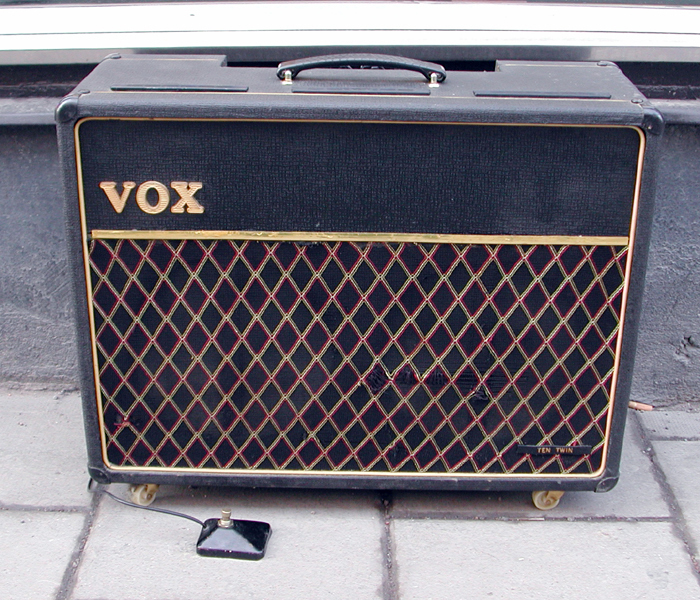 1960s Vox AC30 Top Boost, black, SOLD! Photo How much? 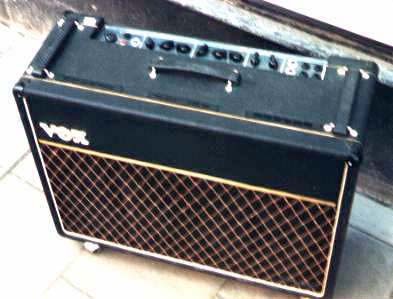 1993 Vox AC30/6 TB, SOLD! Photo How much? Vox AC30CC2X, black, SOLD! Photo How much? 2017 Vox AC4C1, sunburst, SOLD! Photo How much? Vox AC4HW1, white, SOLD! Photo How much? 2007 Vox AD30VT-XL, 30 watts, SOLD! Photo How much? Vox Mini DA5, red, SOLD! Photo How much? Vox V412BN, 4x12", SOLD! Photo How much? Vox Valvetronic AD50VT, white, SOLD! Photo How much? 1988 Yamaha HY10G III, 10 watts, SOLD! Photo How much? 1982 Yamaha JX35, 40 watts, SOLD! Photo How much? 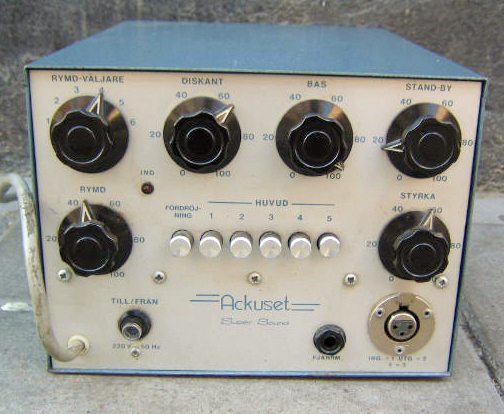 1960s Ackuset Super Sound Eko, tape echo, SOLD! Photo How much? 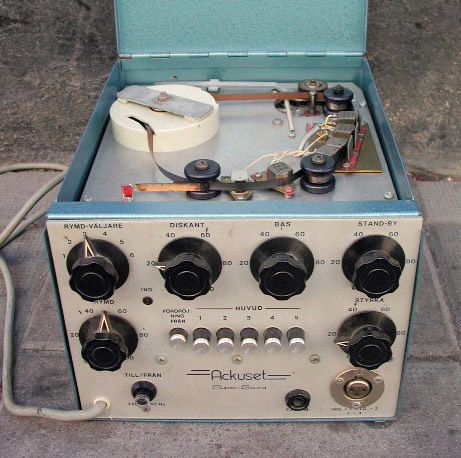 1970s Ackuset Super-Sound, tape echo, SOLD! Photo How much? 1980s Akai EX90R Digital Reverb, SOLD! Photo How much? Akai XR20 Beat Production Center, SOLD! Photo How much? Aria EQ-500 Graphic Equalizer, sunburst, SOLD! Photo How much? 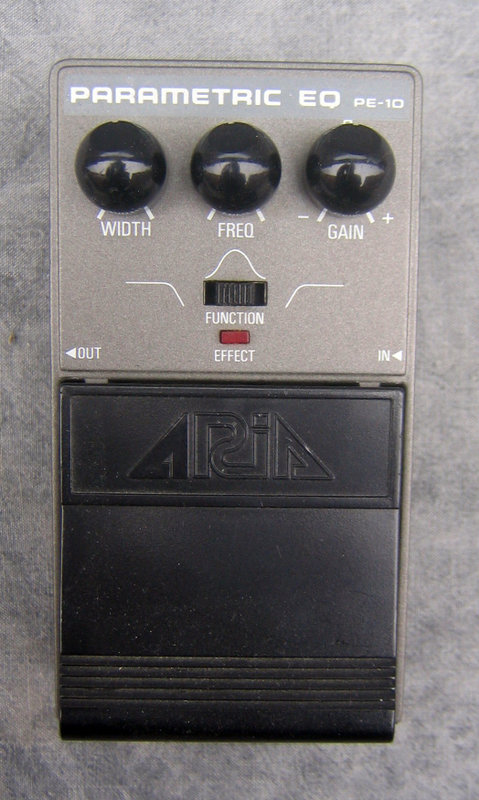 1980s Aria PE-10 Parametric EQ, SOLD! Photo How much? 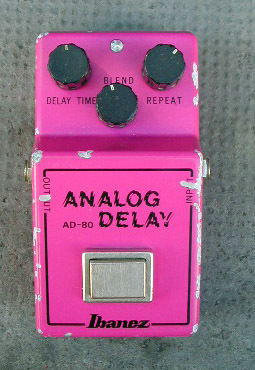 Artec Analog Delay SE-ADL, SOLD! Photo How much? Artec SE-SWB A/B Box, SOLD! Photo How much? 1930 Astatic Model A, aluminum, SOLD! Photo How much? 1941 Astatic Model A, harp mike, SOLD! Photo How much? 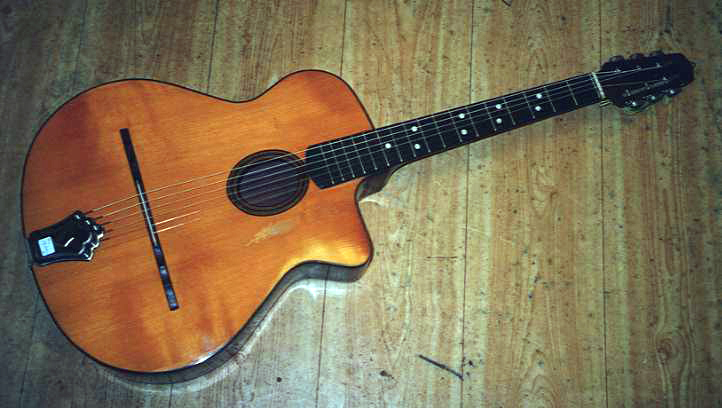 1942 Astatic JT-30, harp mike, SOLD! Photo How much? 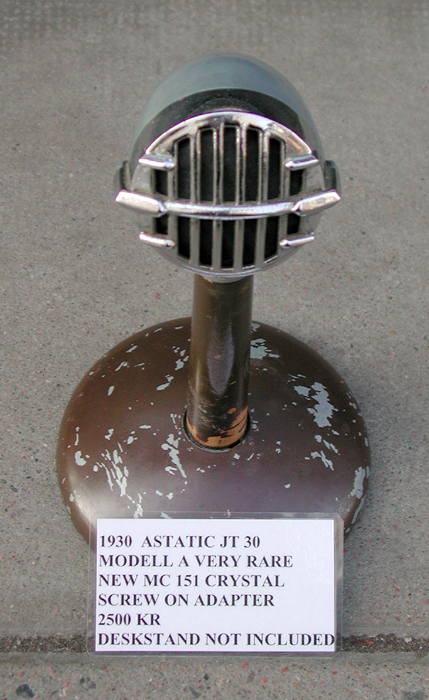 1943 Astatic JT-30, brown, SOLD! Photo How much? 1950s Astatic JT-30, harp mike, SOLD! Photo How much? 1952 Astatic JT-30 harp mike, SOLD! Photo How much? 1956 Astatic JT-30, harp mike, SOLD! Photo How much? 1967 Astatic JT-30, harp mike, SOLD! Photo How much? 1967 Astatic JT-30, harp mike with stand, SOLD! Photo How much? 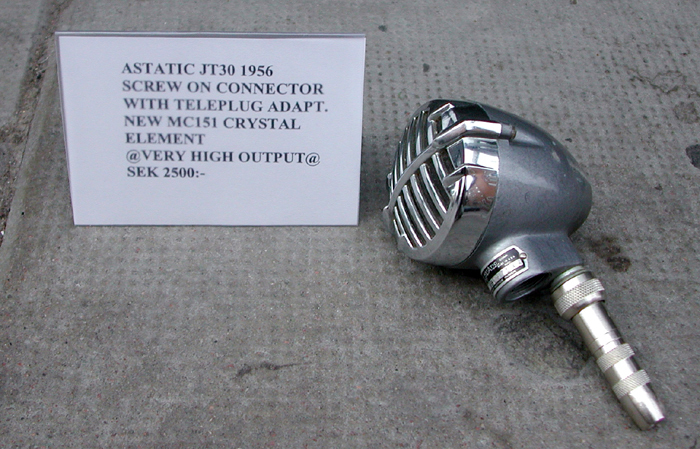 1970 Astatic JT-30, grey, SOLD! Photo How much? 1970s Astatic JT-30, grey, SOLD! Photo How much? BOSS BD-2 Blues Driver, Candy Apple Red, SOLD! Photo How much? 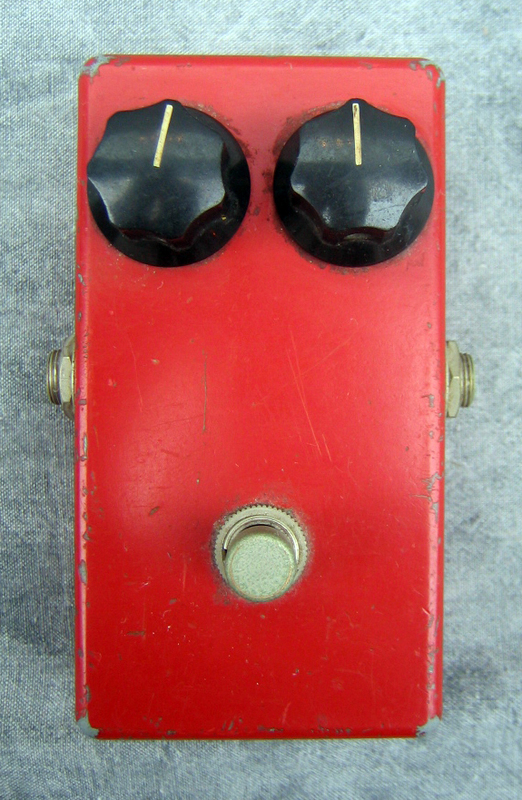 1981 BOSS BF-2 Flanger, Candy Apple Red, SOLD! Photo How much? BOSS Bass OverDrive ODB-3, 50 watts, SOLD! Photo How much? BOSS CEB-3 Bass Chorus, SOLD! Photo How much? 1978 BOSS CS-1 Compression Sustainer, made in Japan, SOLD! Photo How much? BOSS Chromatic Tuner TU-3, SOLD! Photo How much? BOSS Distortion DS-1, black, SOLD! Photo How much? BOSS GE-7 Graphic Equalizer, SOLD! Photo How much? 2010 BOSS ME-25, multi effect, SOLD! Photo How much? BOSS ML-2 Metal Core, natural, SOLD! Photo How much? BOSS MT-2 Metal Zone, SOLD! Photo How much? 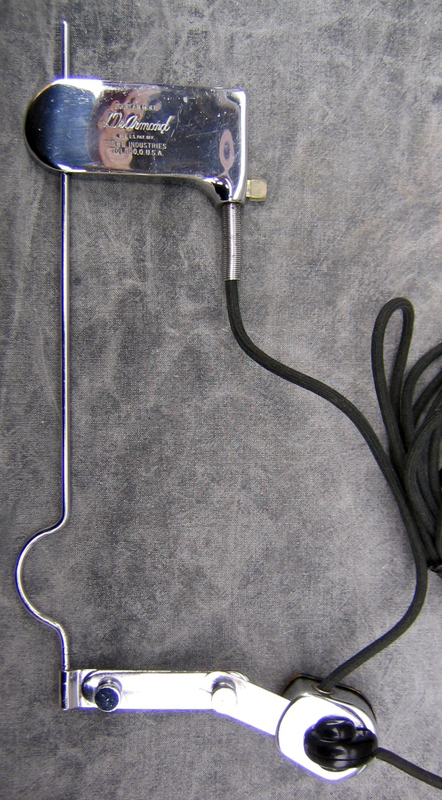 BOSS NS-2 Noice Suppressor, SOLD! Photo How much? 1996 BOSS Noise Suppressor NS-2, sunburst, SOLD! Photo How much? 1984 BOSS OD-1 OVerdrive, SOLD! Photo How much? BOSS ODB-3 Bass Overdrive, natural, SOLD! Photo How much? 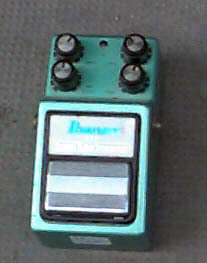 1982 BOSS Phaser PH-1R, SOLD! Photo How much? BOSS SD-1 Super Overdrive, SOLD! Photo How much? BOSS SYB-5 Bass Synthesizer, SOLD! Photo How much? Behringer DM100 Distortion Modeler, SOLD! Photo How much? Belcat PHS-505 Phaser, Butterscotch Blonde, SOLD! Photo How much? Blackstar HT Drive, SOLD! Photo How much? 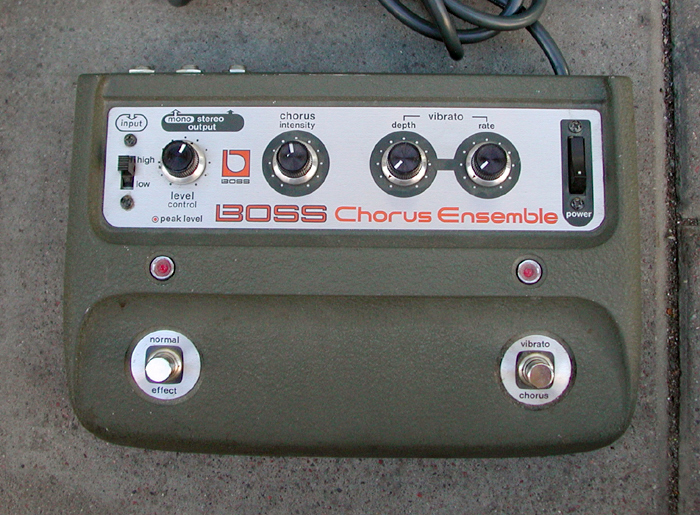 1970s Boss CE-1 Chorus Ensamble, SOLD! Photo How much? 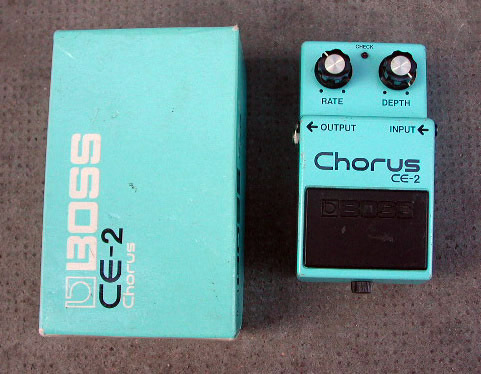 1980s Boss CE-2 Chorus, SOLD! Photo How much? 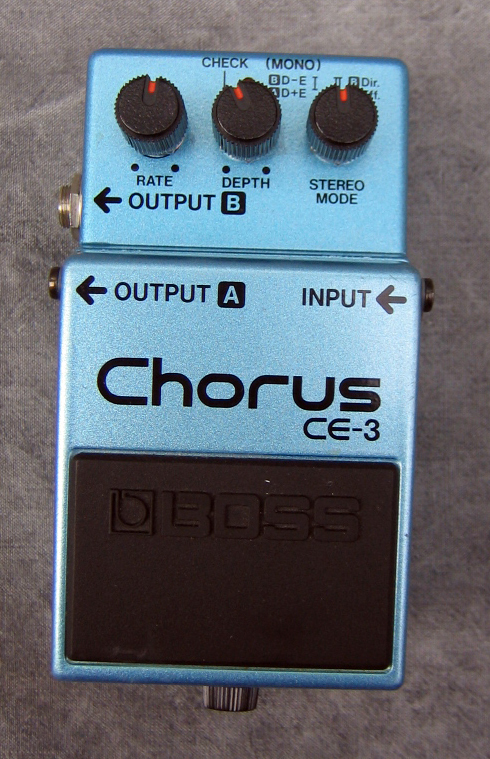 1990s Boss CE-3 Chorus, with original box, SOLD! Photo How much? 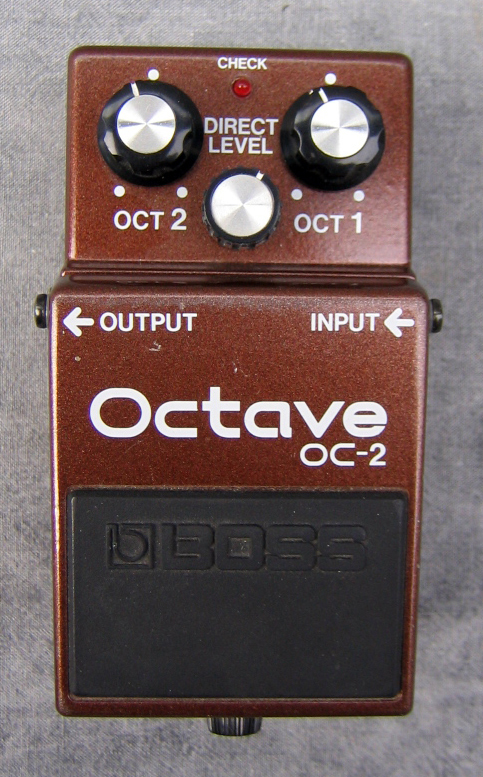 1990s Boss OC-2 Octave, with original box, SOLD! Photo How much? Catalinbread Teaser Stallion, SOLD! Photo How much? Chandler Tube Driver Rack, natural, SOLD! Photo How much? 1970s Colorsound Overdriver, fuzz, SOLD! Photo How much? 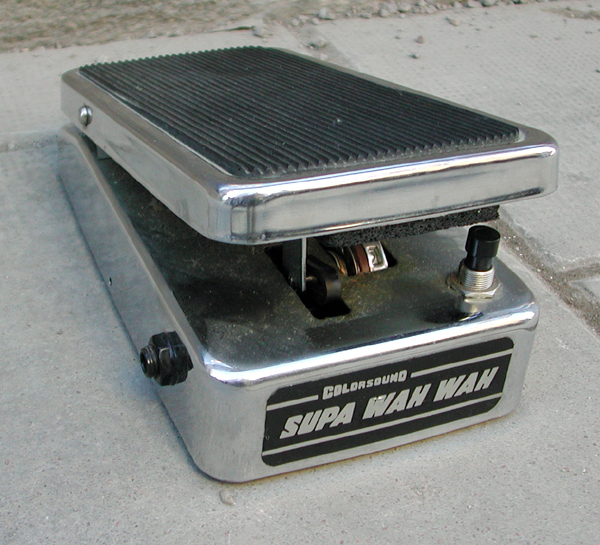 1977 Colorsound Supa Wah Wah, SOLD! Photo How much? 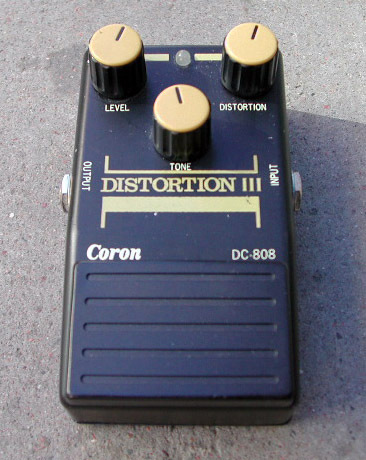 1980s Coron DC-808 Distortion III, SOLD! Photo How much? DOD Gubslinger, SOLD! Photo How much? 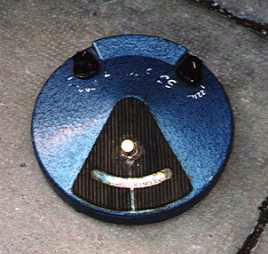 1970s Dallas-Arbiter Fuzz Faze, blue, SOLD! Photo How much? Darkglass Alpha Omega, bass distortion, SOLD! Photo How much? Darkglass Symmetry, bass compressor, SOLD! Photo How much? Darkglass Vintage Deluxe, SOLD! Photo How much? Darkglass Vintage Microtubes, black, SOLD! Photo How much? Darkglass Electronics Alpha Omicron Distortion, natural, SOLD! Photo How much? 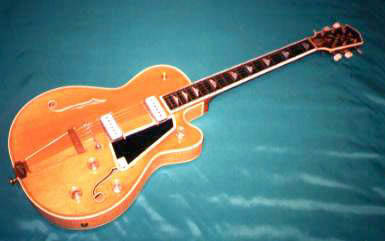 1960 DeArmond FHC-C, archtop floating pickup, SOLD! Photo How much? 1956 DeArmond Guitar Mike, archtop floating pickup, SOLD! Photo How much? 1964 DeArmond RHC-B, sound-hole guitar-pickup, SOLD! Photo How much? DigiTech Bass Overdrive Distortion XBD, SOLD! Photo How much? DigiTech FS3X Footswitch, silver, SOLD! Photo How much? DigiTech Trio+ Band Creator Looper, SOLD! Photo How much? DigiTech XBD Bass Driver Overdrive, natural, SOLD! Photo How much? 2000s Digitech Vocalist Live 2, SOLD! Photo How much? 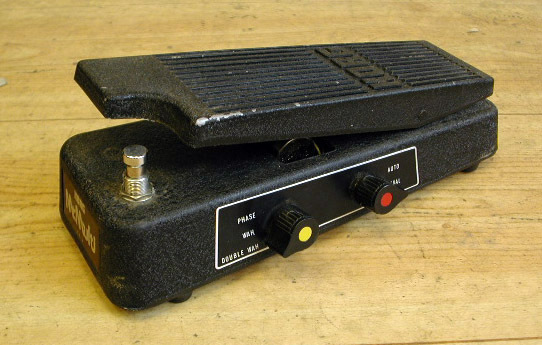 Dunlop Jimi Hendrix Model JH-1 Wah Wah, SOLD! Photo How much? 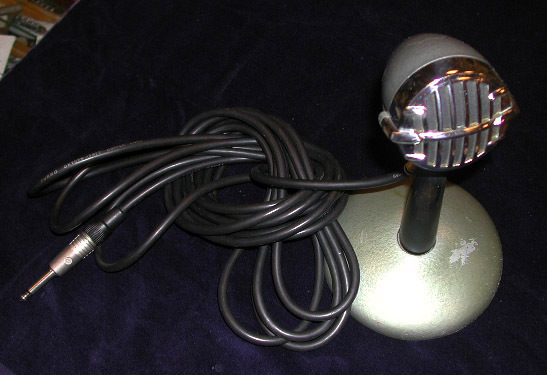 1960s Dynacord Echocord Super Model 5-62, SOLD! Photo How much? EBS Billy Sheehan Signature Drive, SOLD! Photo How much? EMG 89 HSS set, SOLD! Photo How much? 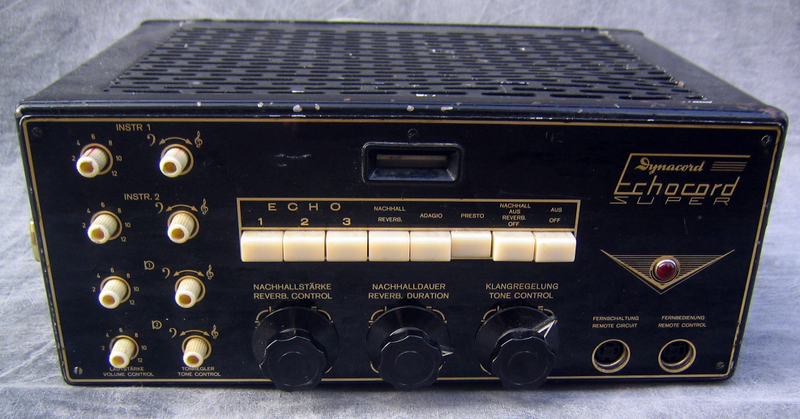 1960 Ecco-Fonic, tape echo, SOLD! Photo How much? Electro-Harmonix 16 Second Delay Looper, SOLD! Photo How much? Electro-Harmonix Bad Stone, blackface, SOLD! Photo How much? Electro-Harmonix Big Muff Nano Pi, SOLD! Photo How much? 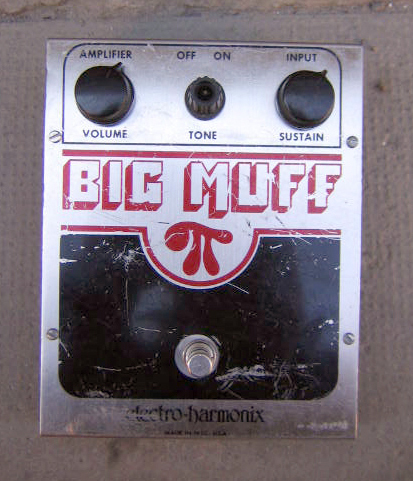 1977 Electro-Harmonix Big Muff Pi, SOLD! Photo How much? Electro-Harmonix Canyon Delay & Looper, sunburst, SOLD! Photo How much? 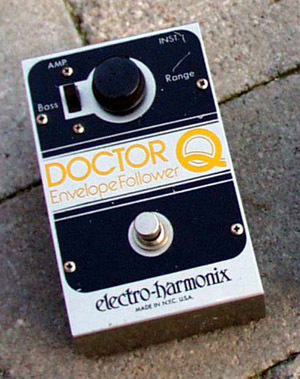 1976 Electro-Harmonix Doctor Q, SOLD! Photo How much? Electro-Harmonix Double Muff, SOLD! Photo How much? Electro-Harmonix EHXTortion JFET Overdrive xtortion, SOLD! Photo How much? Electro-Harmonix East River Drive, SOLD! Photo How much? Electro-Harmonix Electric Mistress, SOLD! Photo How much? 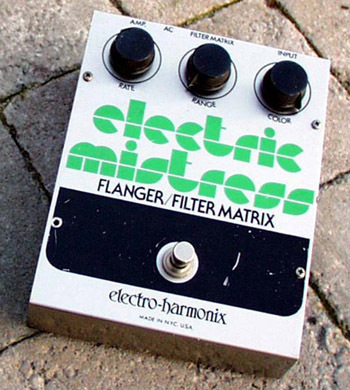 1970s Electro-Harmonix Electric Mistress, SOLD! Photo How much? 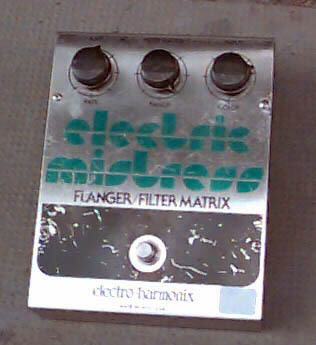 1978 Electro-Harmonix Electric Mistress, SOLD! Photo How much? Electro-Harmonix Holy Grail Reverb, SOLD! Photo How much? 2015 Electro-Harmonix Metal Muff with Top Boost, SOLD! Photo How much? Electro-Harmonix Platform Stereo, SOLD! Photo How much? 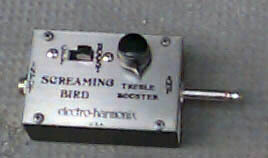 1972 Electro-Harmonix Screaming Bird, SOLD! Photo How much? 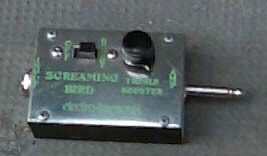 1974 Electro-Harmonix Screaming Bird, SOLD! Photo How much? Electro-Harmonix Silencer, sunburst, SOLD! Photo How much? 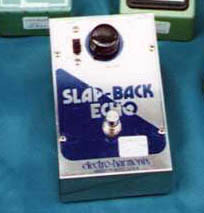 1978 Electro-Harmonix Slap Back Echo, SOLD! Photo How much? Electro-Harmonix Superego+ Synth Engine/Multi Effect, Olympic White, SOLD! Photo How much? Electro-Harmonix Switchblade Plus, sunburst, SOLD! Photo How much? 1980 Evans EC-250 Echopet, SOLD! Photo How much? Eventide H9 Max, Antique Natural, SOLD! Photo How much? 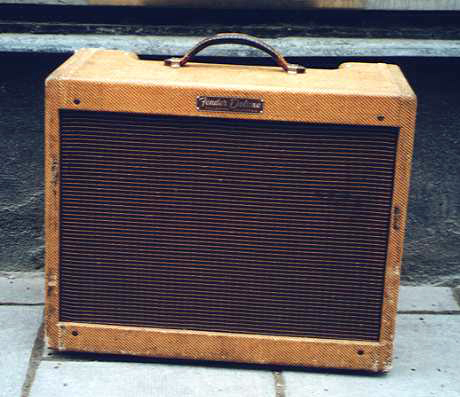 Fender '63 Tube Reverb, brown, SOLD! Photo How much? 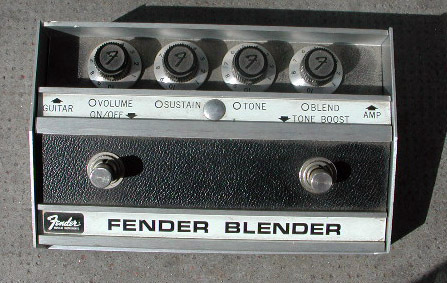 1974 Fender Blender, fuzz, SOLD! Photo How much? 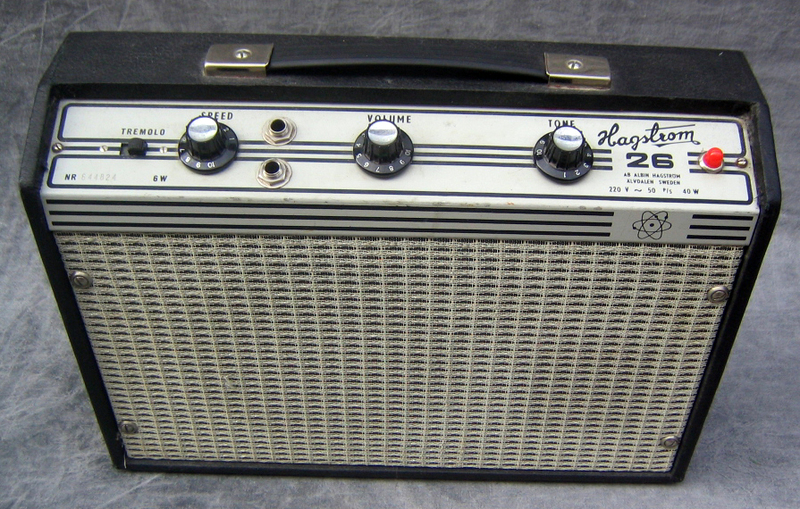 1960s Fender Fuzz-Wah, fuzz, wah and sideways volume, SOLD! Photo How much? 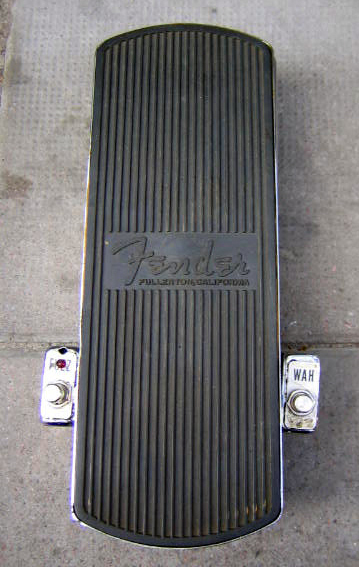 1990s Fender Reverb, black toolex, SOLD! Photo How much? 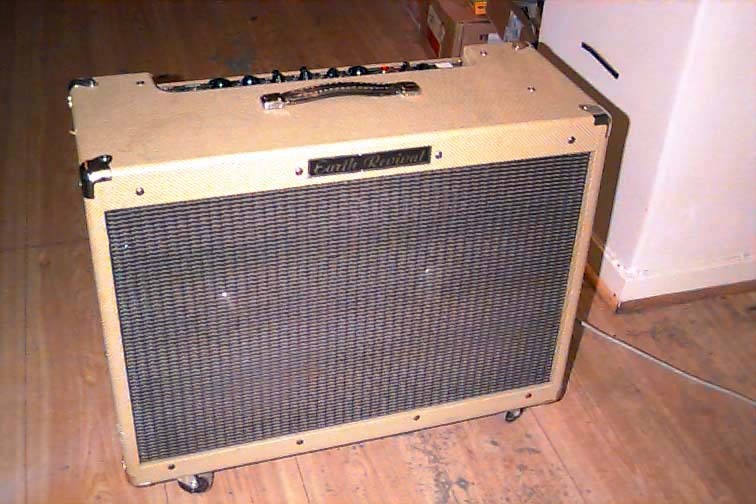 1990s Fender Reverb, brown toolex, SOLD! Photo How much? 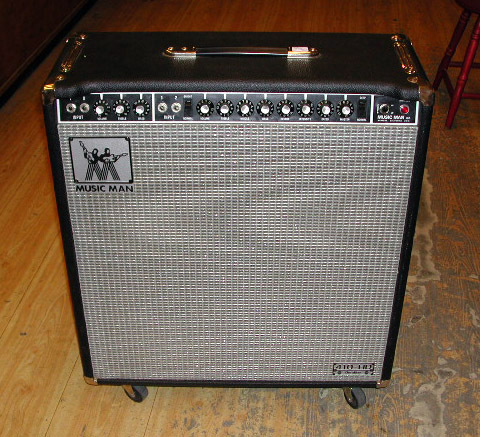 1994 Fender Reverb, black toolex, SOLD! Photo How much? 1996 Fender Reverb, tweed, SOLD! Photo How much? 1960s Fender Fuzz-Wah, SOLD! Photo How much? Friedman Be OD, overdrive, SOLD! Photo How much? 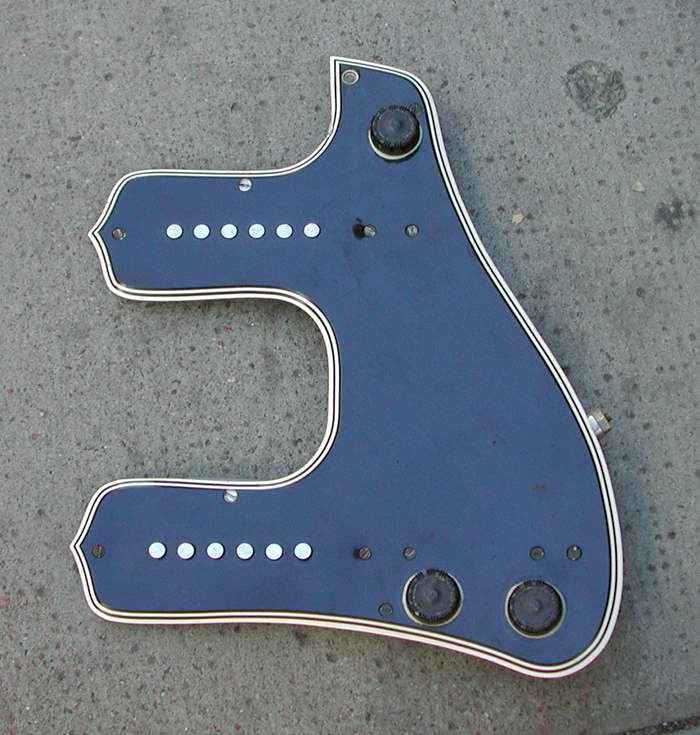 1950s Gibson McCarty pickguard assembly, SOLD! Photo How much? 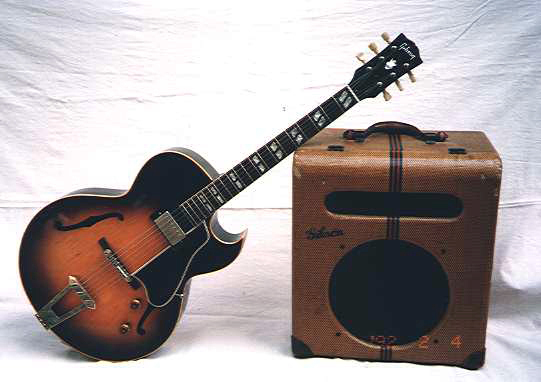 1959-1960 Gibson P.A.F. pickup, SOLD! Photo How much? 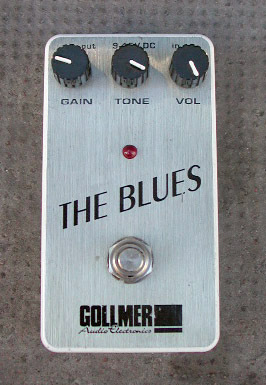 1990s Gollmer The Blues, distortion, SOLD! Photo How much? 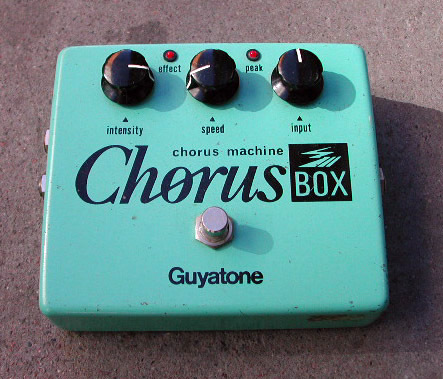 1970s Guyatone Chorus Machine, SOLD! Photo How much? 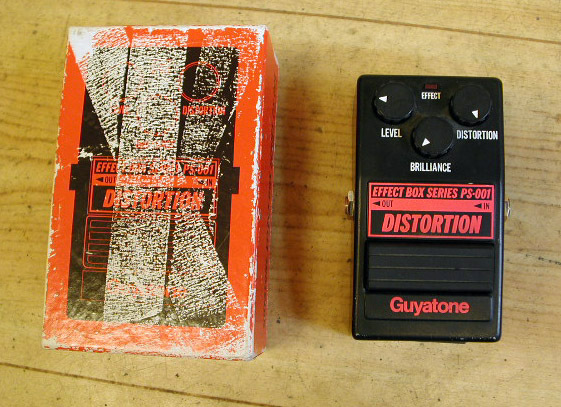 1980s Guyatone PS-001 Distorion, SOLD! Photo How much? 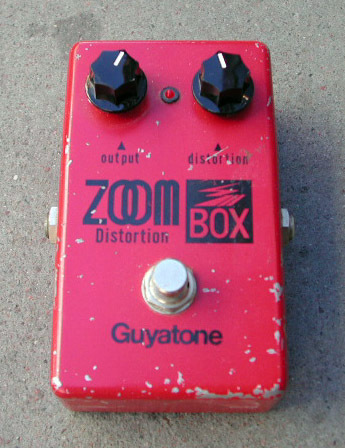 1980s Guyatone PS-102 Zoom Distortion, SOLD! Photo How much? 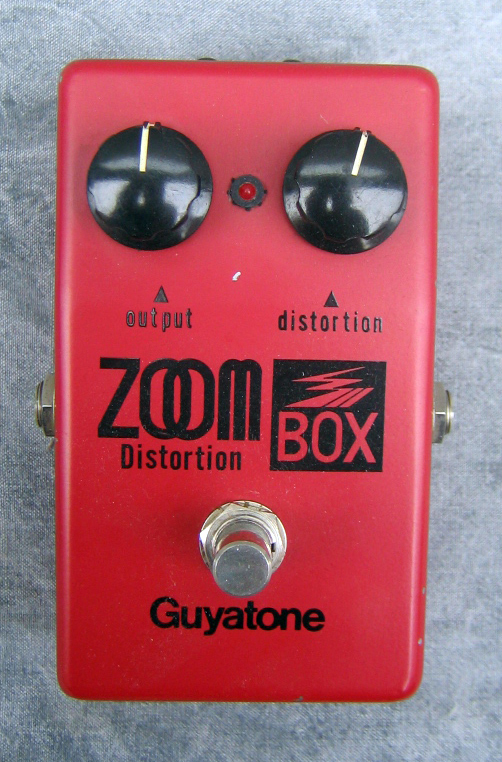 1970s Guyatone PS-102 Zoom Distortion, SOLD! Photo How much? 1960s Hagström Kent Eko Unit, SOLD! Photo How much? 1975 Hagström Super-Dynamic Echo, SOLD! Photo How much? 1960 Hagstrom Wind Organ, SOLD! Photo How much? 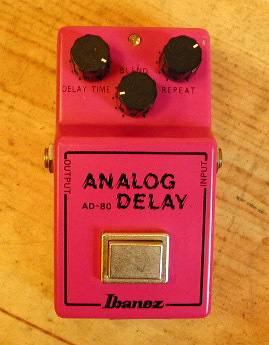 1981 Ibanez AD-80 Analog Delay, SOLD! Photo How much? 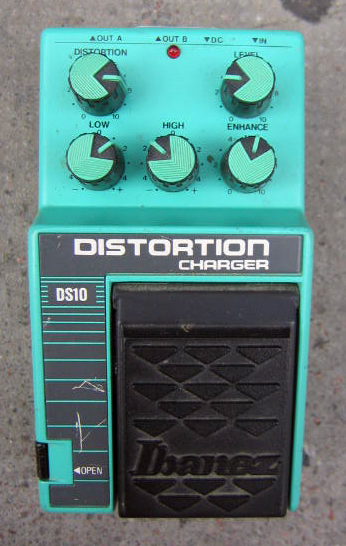 1980s Ibanez DS10 Distortion Charger, SOLD! Photo How much? 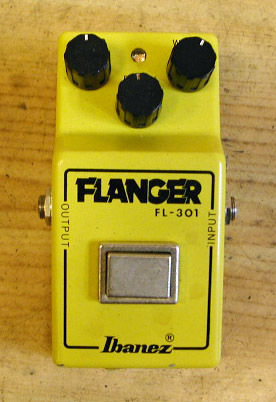 1979 Ibanez FL-301 Flanger, SOLD! Photo How much? 1984 Ibanez GE 9 Graphic Eq, natural, SOLD! Photo How much? 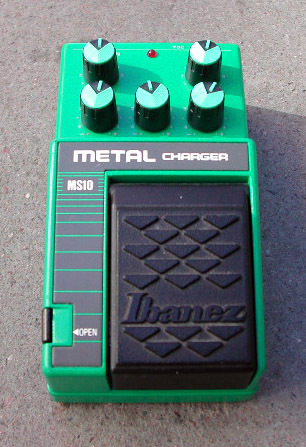 1980s Ibanez MS10 Metal Charger, SOLD! Photo How much? 1981 Ibanez OD-855 Overdrive II, SOLD! Photo How much? 1983 Ibanez ST9 Super Tube Screamer, SOLD! Photo How much? 1984 Ibanez ST9 Super Tube Screamer, SOLD! Photo How much? 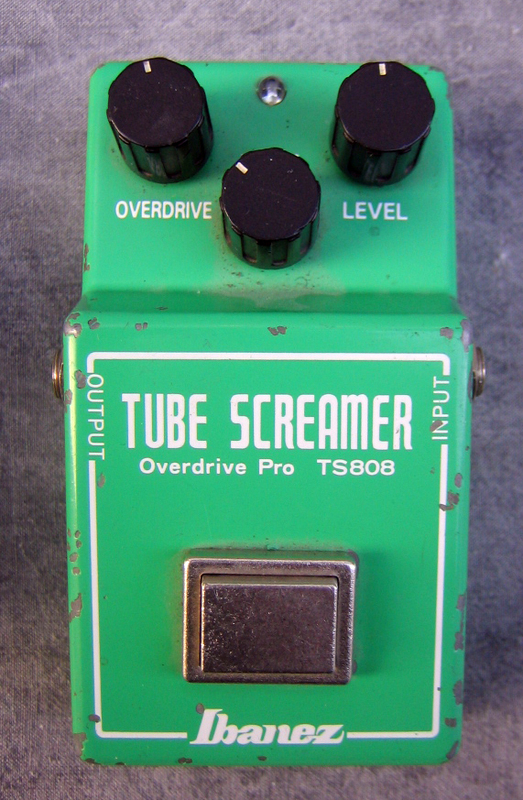 1981 Ibanez TS808 Tube Screamer Overdrive Pro, SOLD! Photo How much? 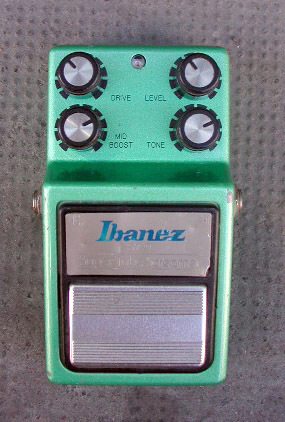 1981 Ibanez TS808 Tube Screamer, SOLD! Photo How much? 1982 Ibanez Tubescreamer TS9, SOLD! Photo How much? Isp Decimator II Noise Reduction, refin black, SOLD! Photo How much? 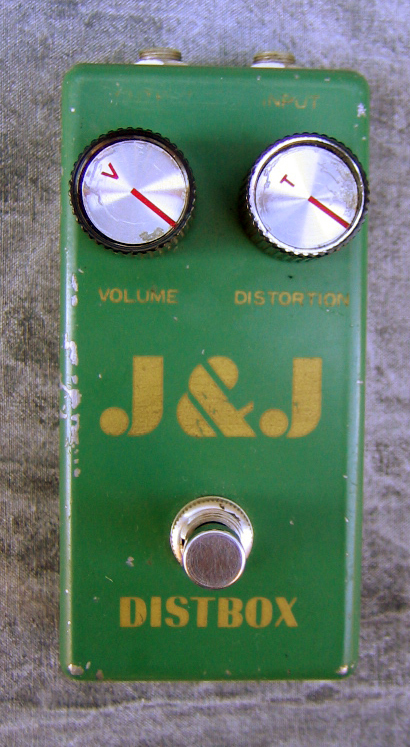 1980s J&J Distbox, distortion, SOLD! Photo How much? 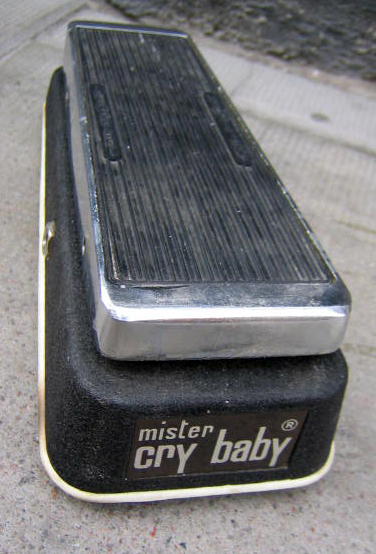 1970s JEN Mister Cry Baby Model 310.038, SOLD! Photo How much? JHS Alpine, reverb, SOLD! Photo How much? 2008 JOYO JF-08 Digital Delay, SOLD! Photo How much? JOYO JF-34 US Dream Distortion, SOLD! Photo How much? Jackson Audio Prism Booster, SOLD! Photo How much? 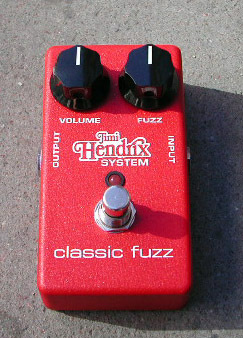 2001 Jim Dunlop JH-2S Classic Fuzz, SOLD! Photo How much? Keeley Compressor KC-2 Limiting Amplifier, natural, SOLD! Photo How much? Keeley Compressor KC-2 Limiting Amplifier, SOLD! Photo How much? Korg DT-10, SOLD! Photo How much? 1970s Korg Mr. Multi, Wah/Phaser, SOLD! Photo How much? Korg Pitch Black, SOLD! Photo How much? Laney Lionheart IRT-Pulse, tube preamp, SOLD! Photo How much? Line 6 FB4, footswitch, SOLD! Photo How much? Line 6 POD HD 500, sunburst, SOLD! Photo How much? Line 6 Pod V 2, brown, SOLD! Photo How much? Lovepedal Hermida Zendrive, SOLD! Photo How much? MXR '74 Vintage Reissue Phase 90, natural, SOLD! Photo How much? MXR CS Shin Juku Drive, black, SOLD! Photo How much? MXR Custom Shop Il Torino Overdrive, natural, SOLD! Photo How much? 2017 MXR M108 10-band EQ, SOLD! Photo How much? 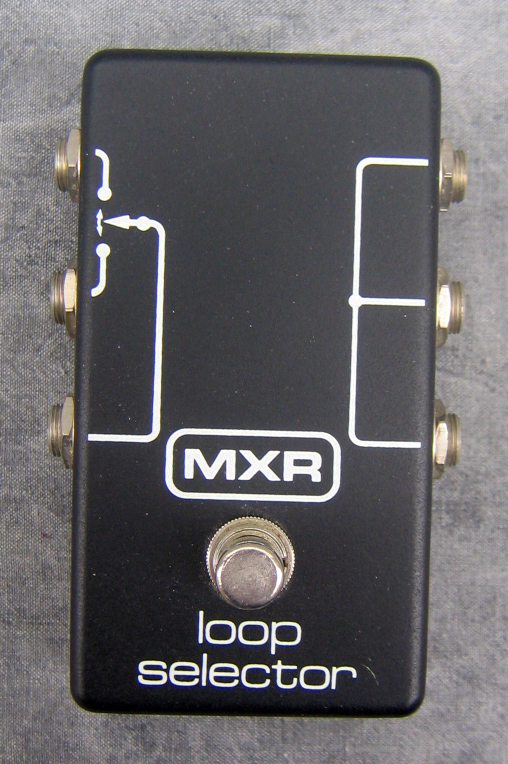 1977 MXR Phase 100, block logo, SOLD! Photo How much? 1980 MXR Phase 90, Made in Japan, black, SOLD! Photo How much? Mad Professor Ruby Red Booster, sunburst, SOLD! Photo How much? 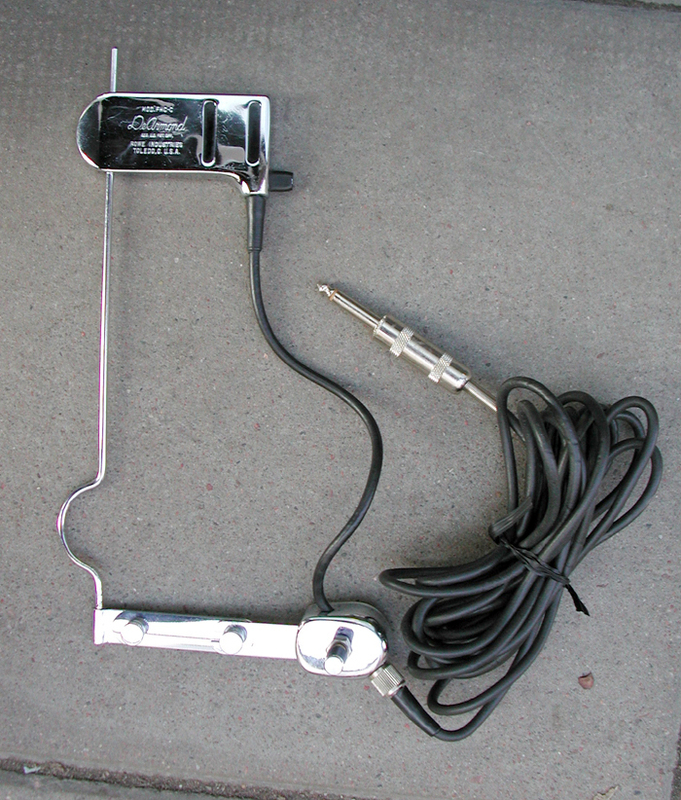 Marshall Foot switch, 1-way, SOLD! Photo How much? Marshall Regenerator, SOLD! Photo How much? 1960s Marshall Supa-Wah, wah-wah, SOLD! Photo How much? Maxon CS-9 PRO Stereo Chorus, natural, SOLD! Photo How much? 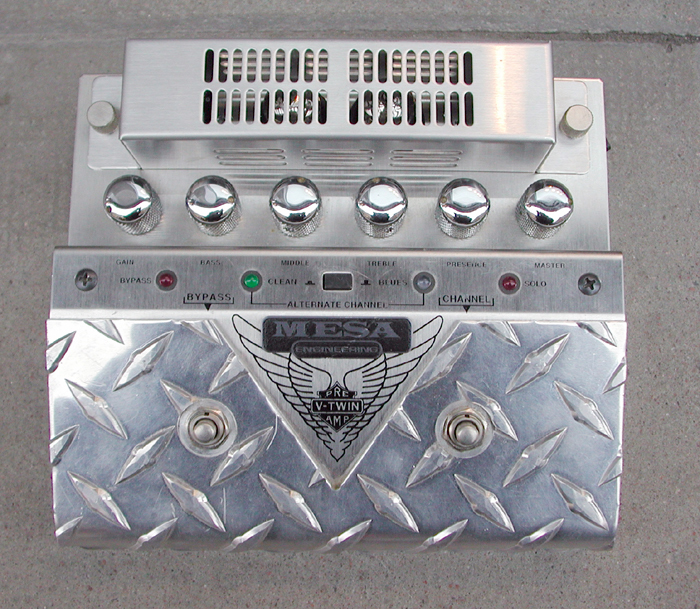 1990s Mesa/Boogie V-Twin Pre Amp, SOLD! Photo How much? Mooer Blue Face, SOLD! Photo How much? Mooer Flex Boost, natural, SOLD! Photo How much? Mooer GE200, SOLD! Photo How much? Mooer Mod Factory, SOLD! Photo How much? Mooer Noice Killer, SOLD! Photo How much? Mooer Preamp 004 Day Tripper, Mocha Brown, SOLD! Photo How much? Mooer Yellow Comp, SOLD! Photo How much? 1970s Morley Model PWF Power Wah, SOLD! Photo How much? Mosky Loop Box, SOLD! Photo How much? 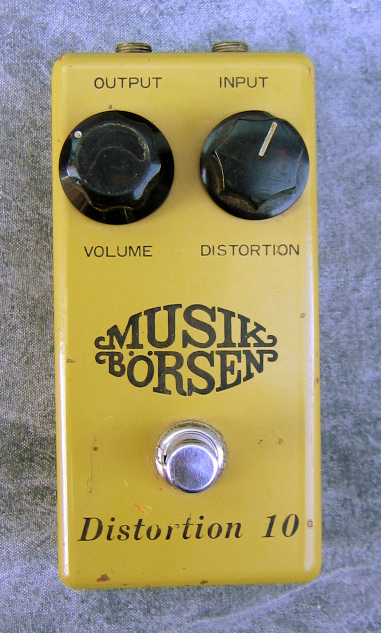 1980s Musikbörsen Distortion 10, MXR Distortion + copy, SOLD! Photo How much? 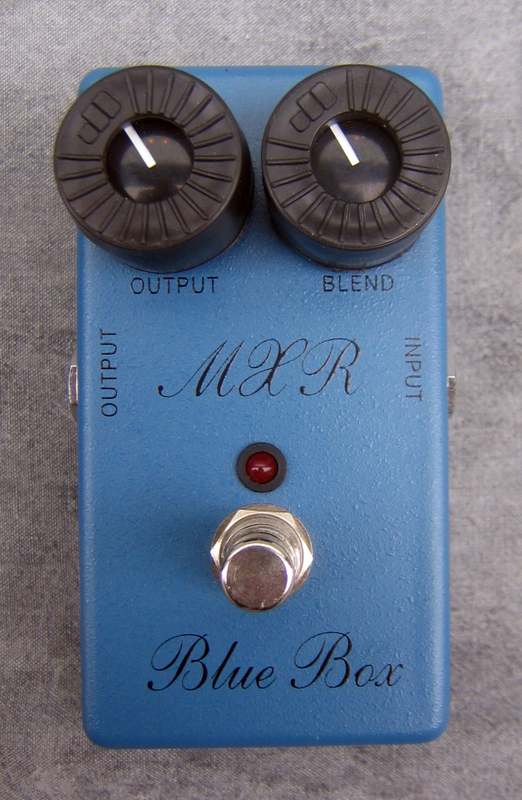 2000s MXR Blue Box, distortion, SOLD! Photo How much? 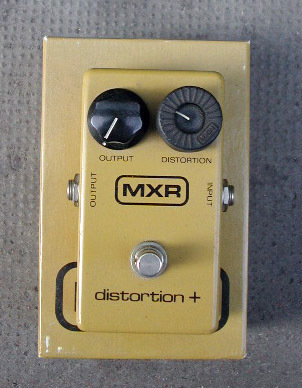 1980 MXR Distortion +, with original box, SOLD! Photo How much? 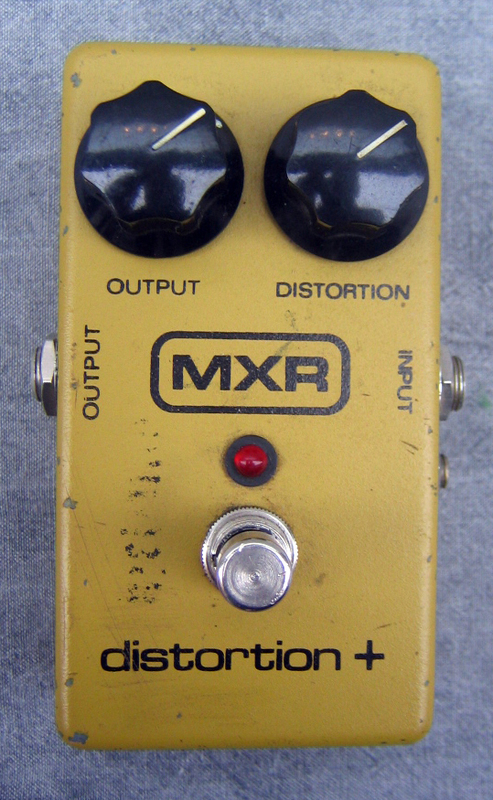 1981 MXR Distortion +, SOLD! Photo How much? 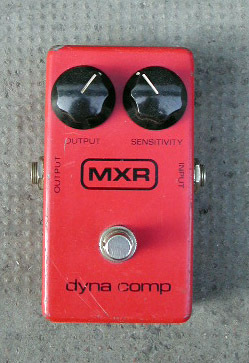 1977 MXR Dyna Comp, compressor, SOLD! Photo How much? 1980 MXR Dyna Comp, compressor, SOLD! Photo How much? 1980s MXR Loop Selector, SOLD! Photo How much? 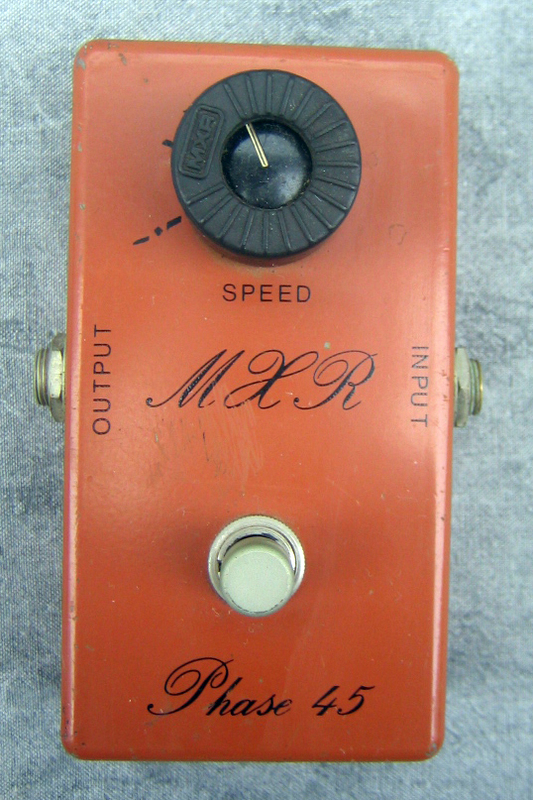 1975 MXR Phase 45, phaser, SOLD! Photo How much? Osterman Trouble Booster, SOLD! Photo How much? Pearl TC-103 tuner, SOLD! Photo How much? 1987 Pro Co RAT, distortion, SOLD! Photo How much? 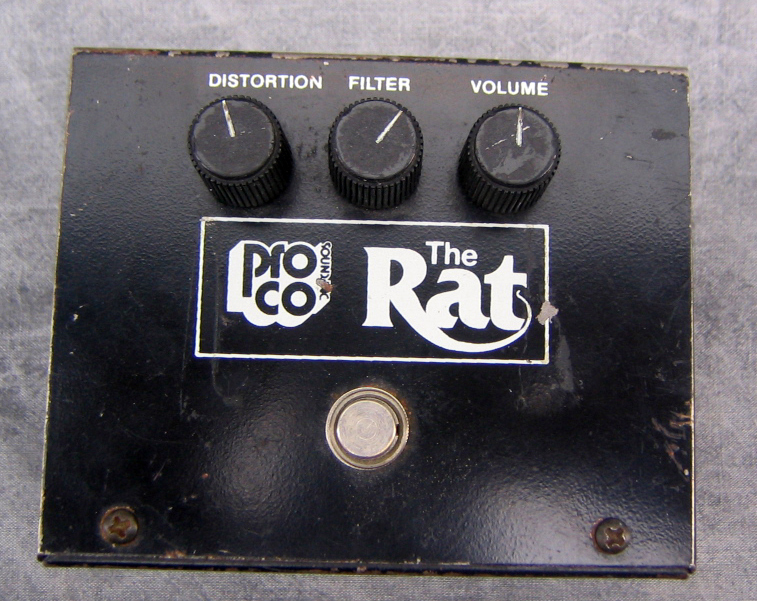 1983 ProCo The Rat, distortion, SOLD! Photo How much? 2010 Radial Tonebone Trimode, SOLD! Photo How much? Rockett GTO OD, natural, SOLD! Photo How much? 1987 Roger Mayer Moongoose Fuzz, SOLD! Photo How much? 1981 Roland GR-300, synth module, SOLD! Photo How much? 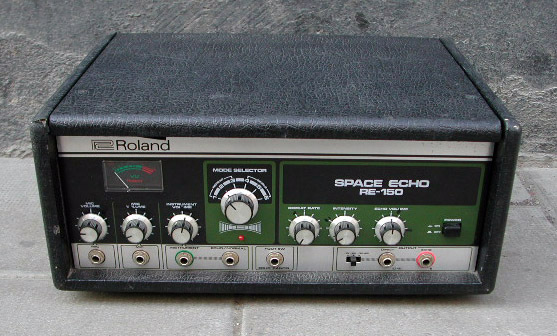 1970s Roland Space Echo RE-150, SOLD! Photo How much? 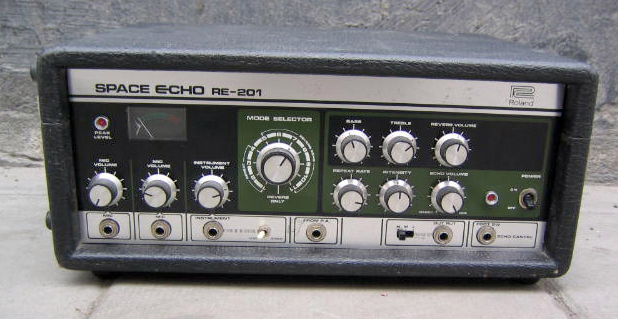 1970s Roland Space Echo RE-201, SOLD! Photo How much? Rowin Mini Pedal G-Fuzz, SOLD! Photo How much? 1980s Schaller Wha-Wha, SOLD! Photo How much? 1950s Sela pickups, SOLD! Photo How much? 1970s Shaftesbury DuoFuzz, fuzz, SOLD! Photo How much? 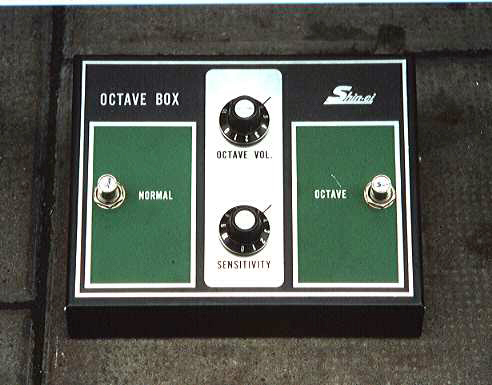 1970s Shin-Ei Octave Box, SOLD! Photo How much? 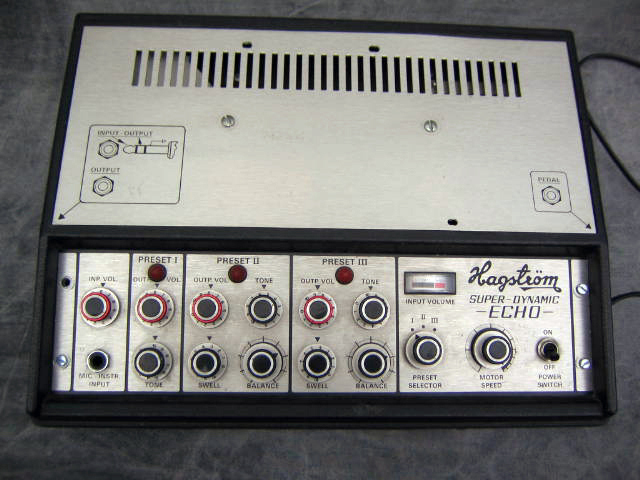 1980s Soundcraft EM-006 Analog Echo, SOLD! Photo How much? Source Audio Programmable EQ, synth module, SOLD! Photo How much? Strymon El Capistan dTape Echo, red, SOLD! Photo How much? Strymon Sunset Dual Overdrive, natural, SOLD! Photo How much? Strymon Timeline, SOLD! Photo How much? TC Electronic Flashback, SOLD! Photo How much? TC Electronic Mojo Mojo, overdrive, SOLD! Photo How much? 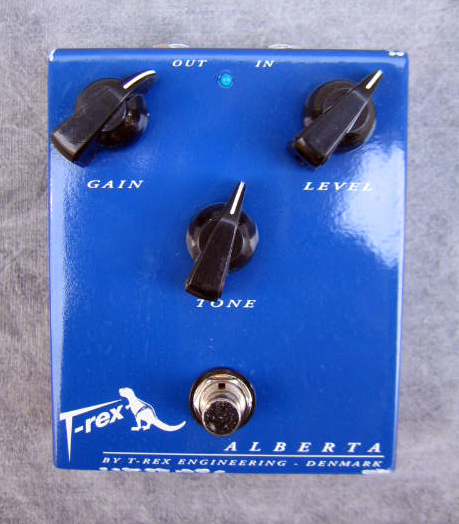 2000s T-Rex Alberta, distortion, SOLD! Photo How much? 2013 TC Electronic Spark Mini, boost, SOLD! Photo How much? Tech 21 SansAmp GT2, natural, SOLD! Photo How much? Vertex Steel String Clean Drive, SOLD! Photo How much? Voodo LAb Micro Vibe, Antique Natural, SOLD! Photo How much? 1968 Vox Jaguar Model V-304E Organ, SOLD! Photo How much? 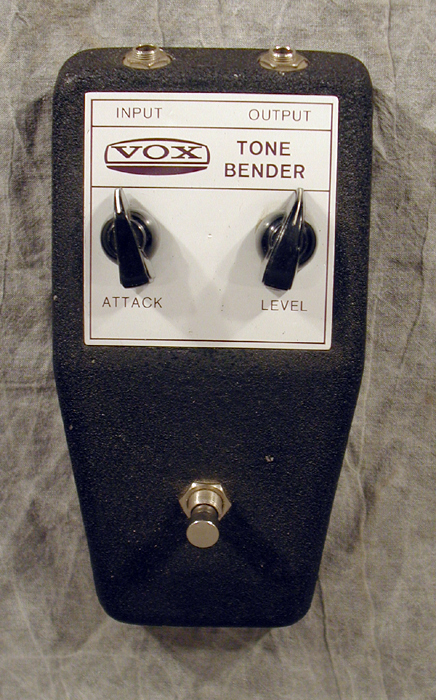 1970s Vox Tone Bender, SOLD! Photo How much? 2010 Vox Tonelab EX, brown, SOLD! Photo How much? 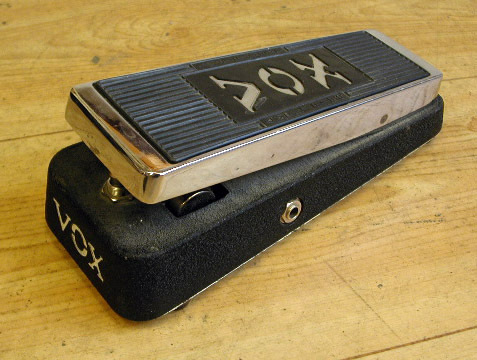 1970s Vox Wah-wah, SOLD! Photo How much? Wampler Plexi Drive, SOLD! Photo How much? Way Huge Blue Hippo Analog Chorus MKII, SOLD! Photo How much? 2012 Yamaha Magicstomp Acoustic UB99AH, SOLD! Photo How much? 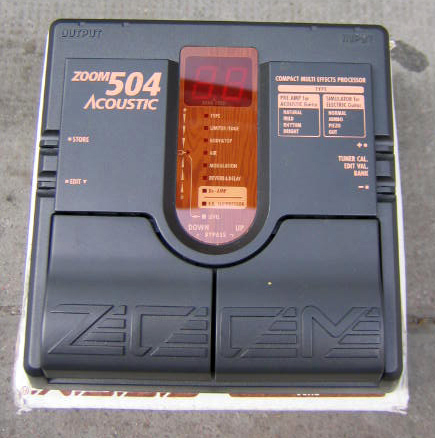 2000s Zoom 504 Acoustic, SOLD! Photo How much? Zoom B1on, natural, SOLD! Photo How much? Zoom G2 1u, natural, SOLD! Photo How much? iRig Acoustic Stage, SOLD! Photo How much?